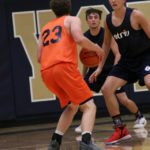 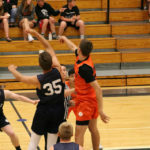 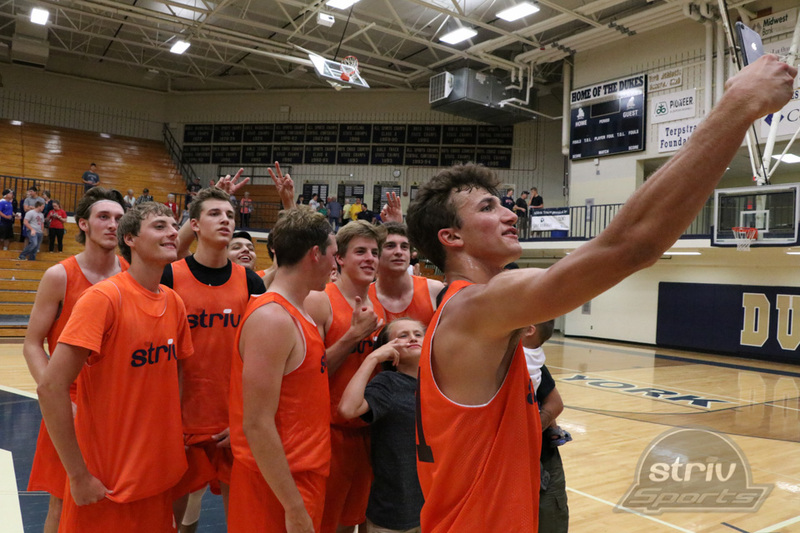 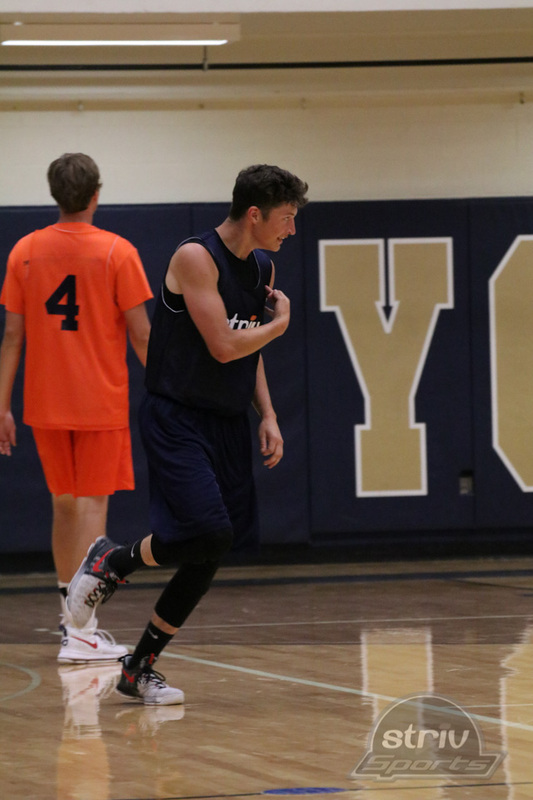 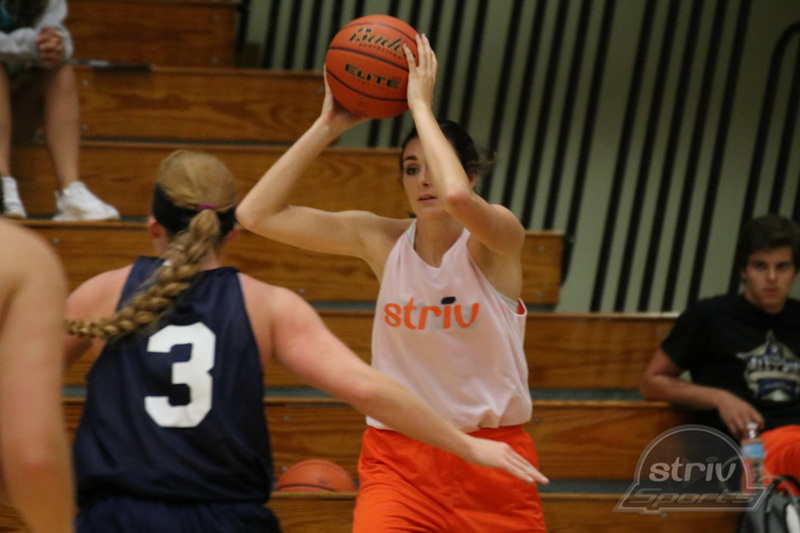 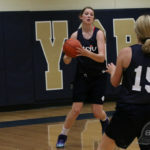 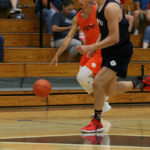 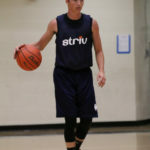 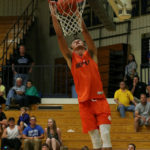 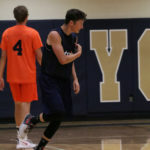 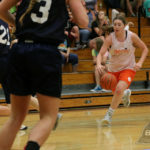 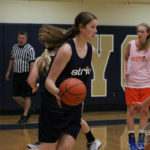 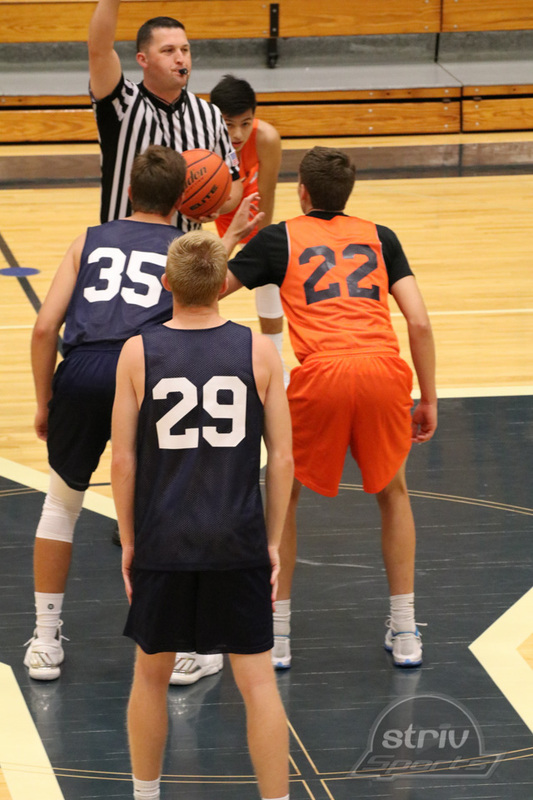 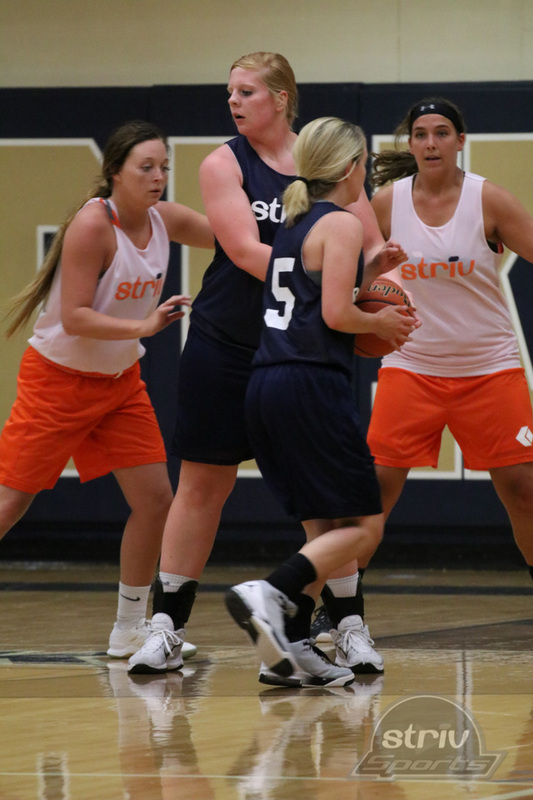 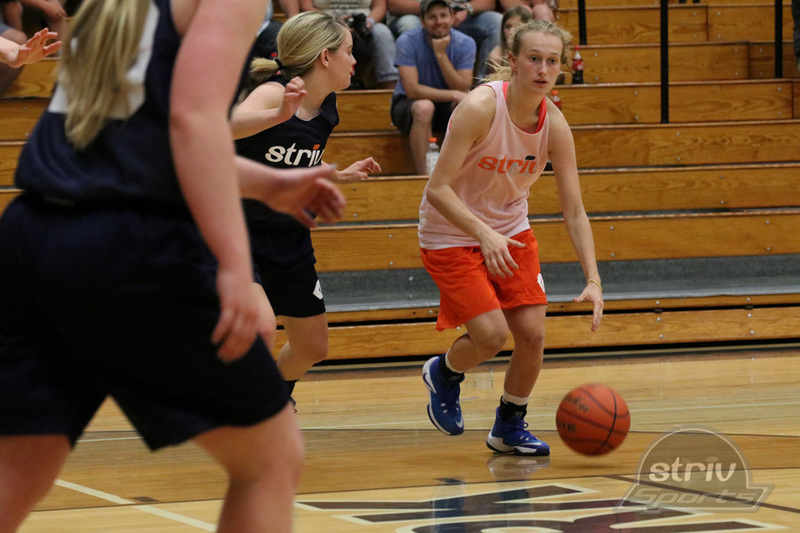 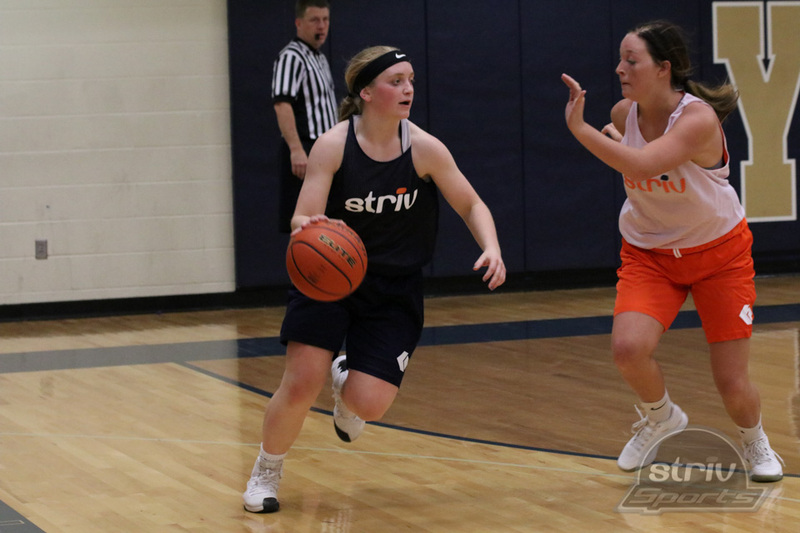 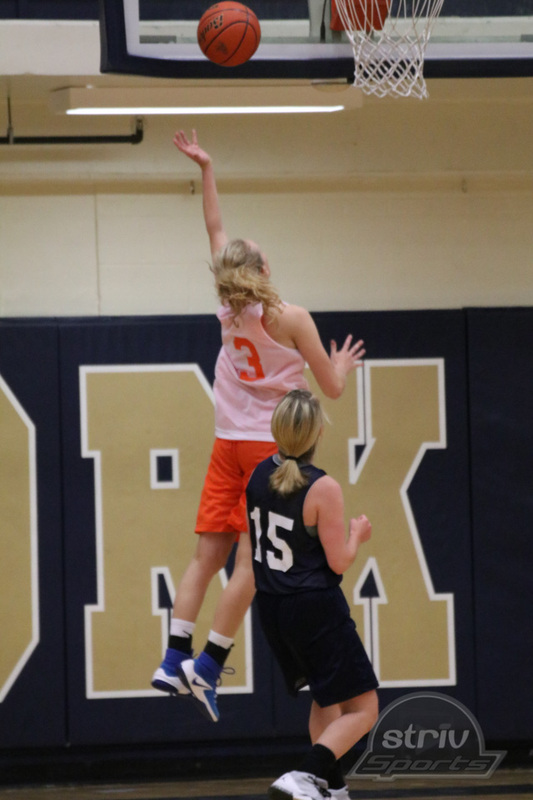 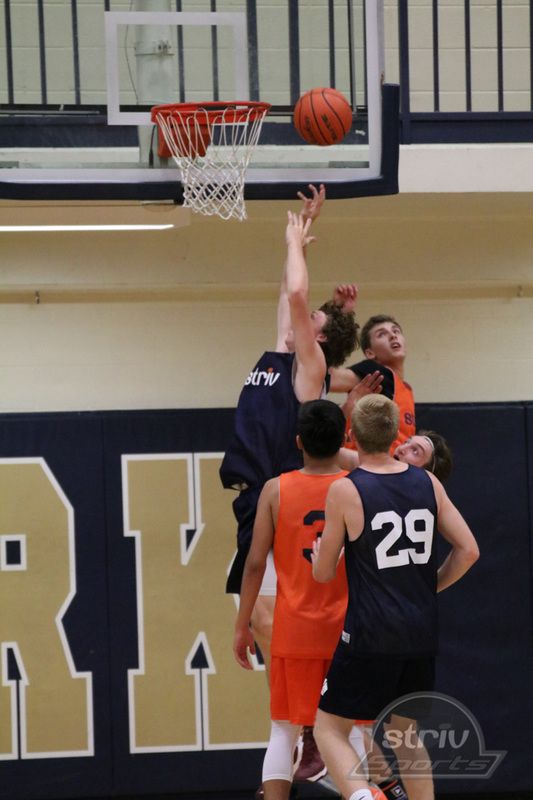 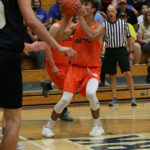 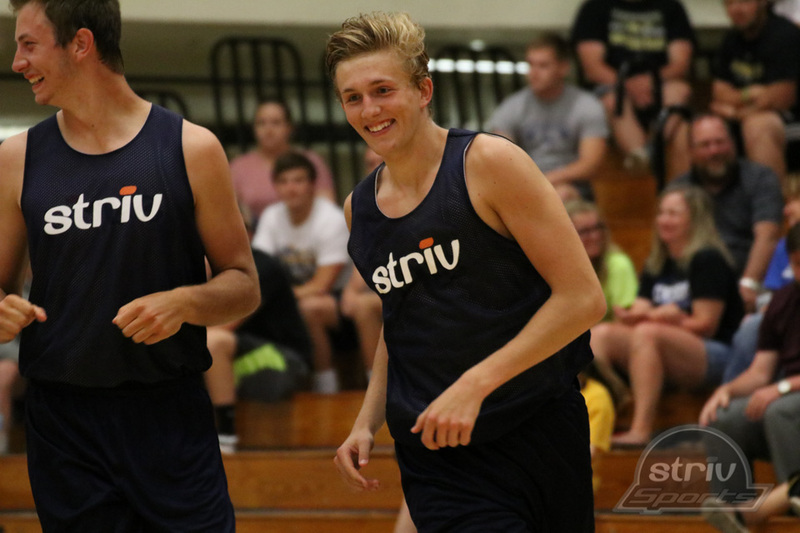 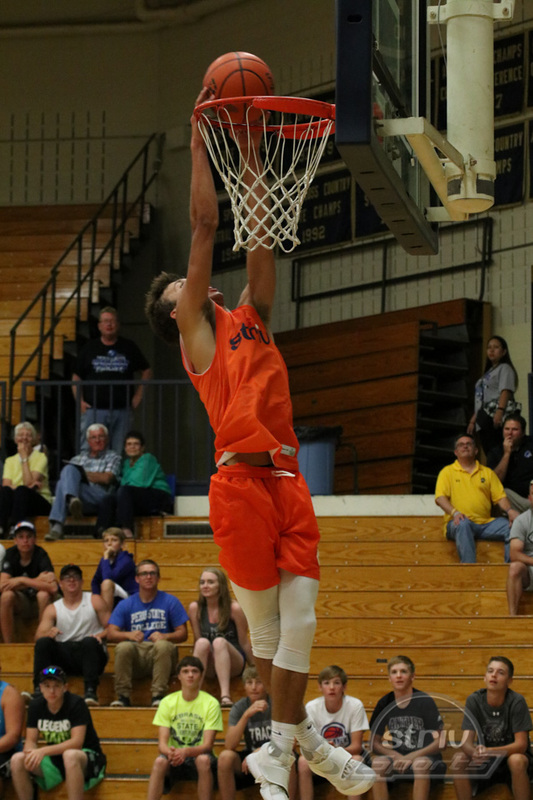 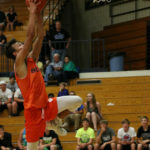 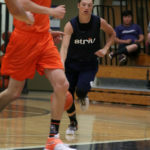 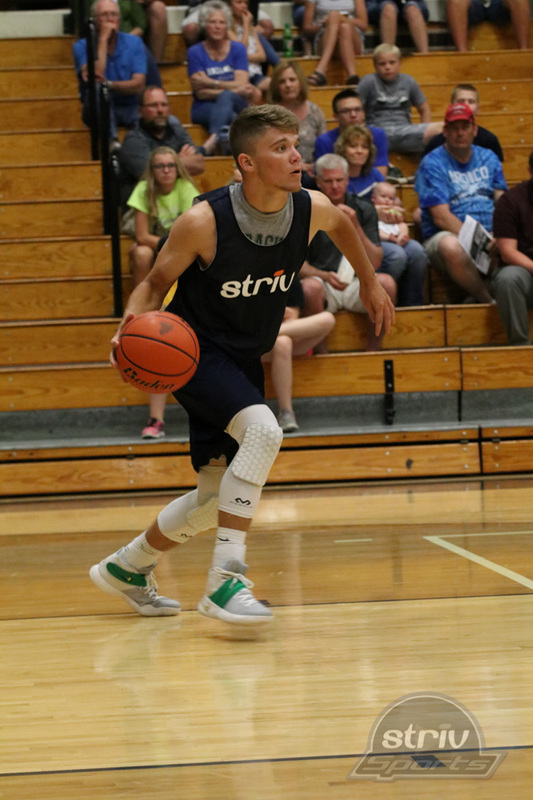 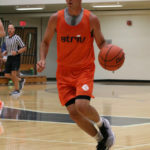 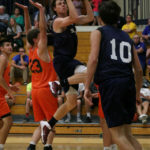 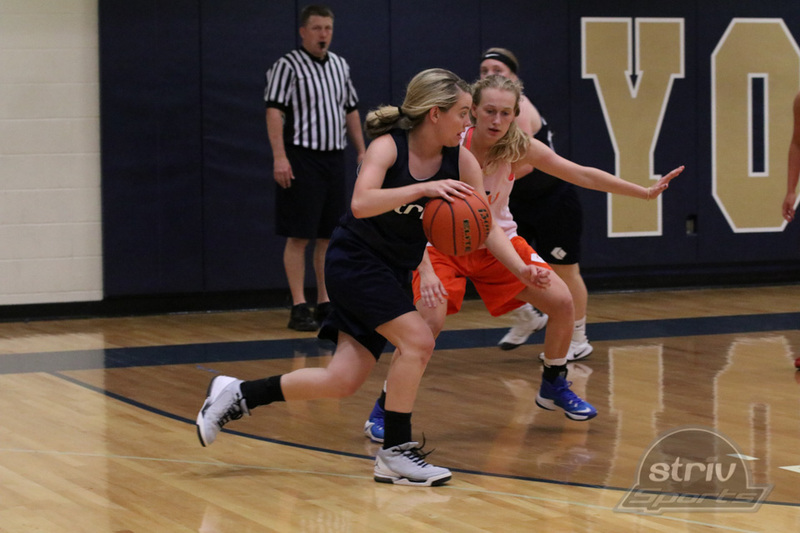 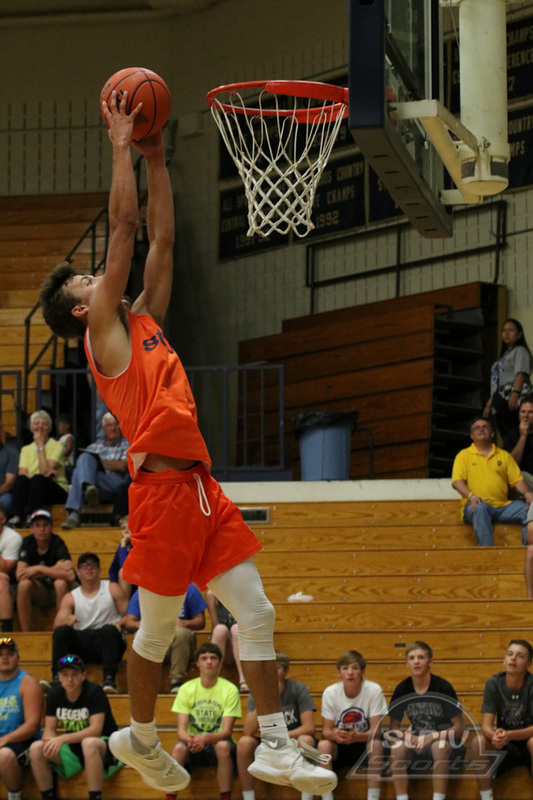 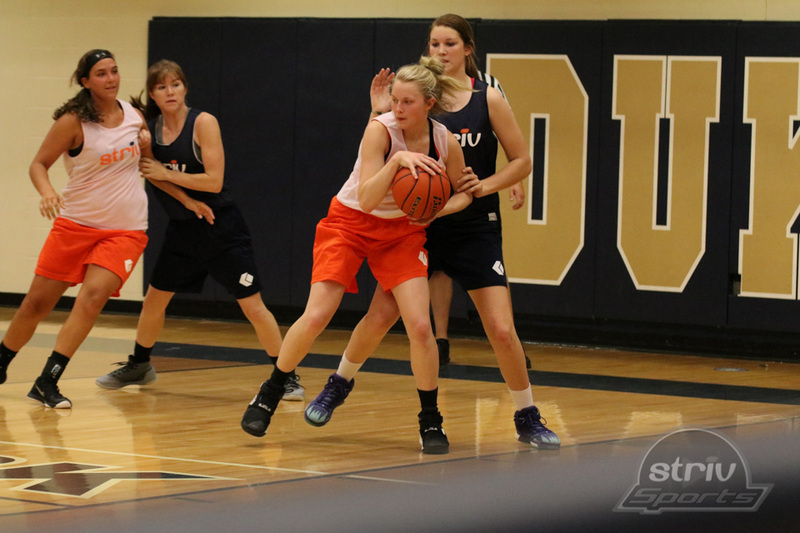 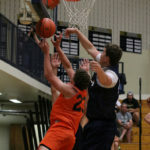 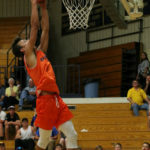 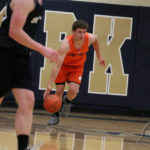 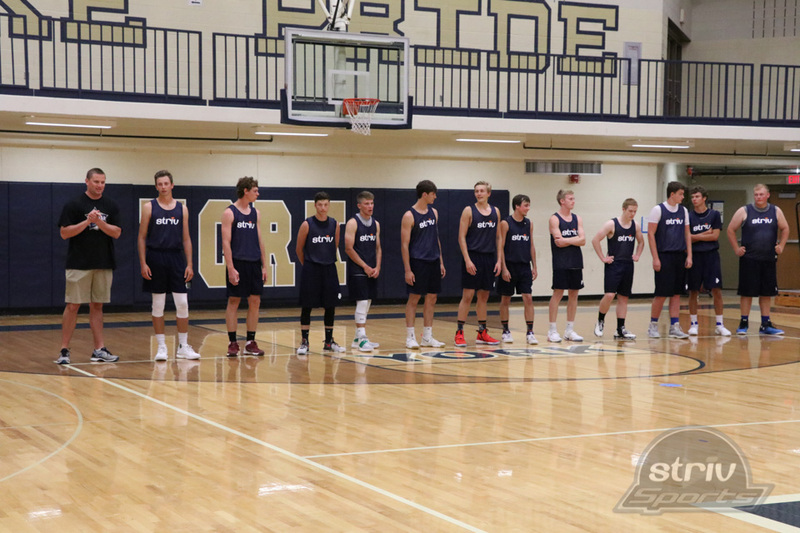 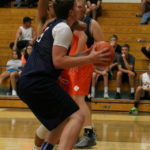 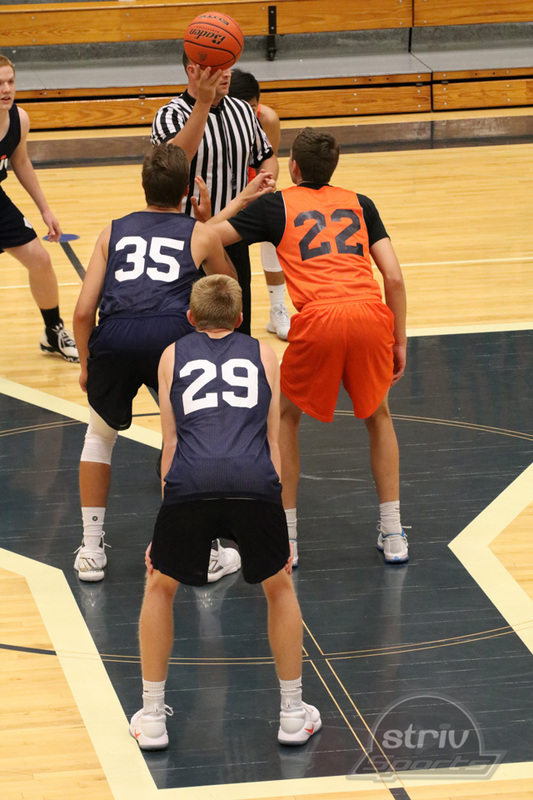 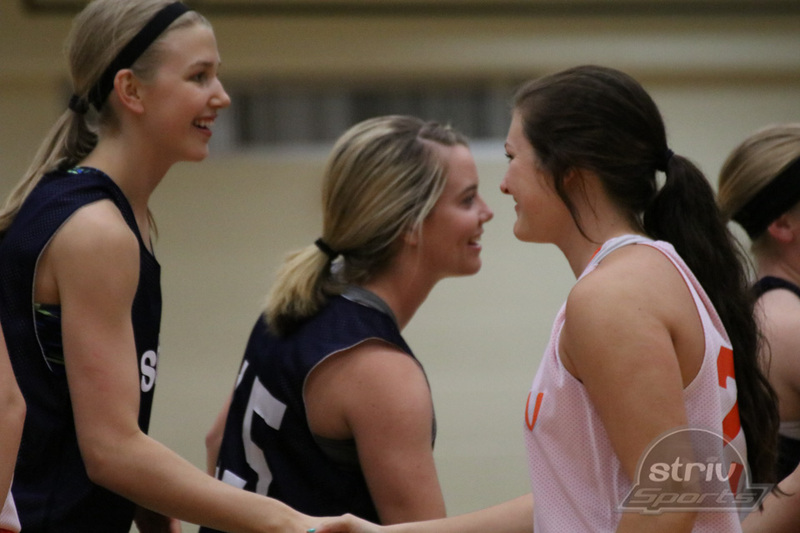 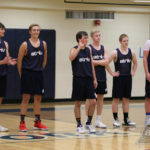 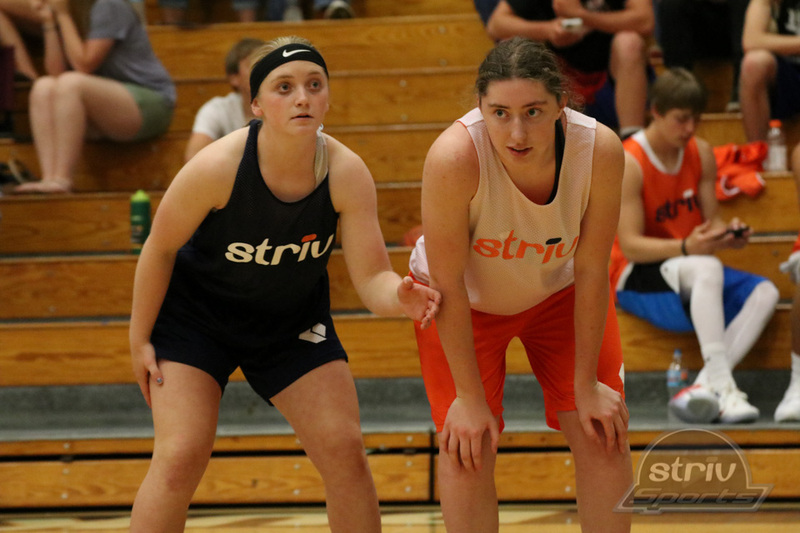 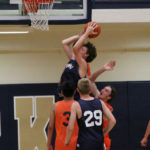 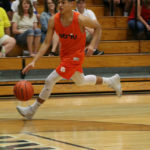 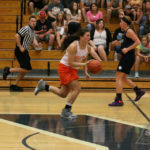 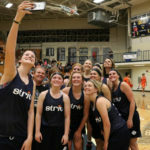 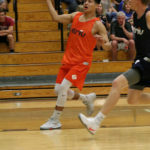 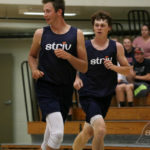 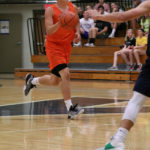 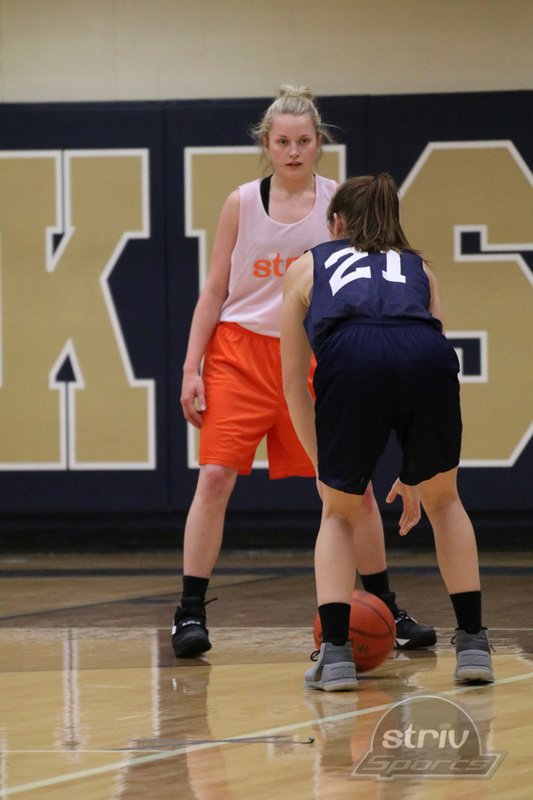 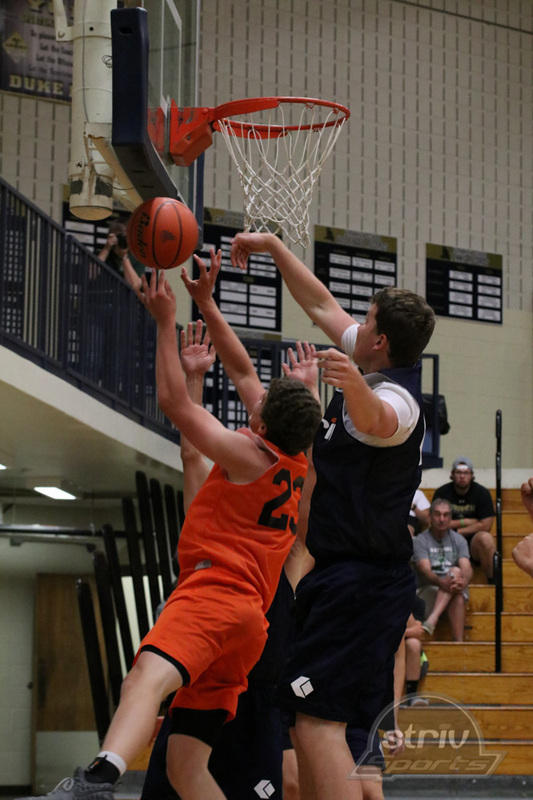 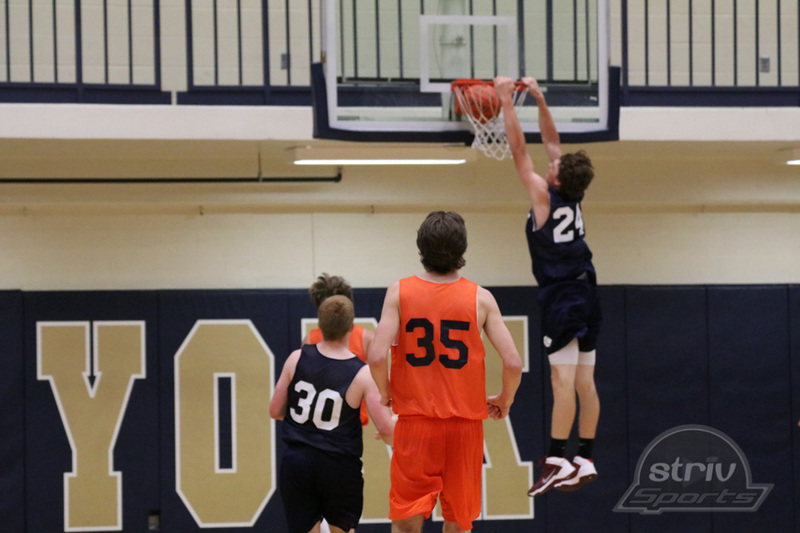 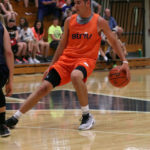 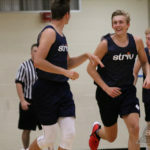 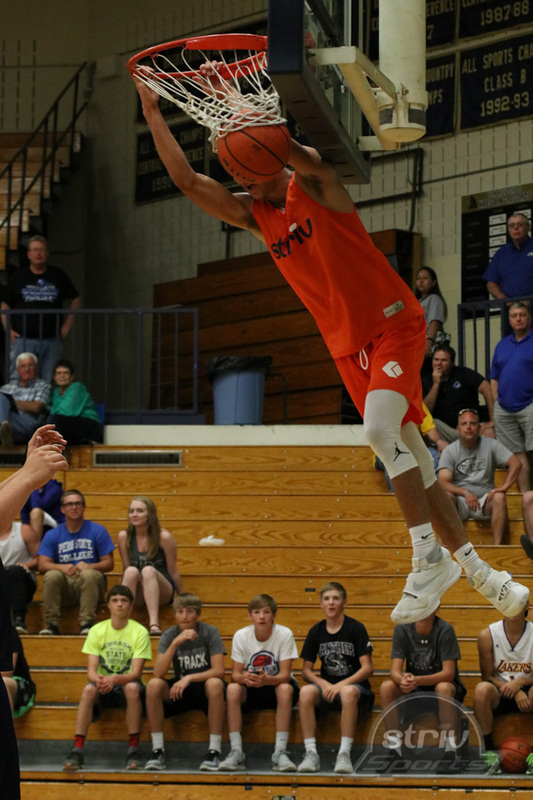 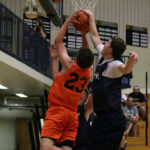 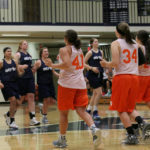 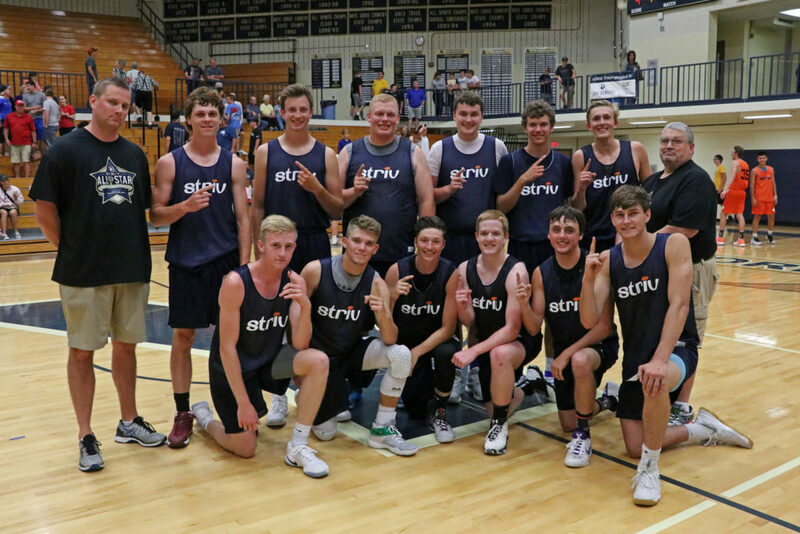 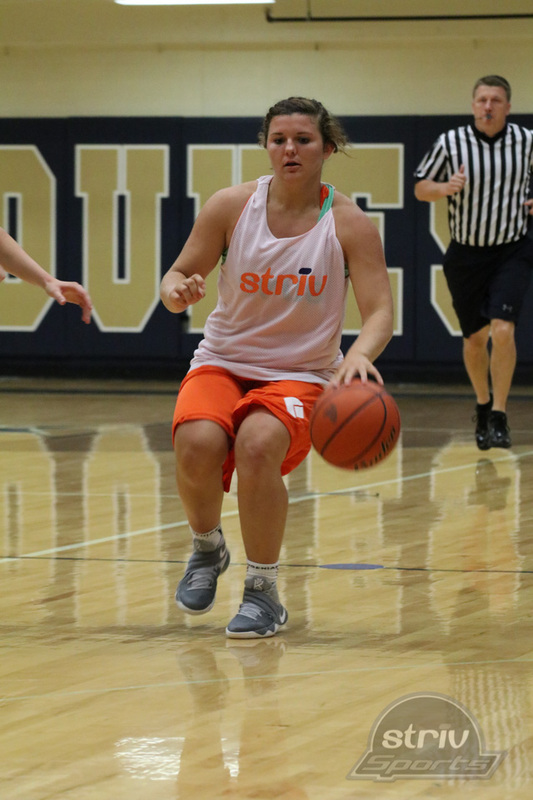 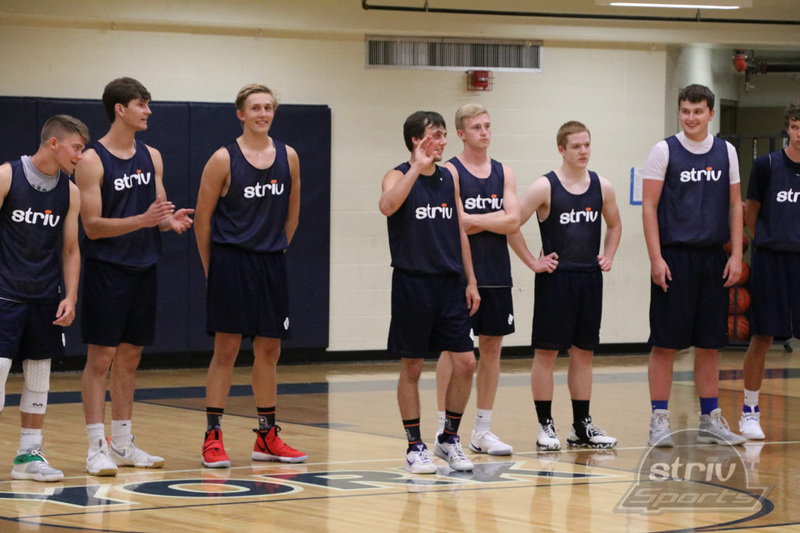 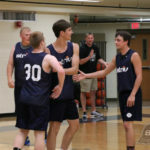 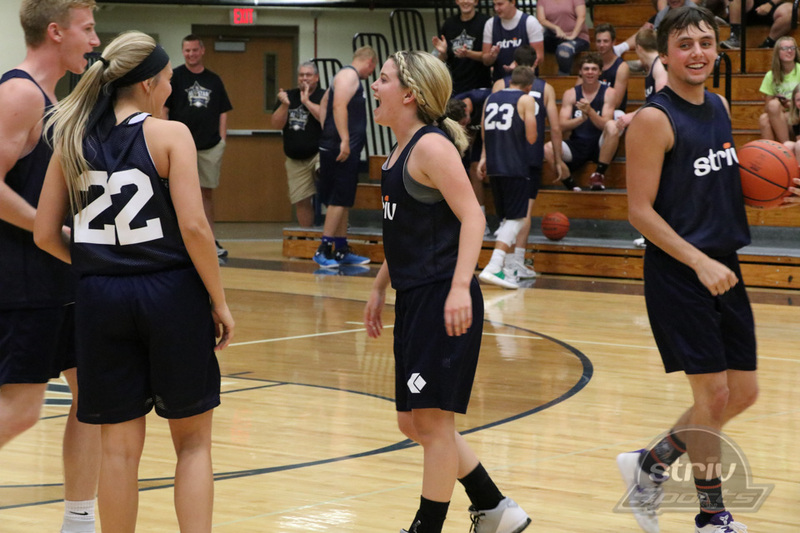 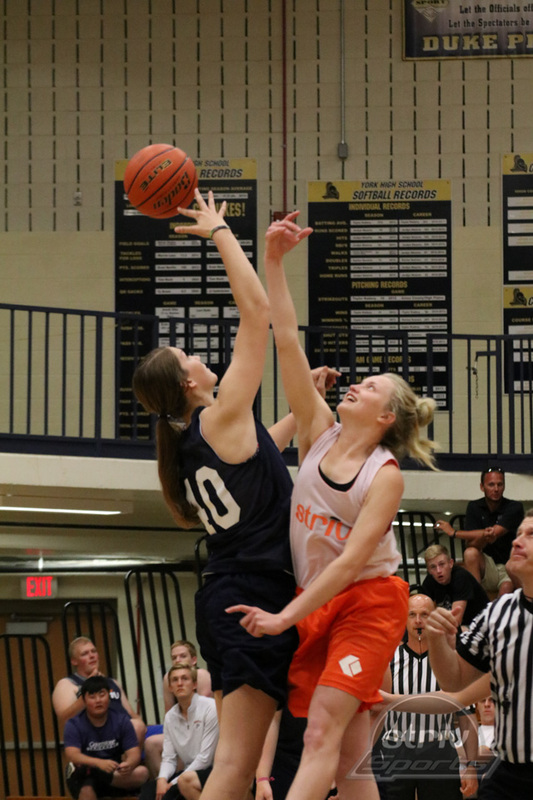 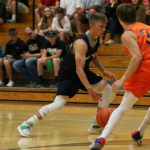 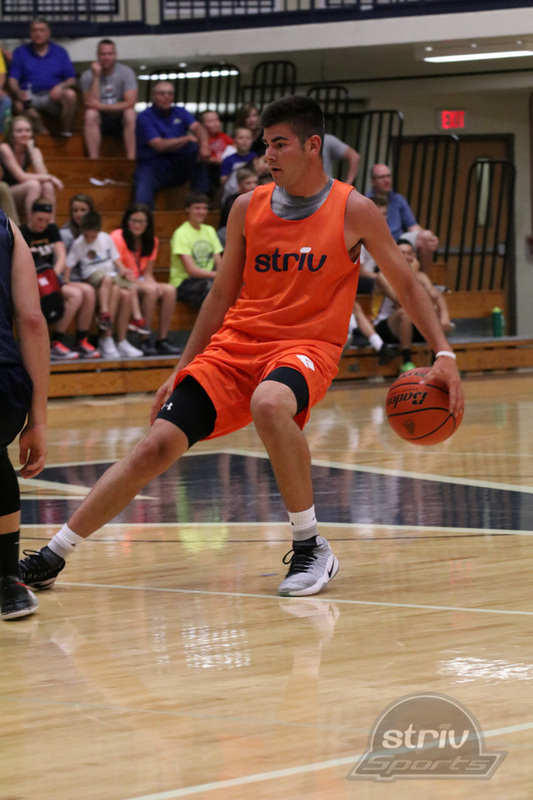 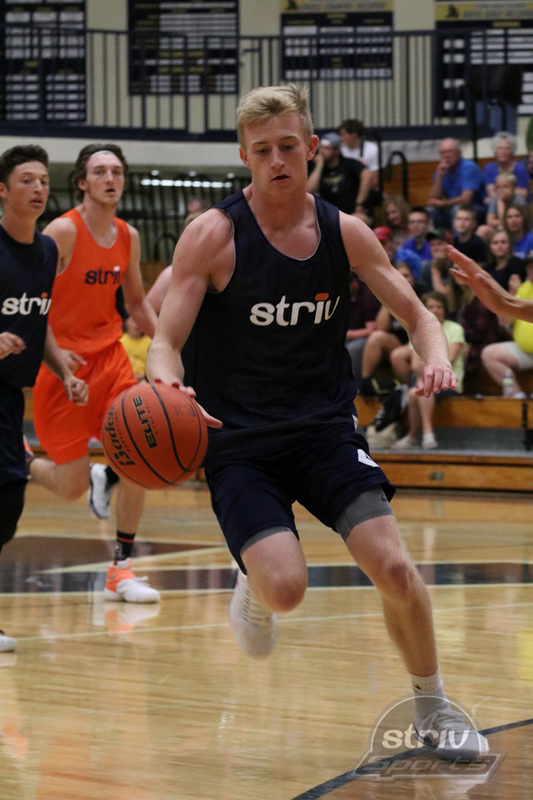 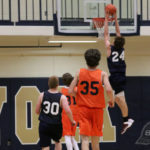 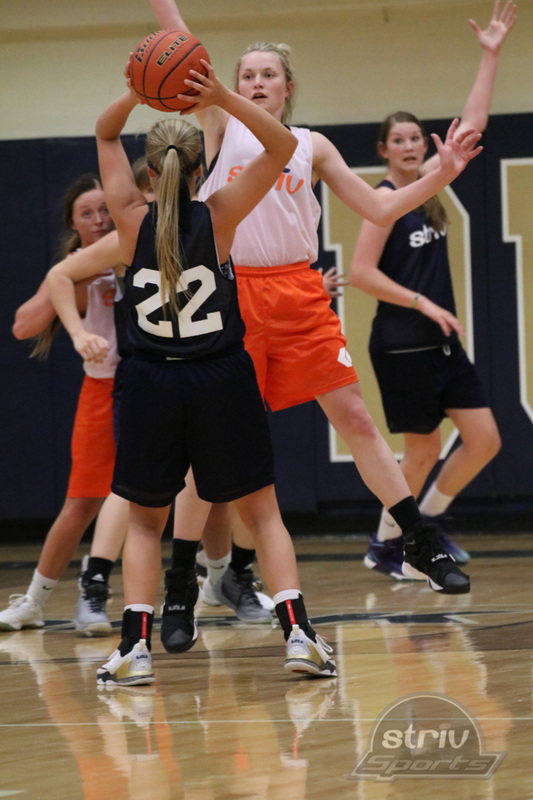 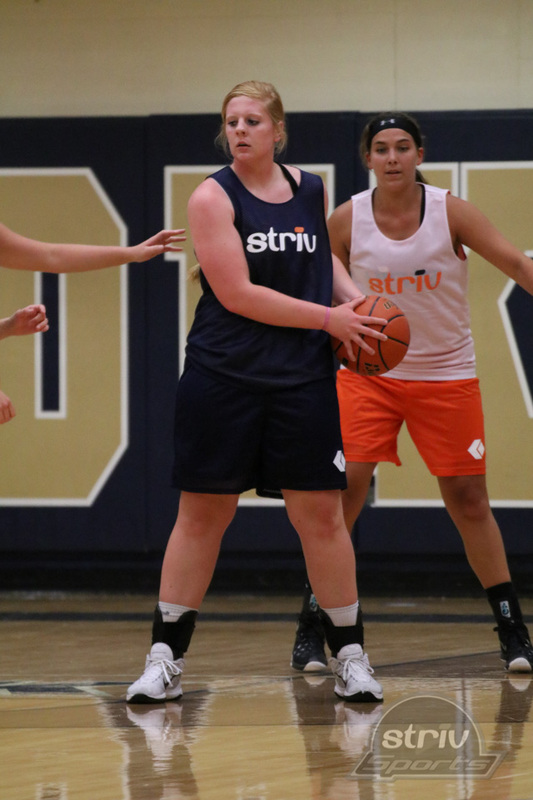 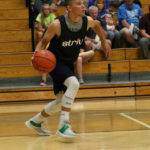 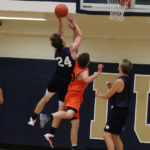 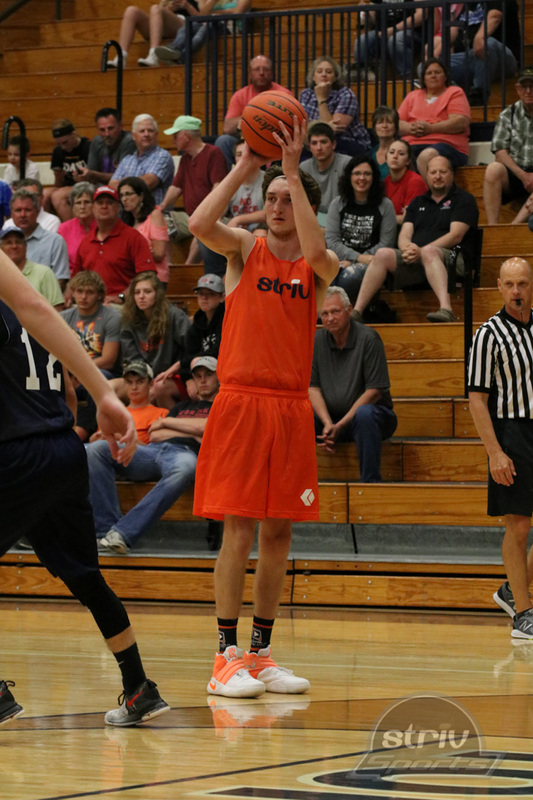 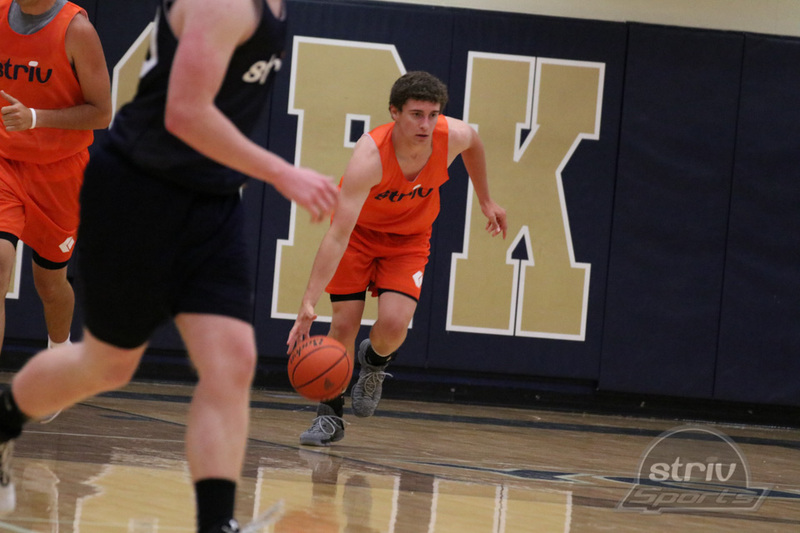 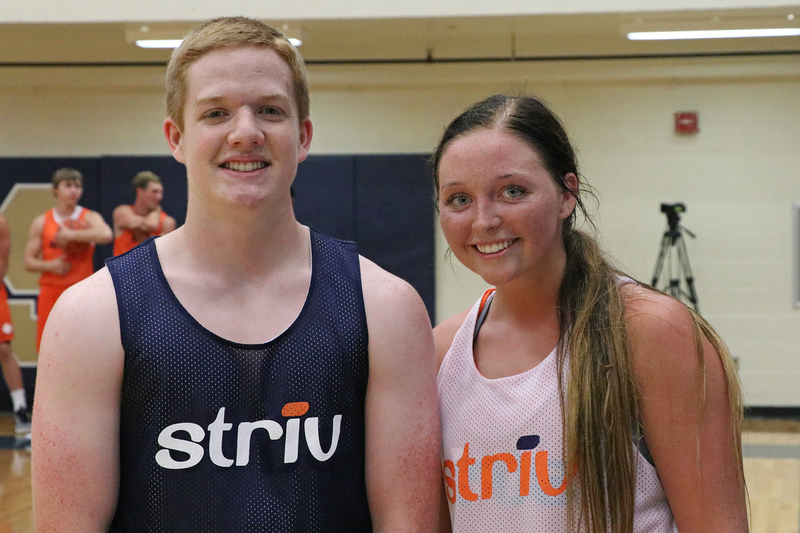 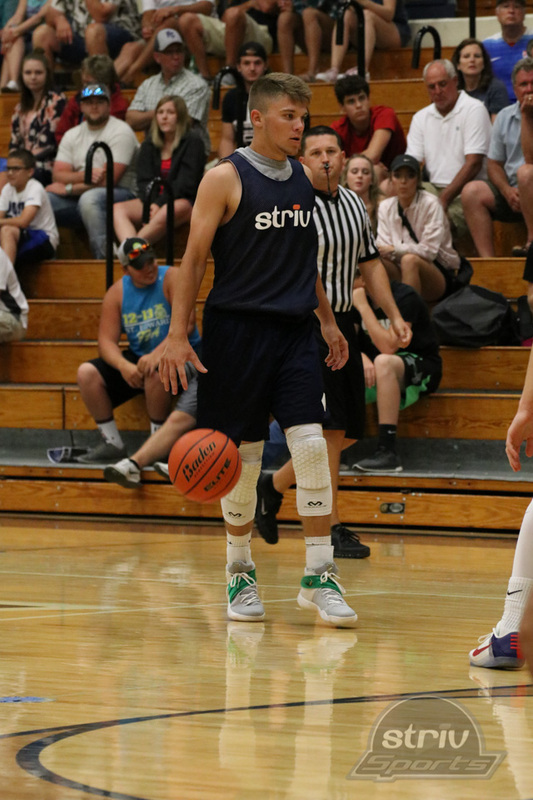 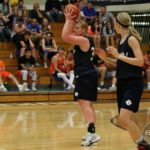 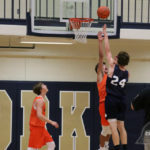 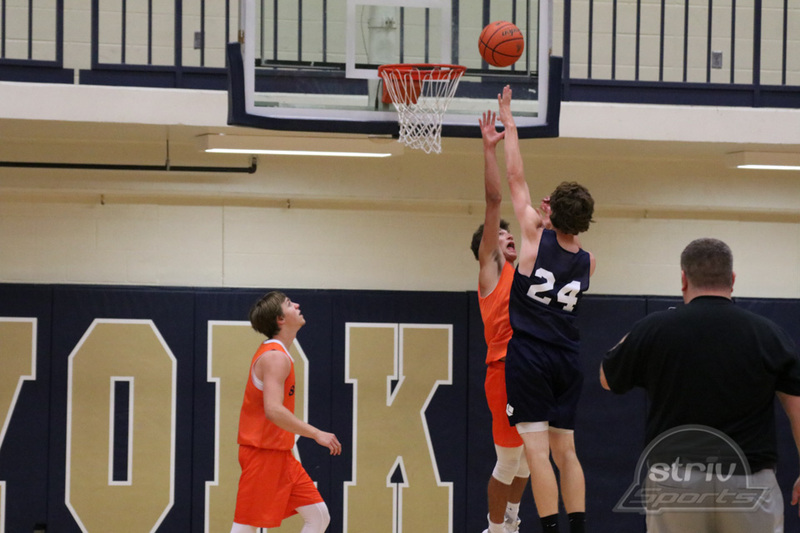 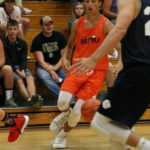 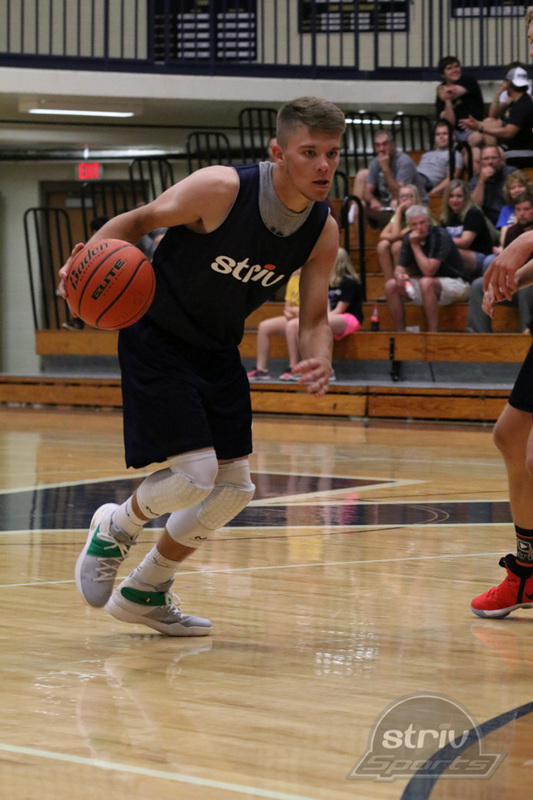 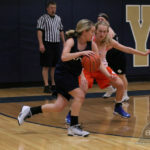 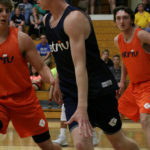 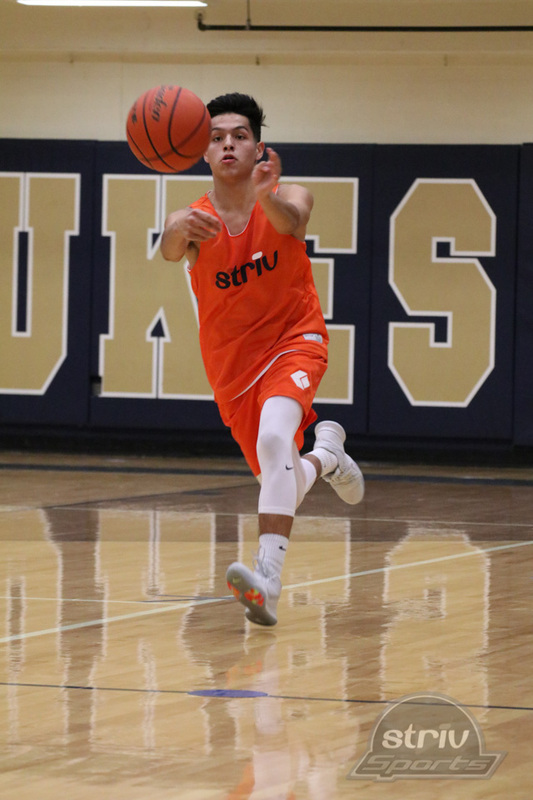 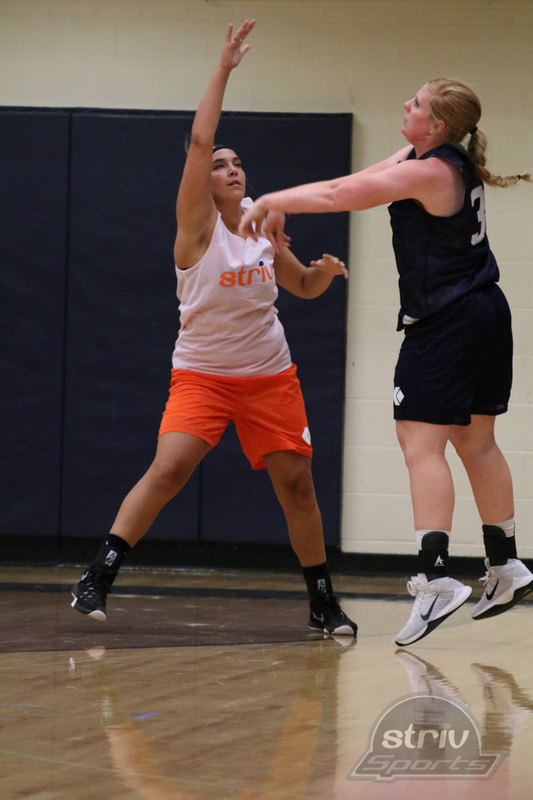 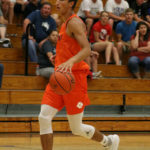 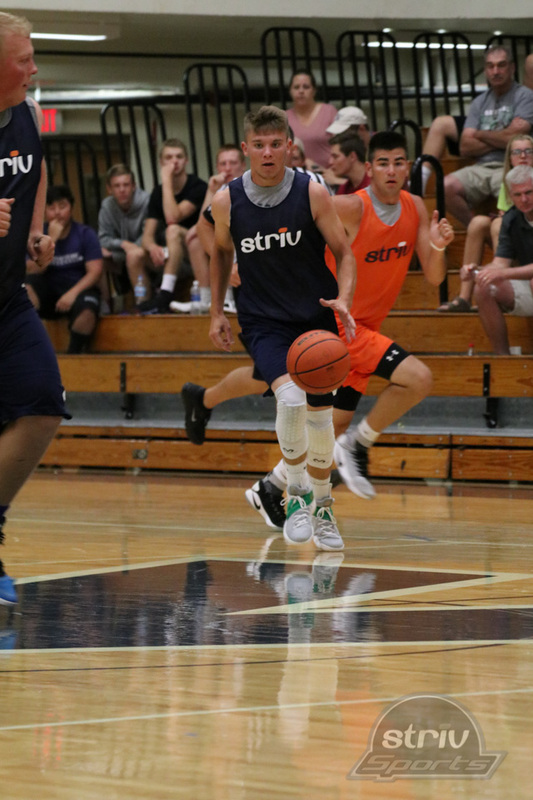 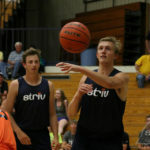 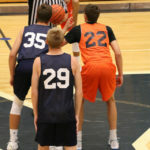 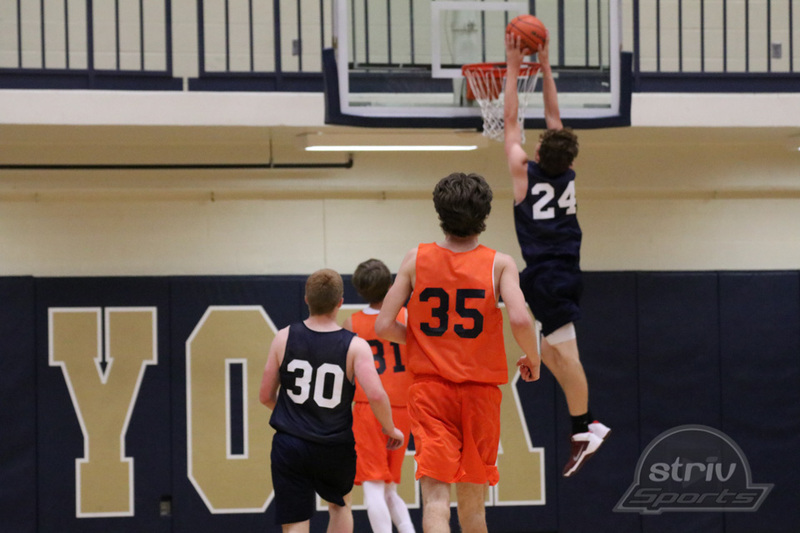 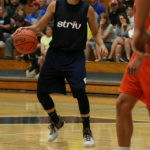 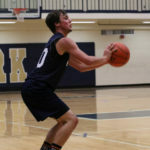 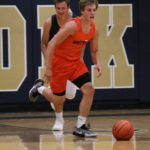 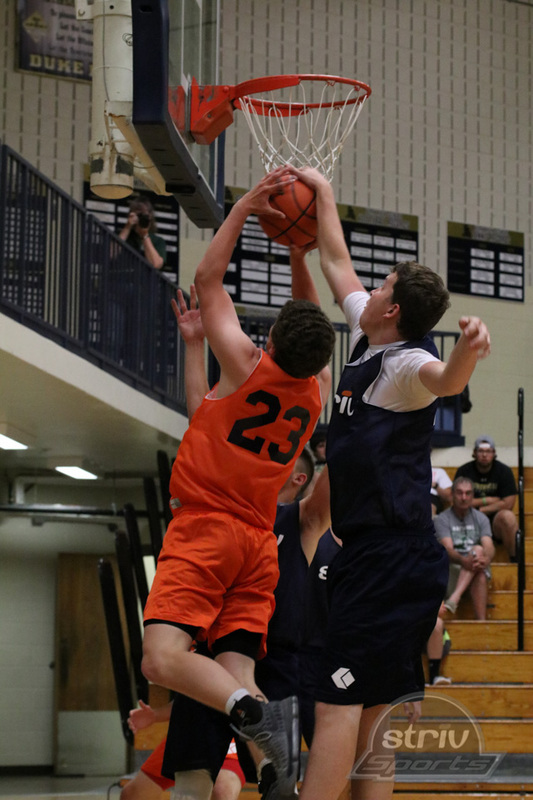 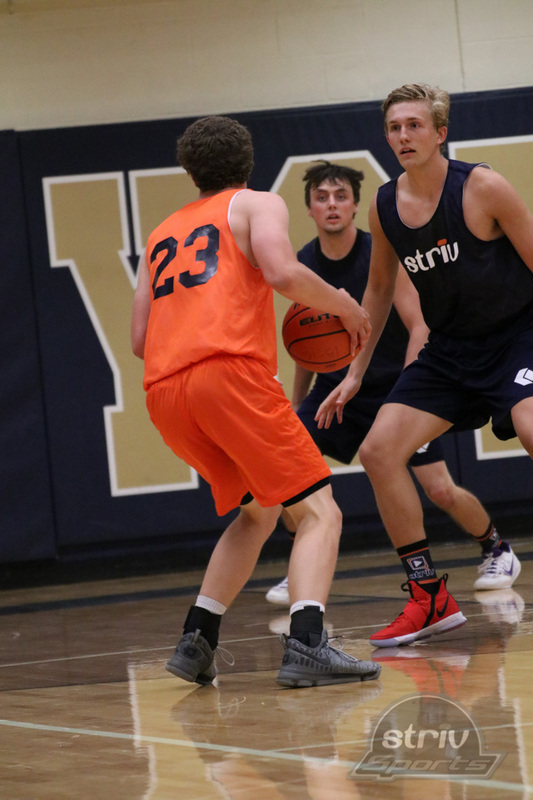 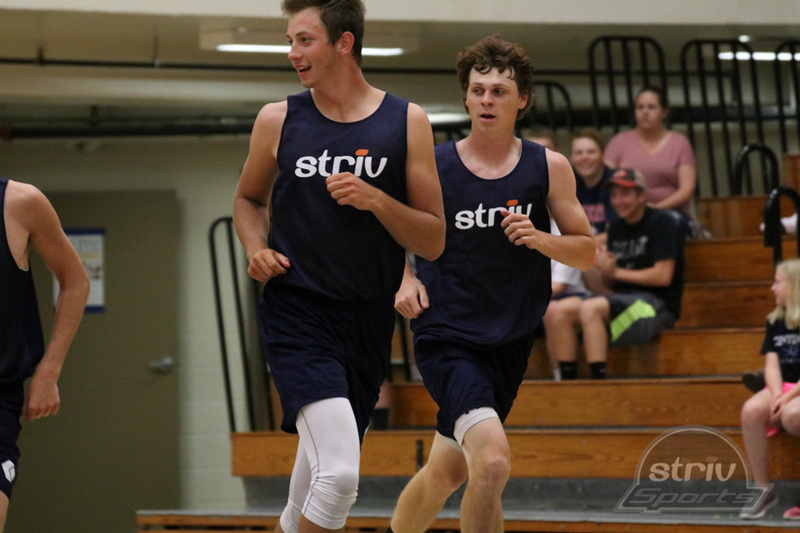 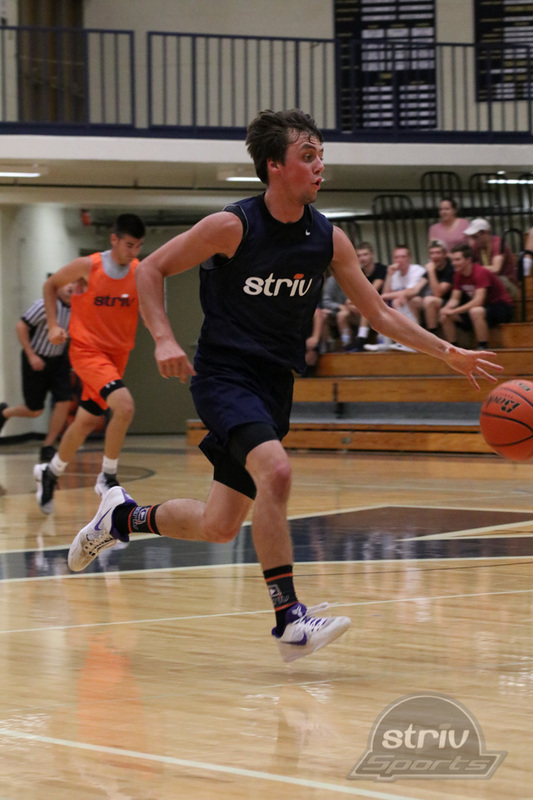 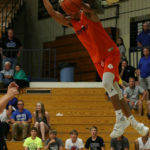 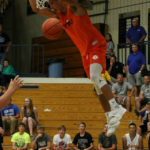 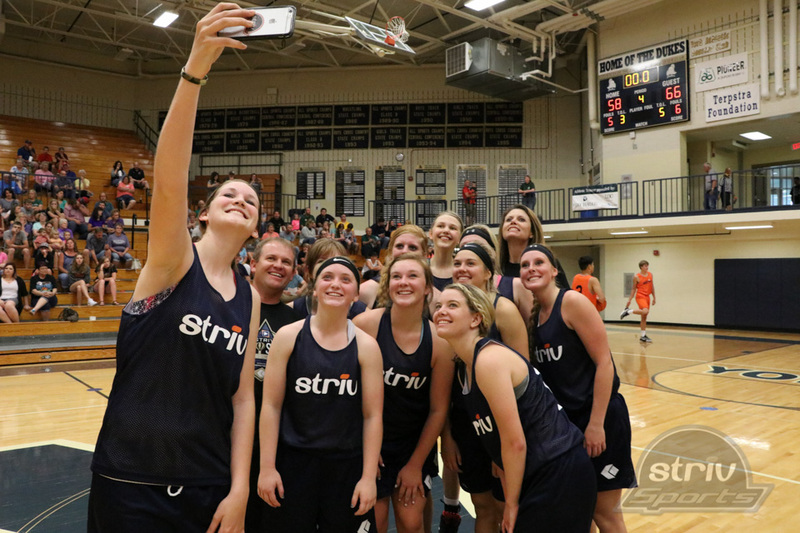 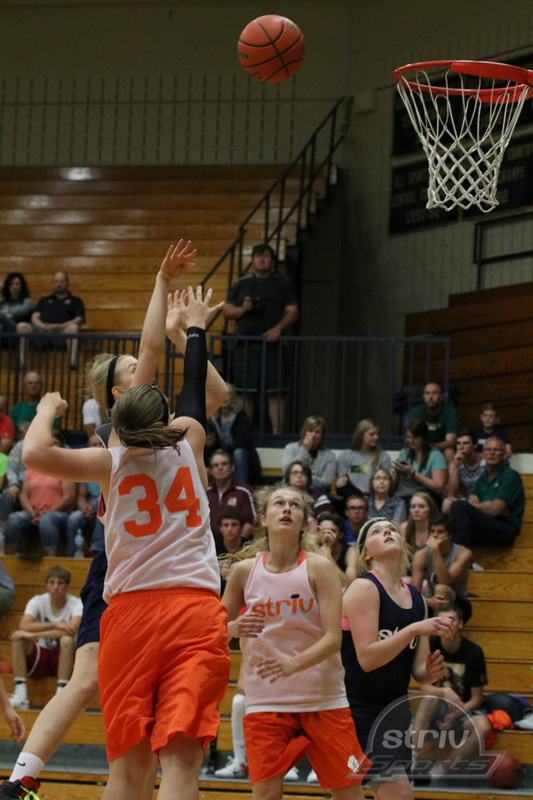 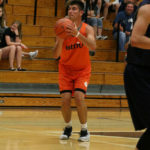 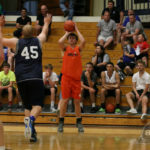 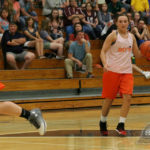 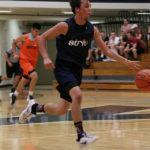 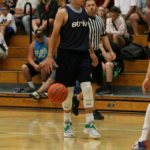 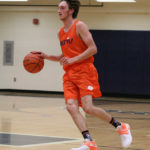 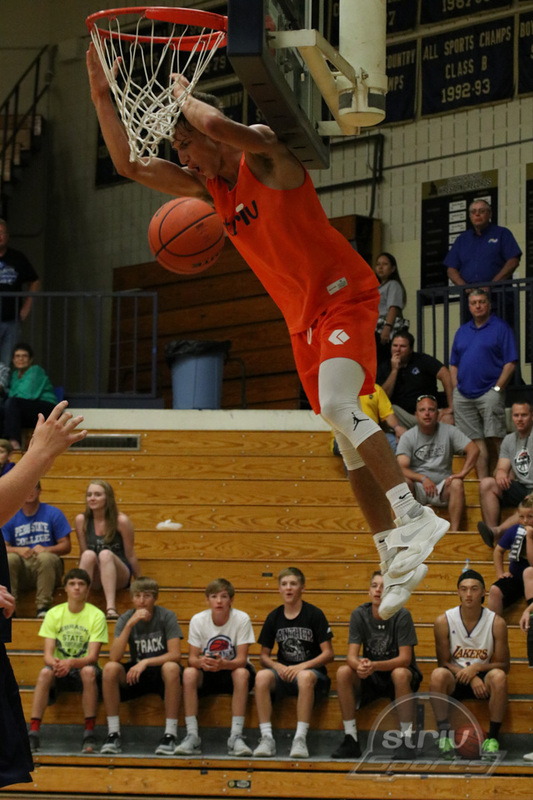 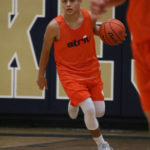 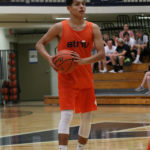 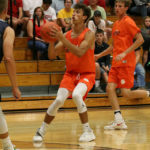 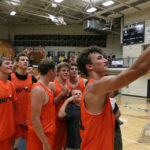 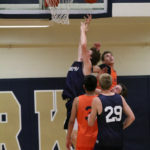 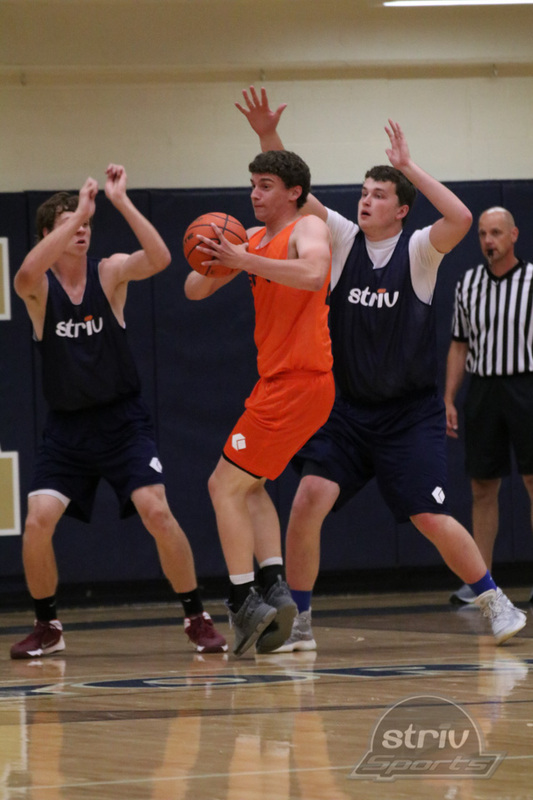 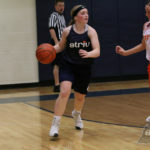 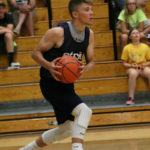 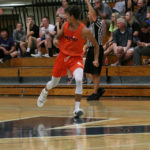 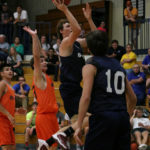 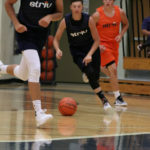 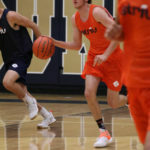 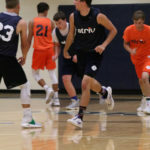 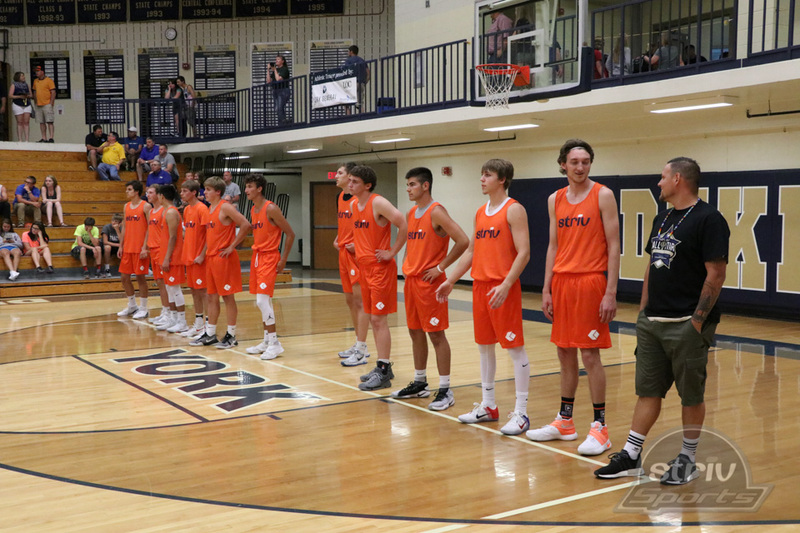 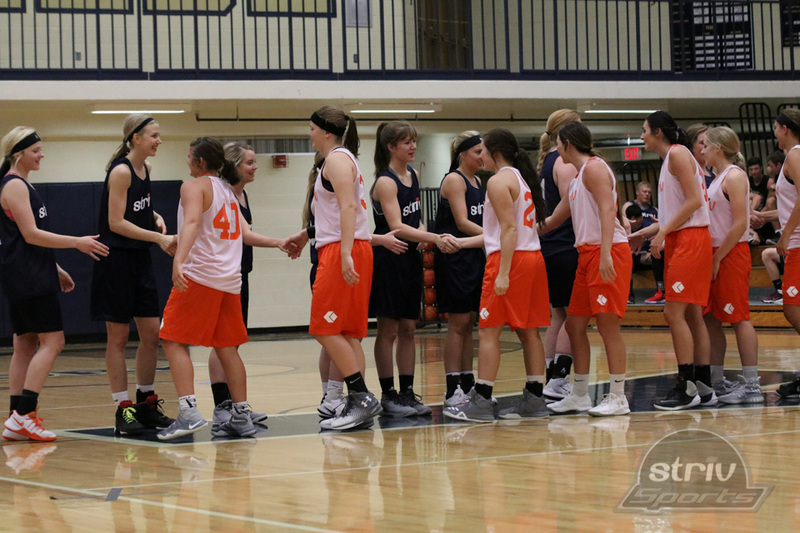 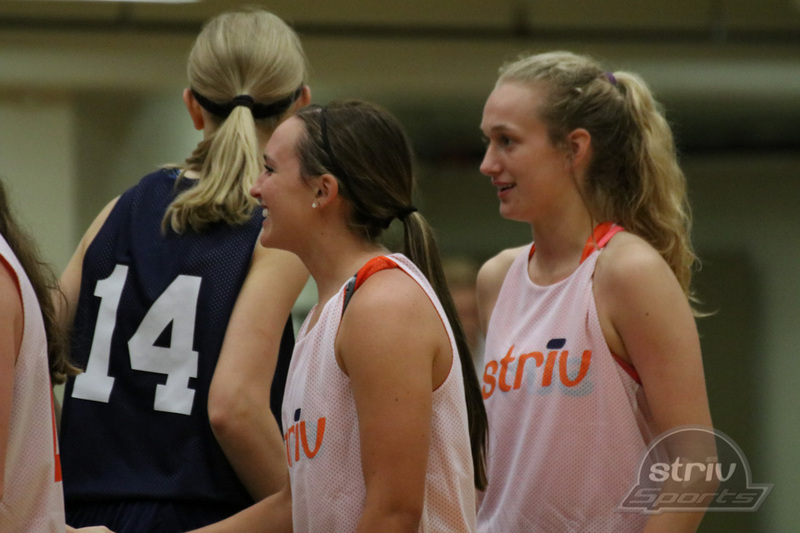 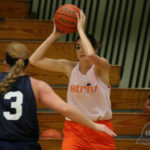 YORK — Blue was the winning color on Saturday night as both of their all-star teams defeated the Orange during the 2017 Striv All-Star Games at York High School. 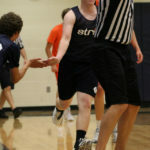 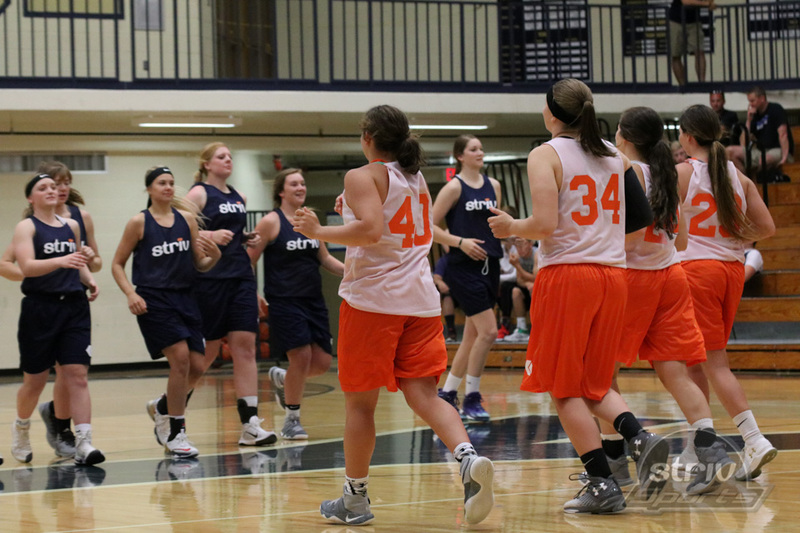 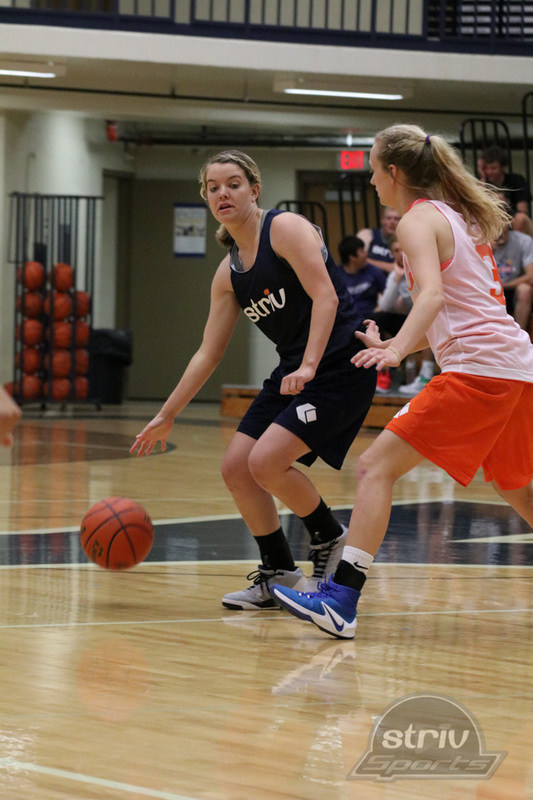 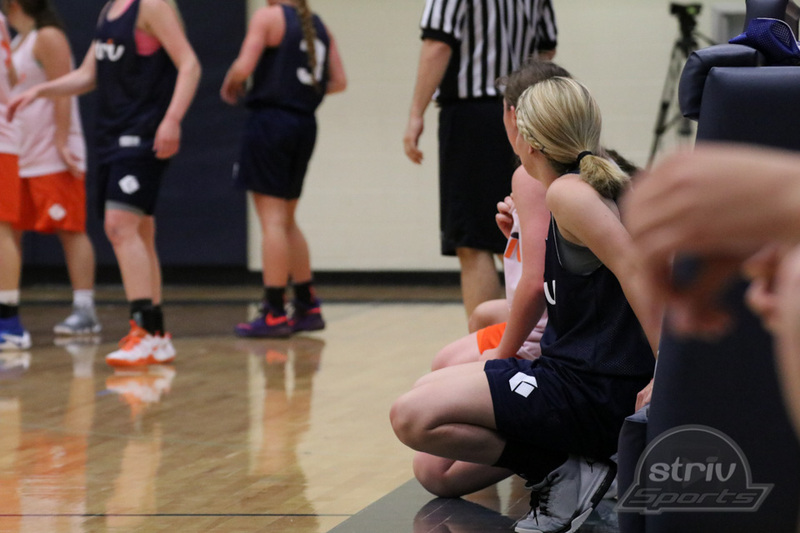 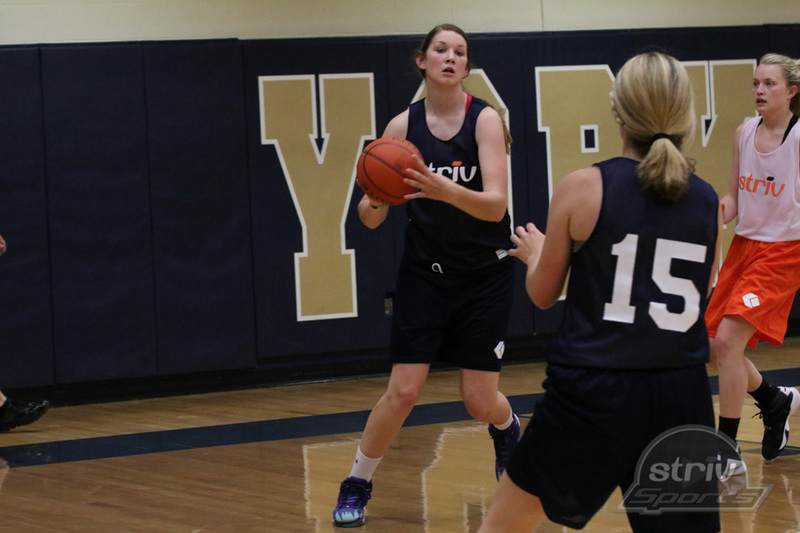 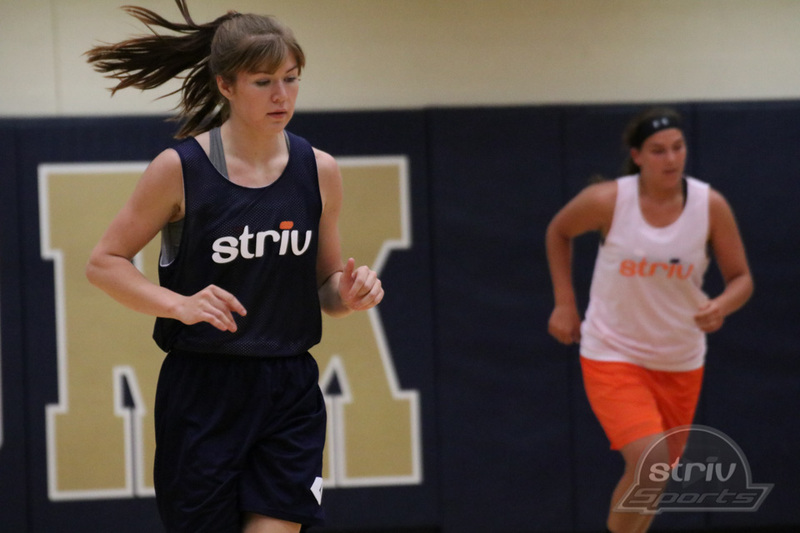 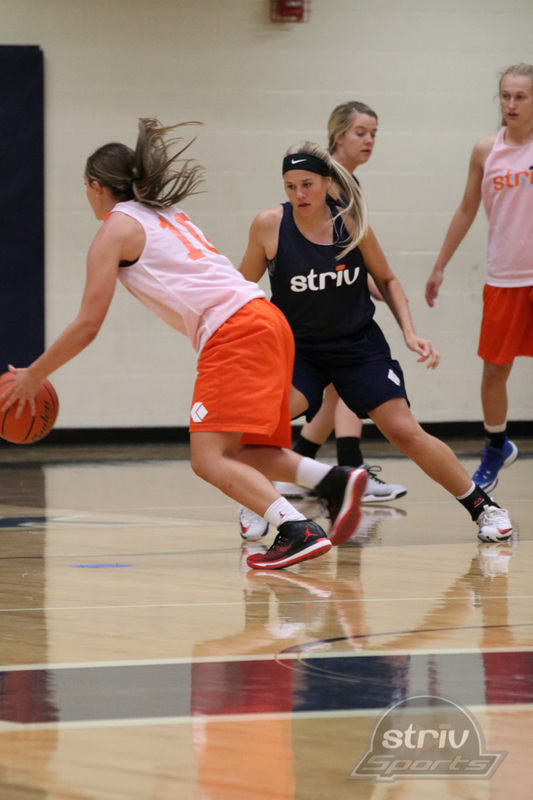 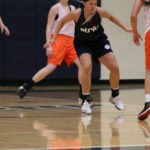 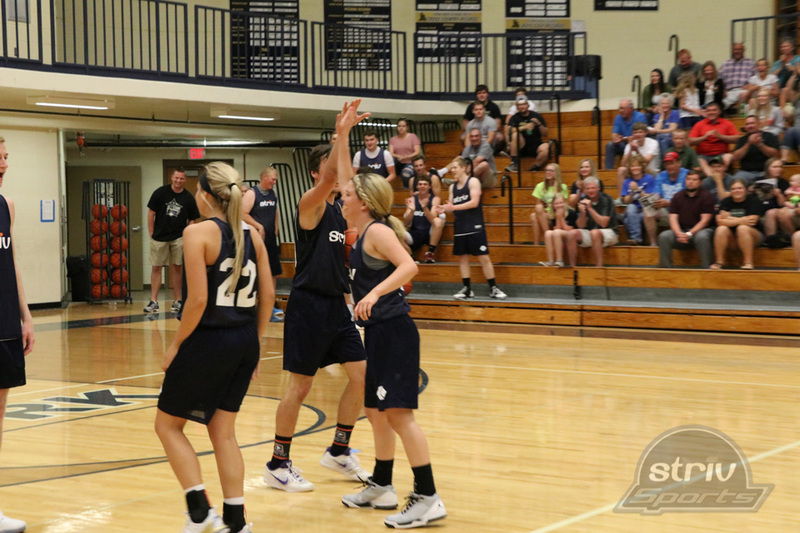 In the girls game, the Blue Team raced to a 24-11 lead after the first quarter but had to hold on for a 66-58 win. 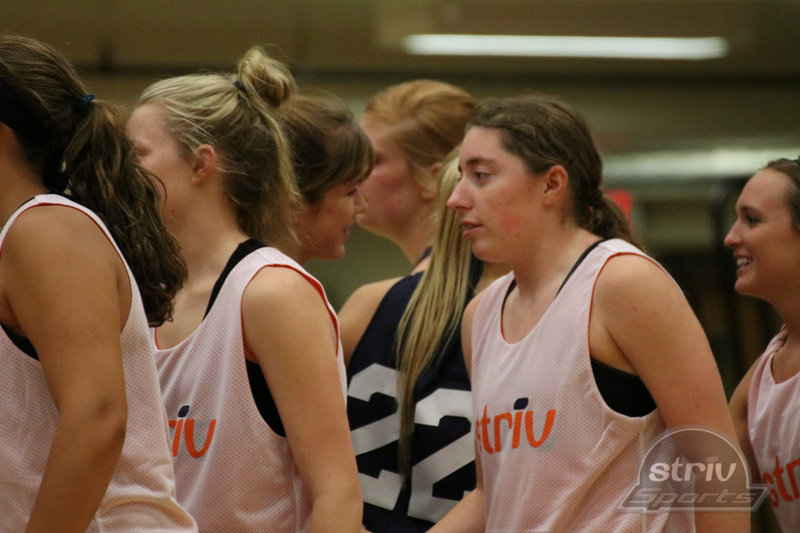 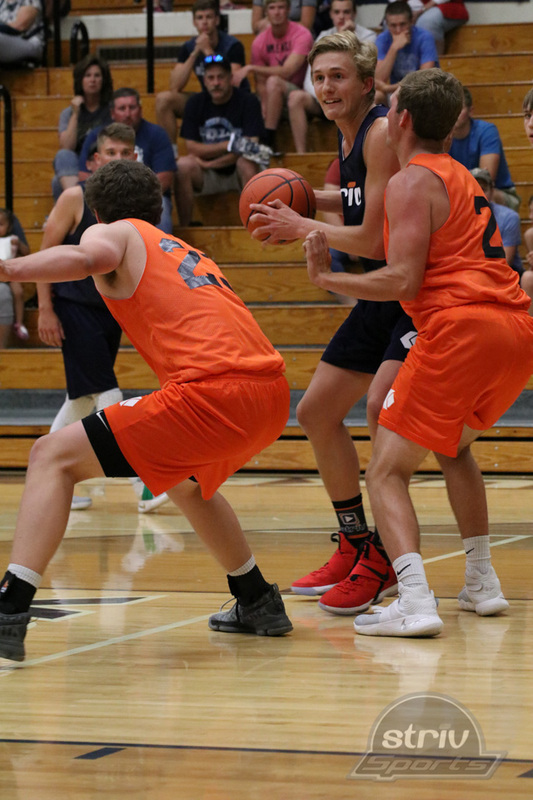 The Orange cut the lead to 45-40 after three quarters and were within one possession multiple times in the fourth quarter but never took the lead. 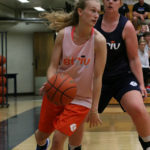 Up 60-58 late, the Blue got an old-fashioned 3-point play from Halle Plumbtree (Fullerton) with just over a minute left to seal the win. 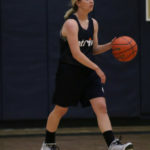 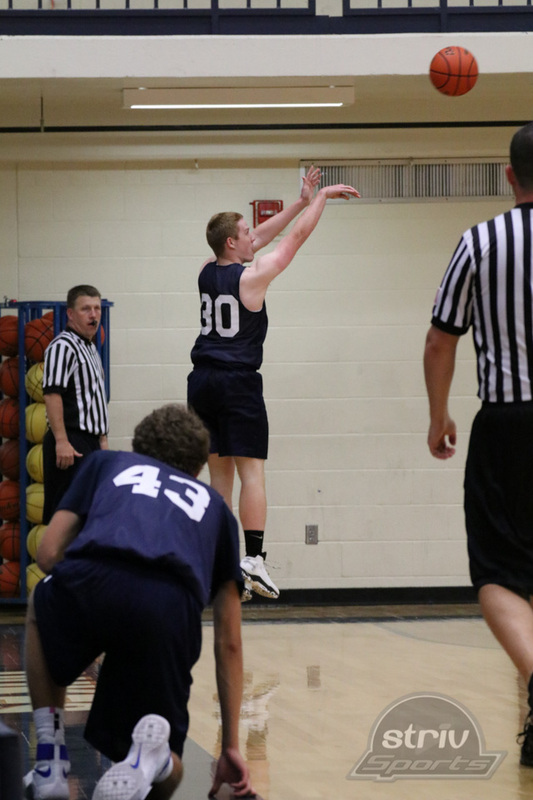 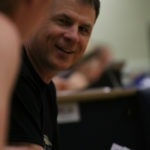 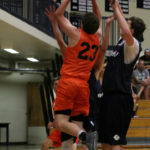 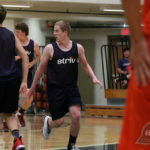 Plumbtree was one of three Blue all-stars in double figures with 10 points. 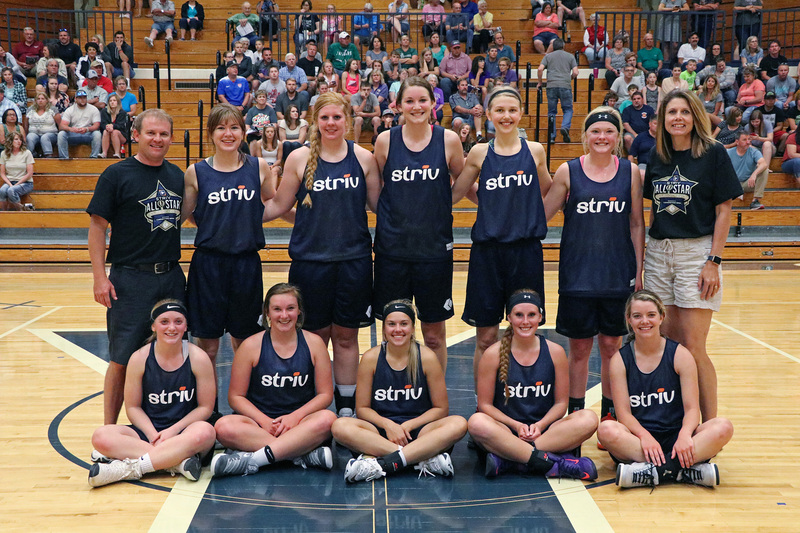 Aubrey Frederick (Dundy County-Stratton) led the Blue with 14 points and Jaime Troester (Hampton) had 11. 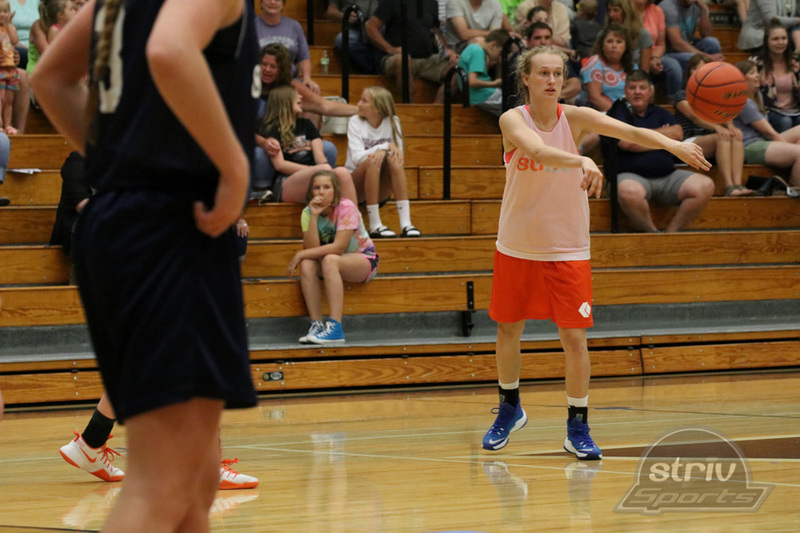 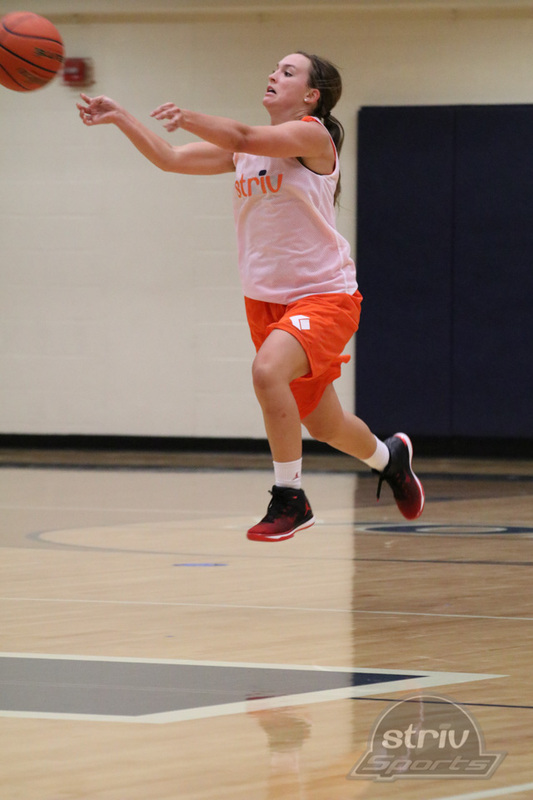 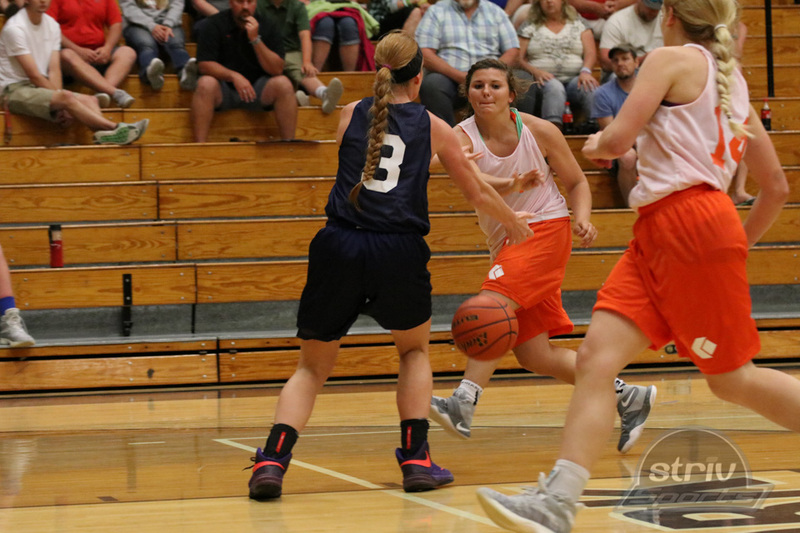 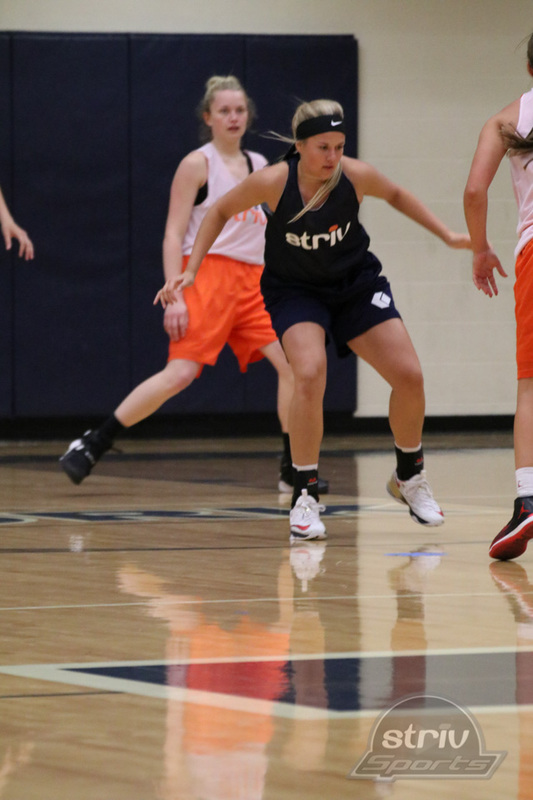 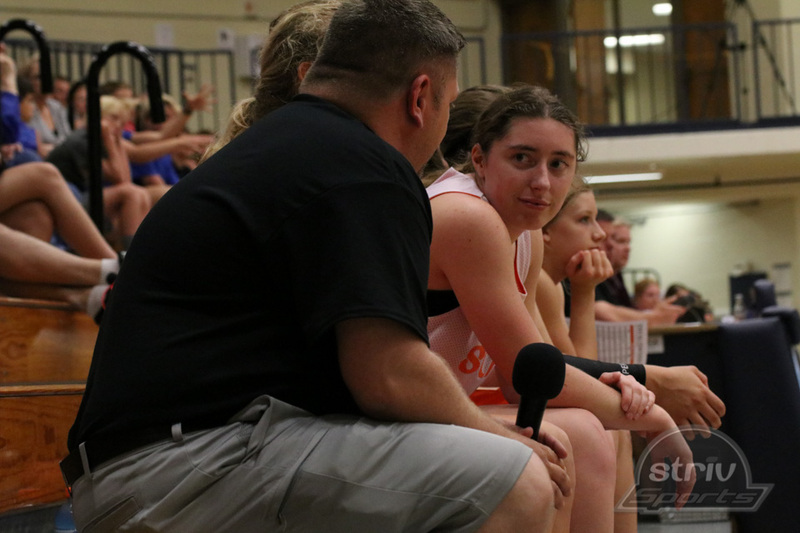 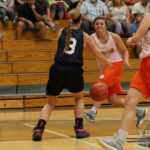 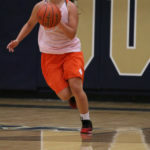 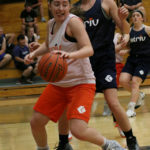 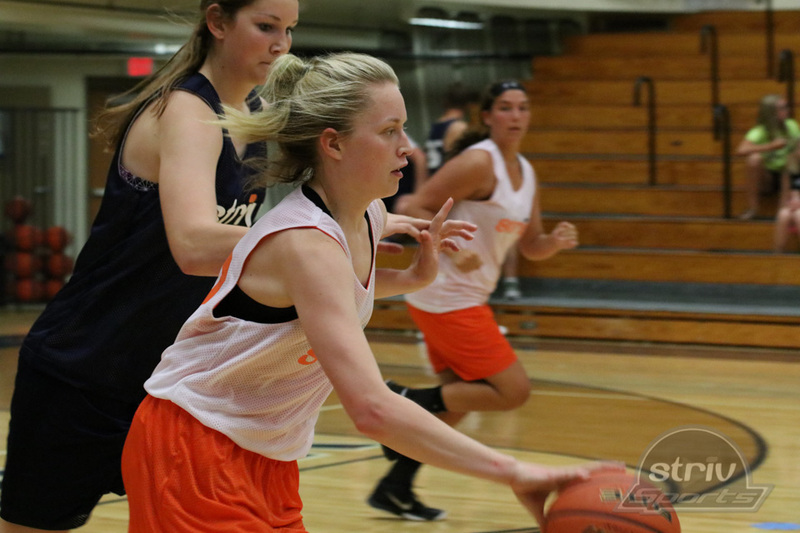 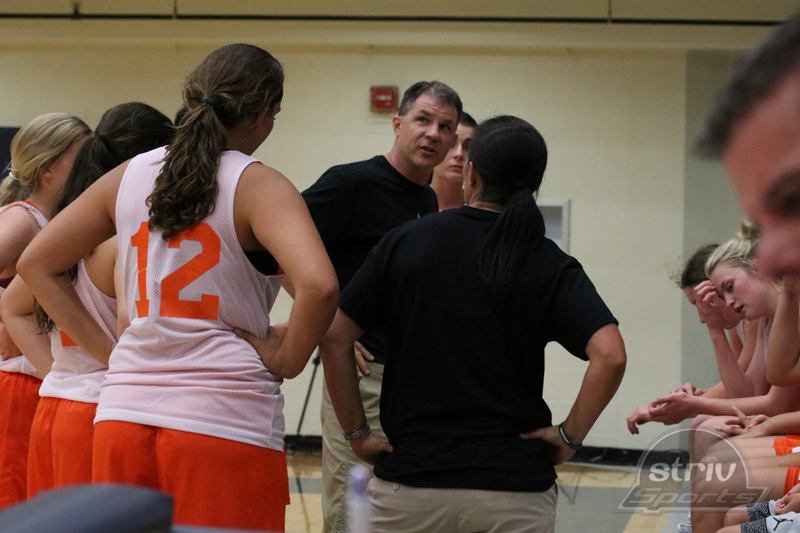 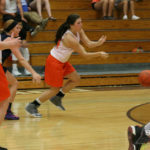 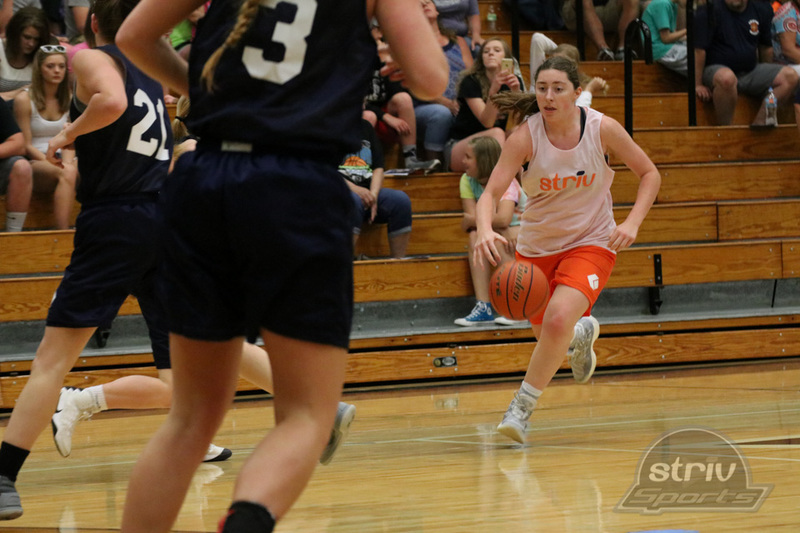 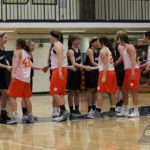 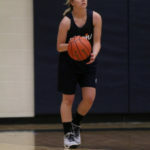 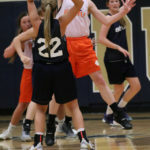 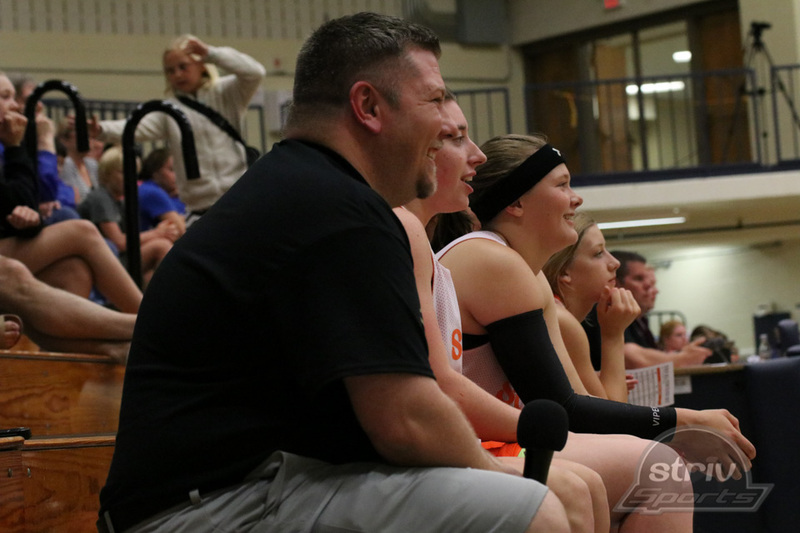 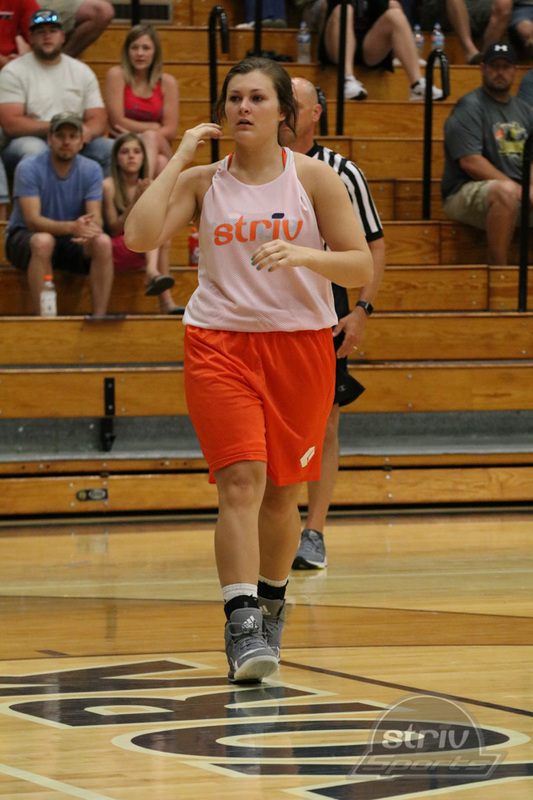 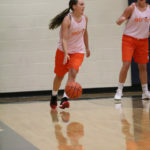 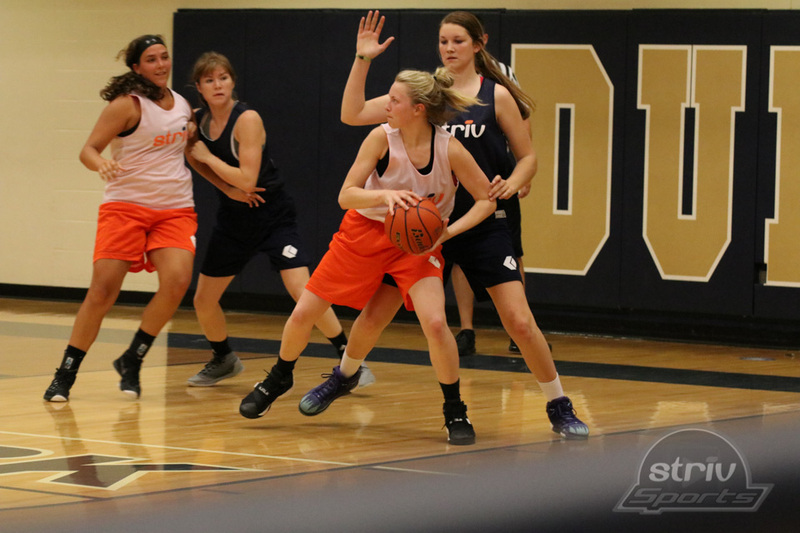 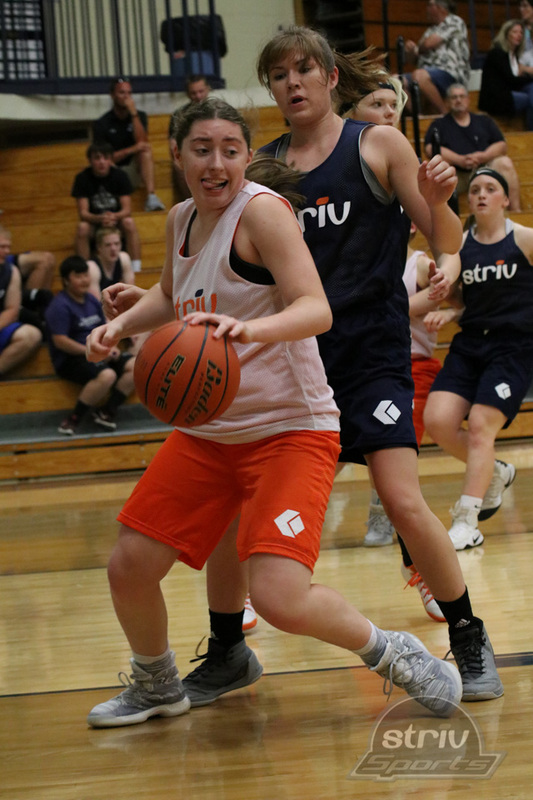 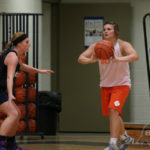 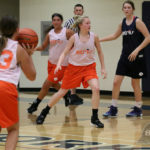 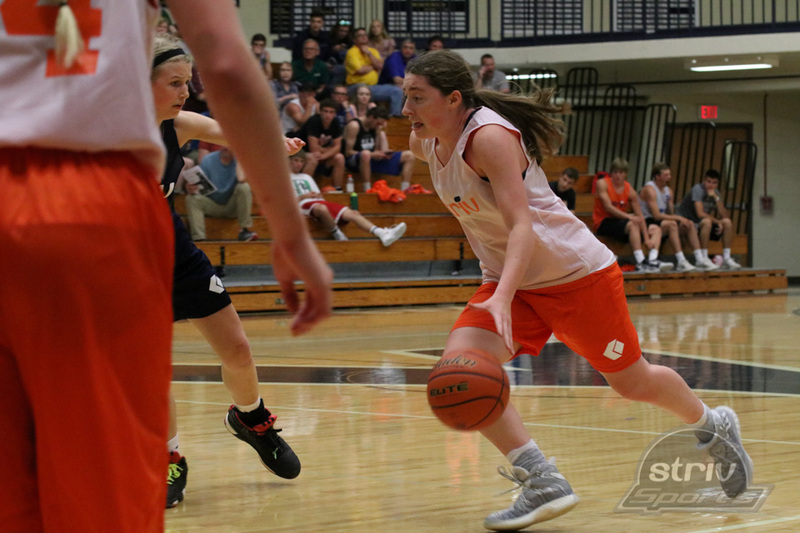 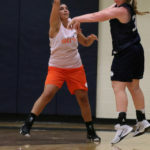 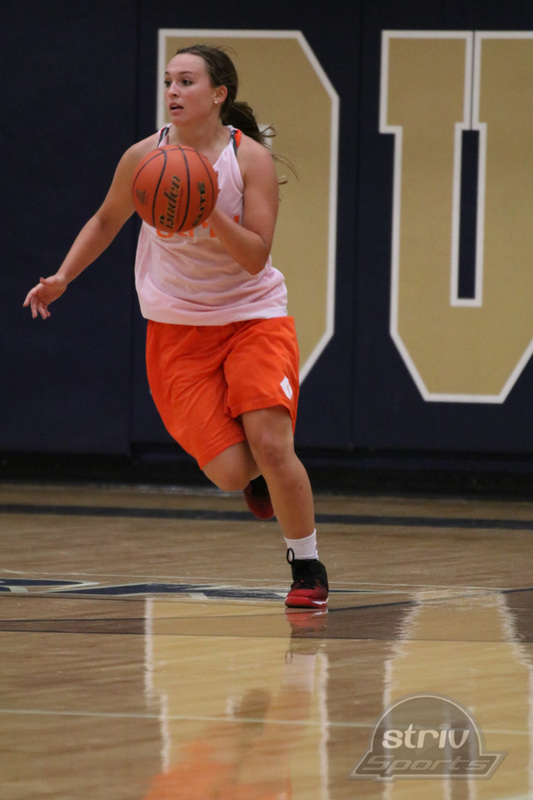 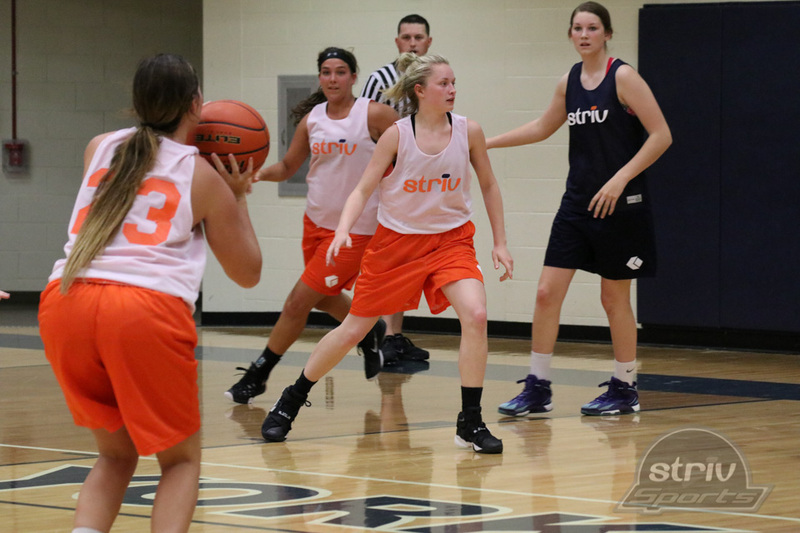 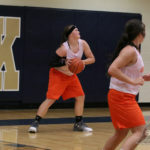 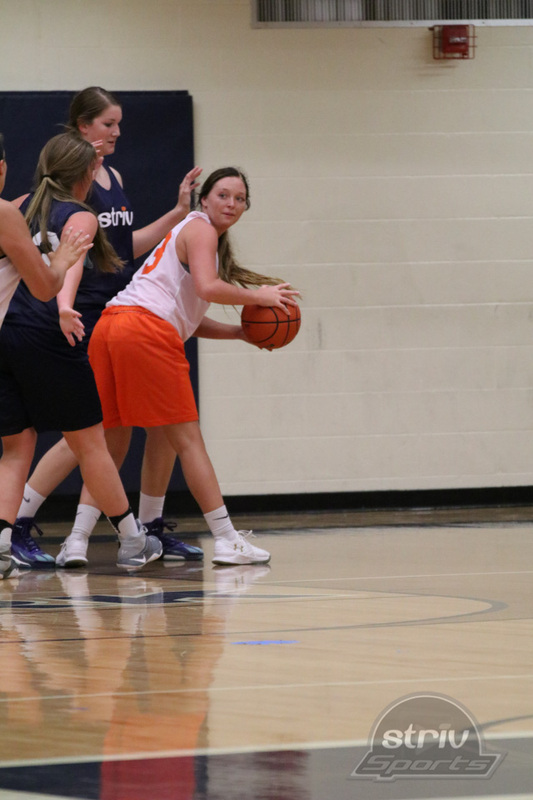 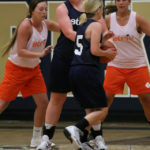 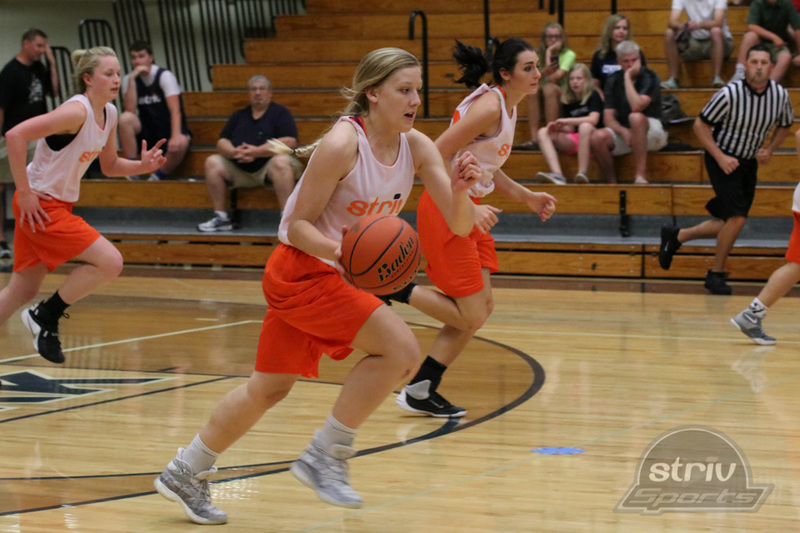 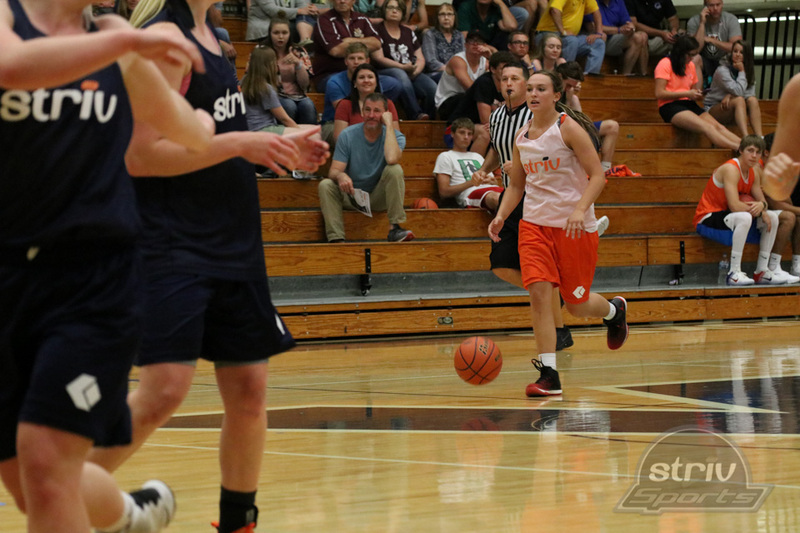 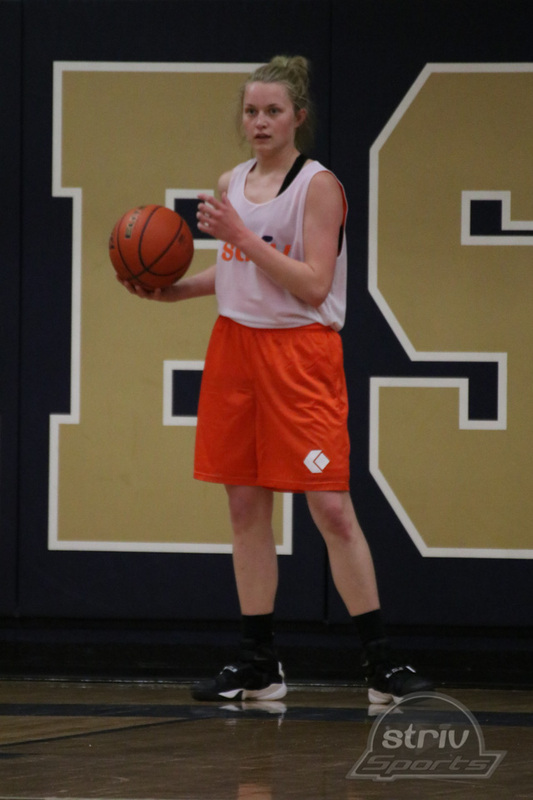 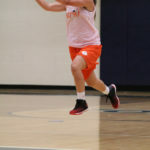 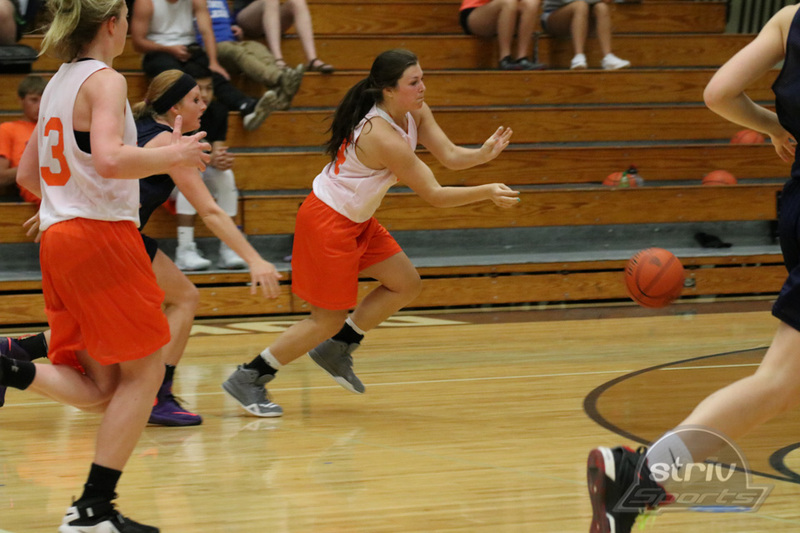 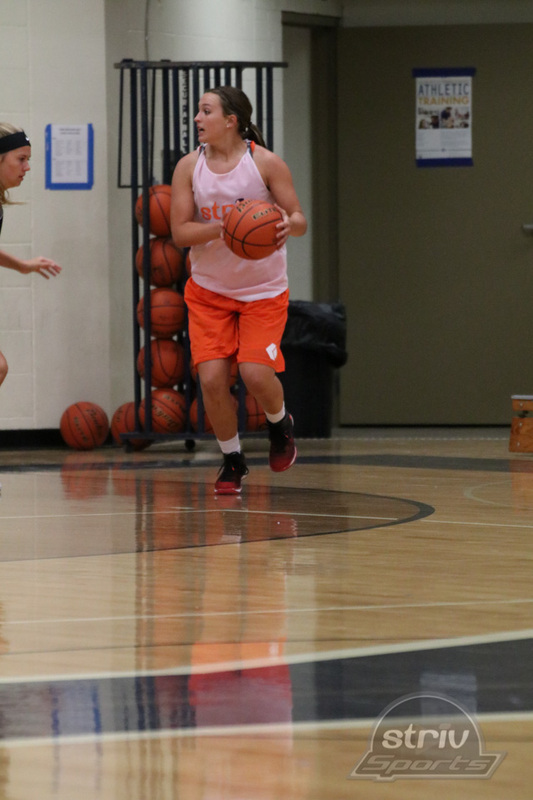 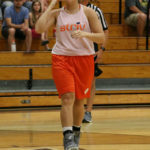 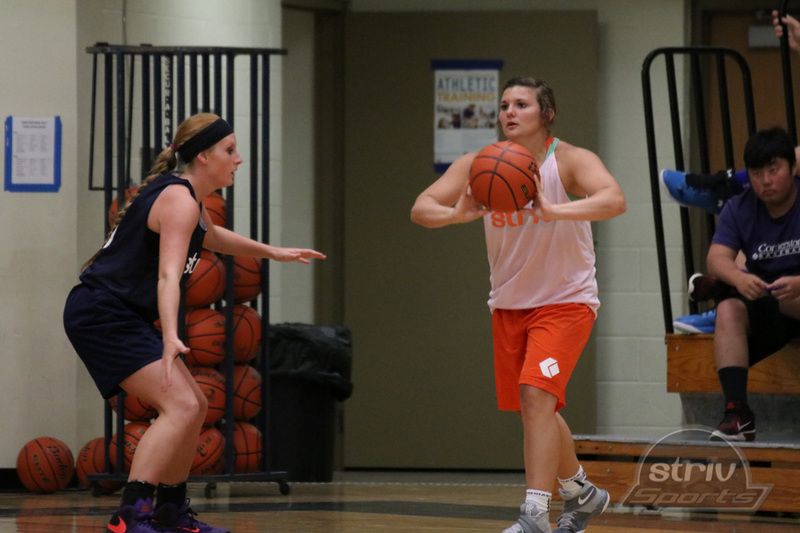 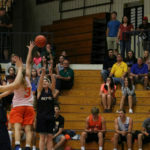 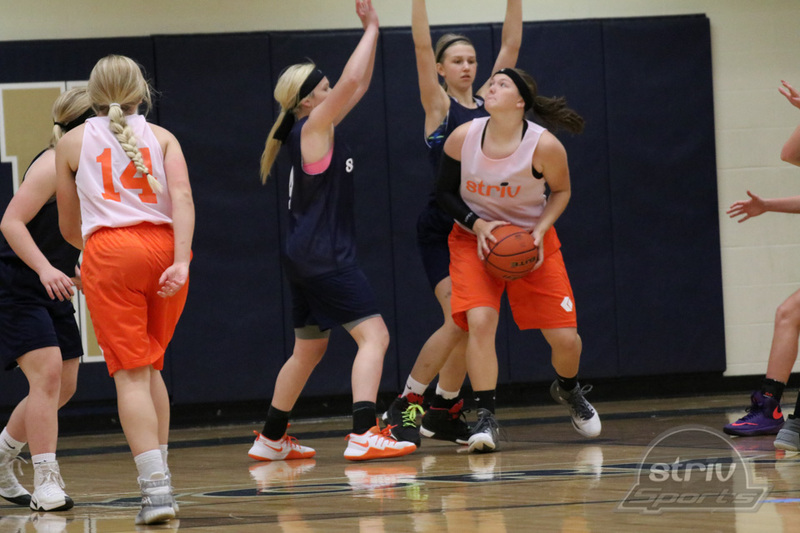 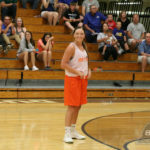 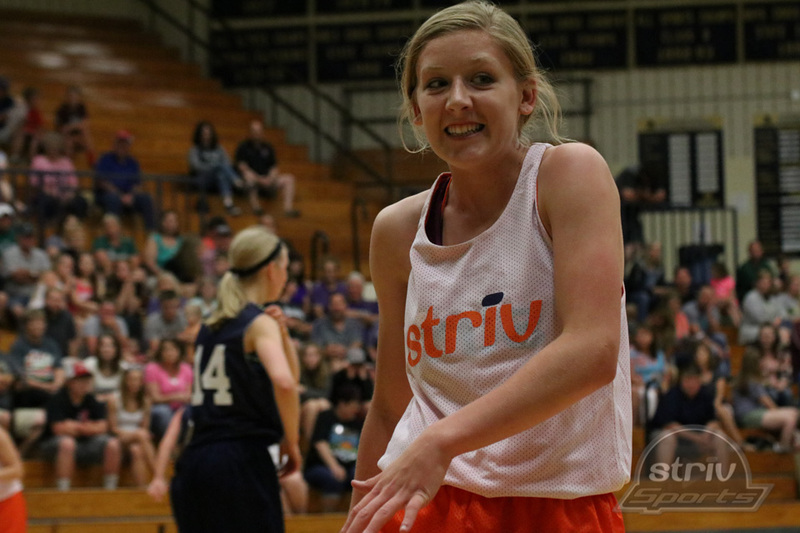 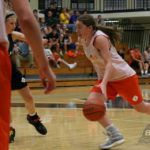 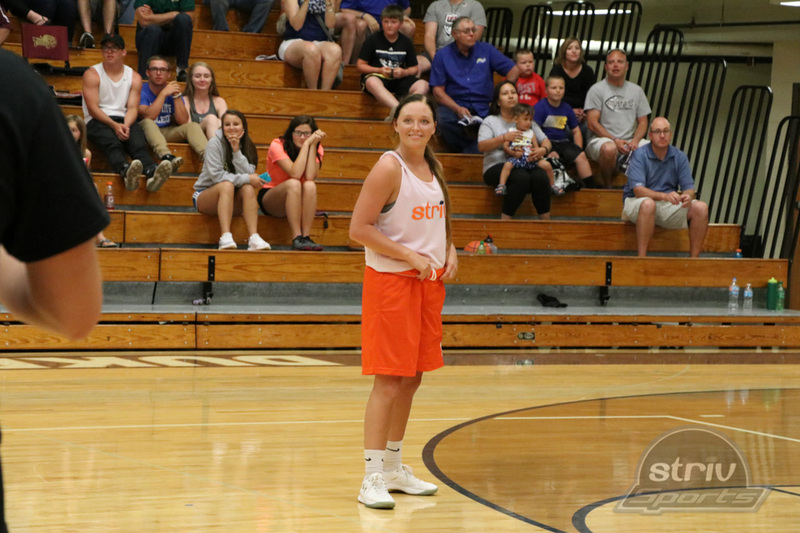 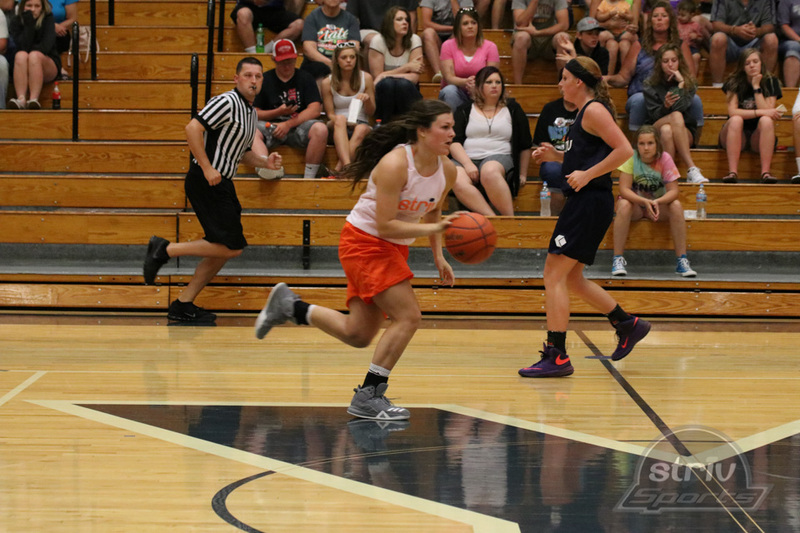 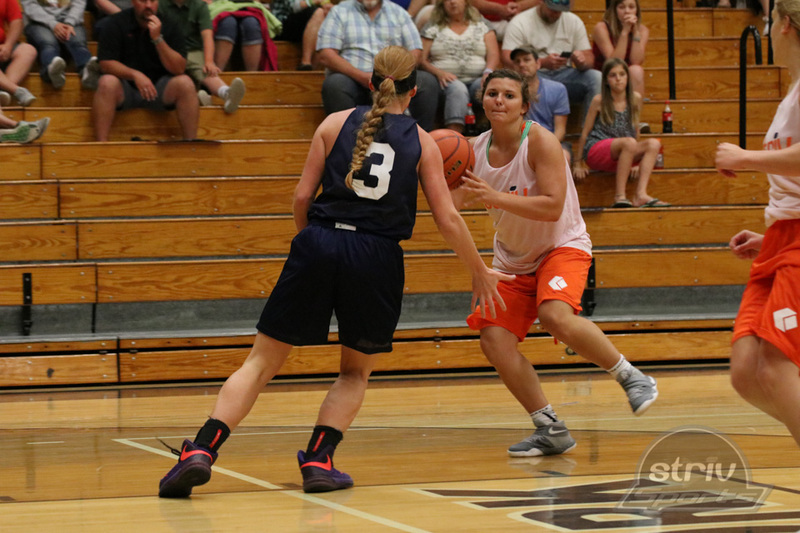 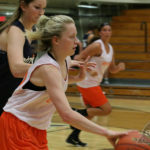 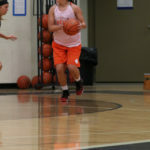 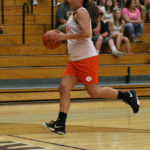 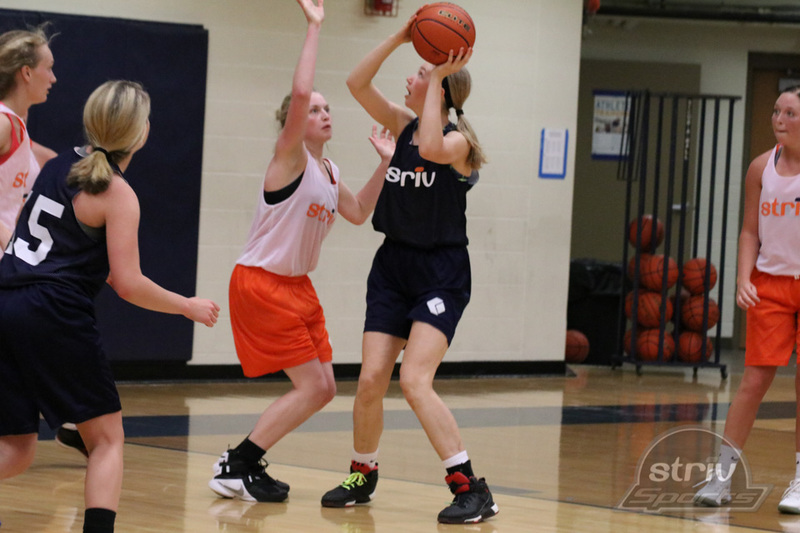 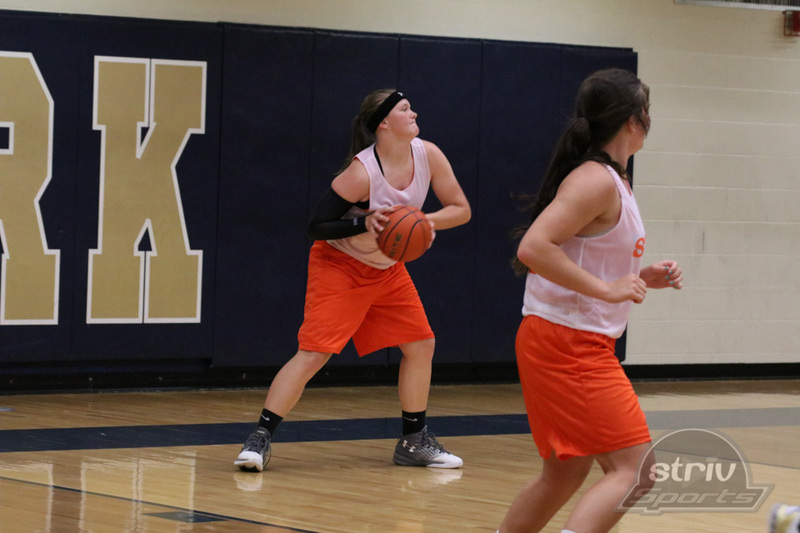 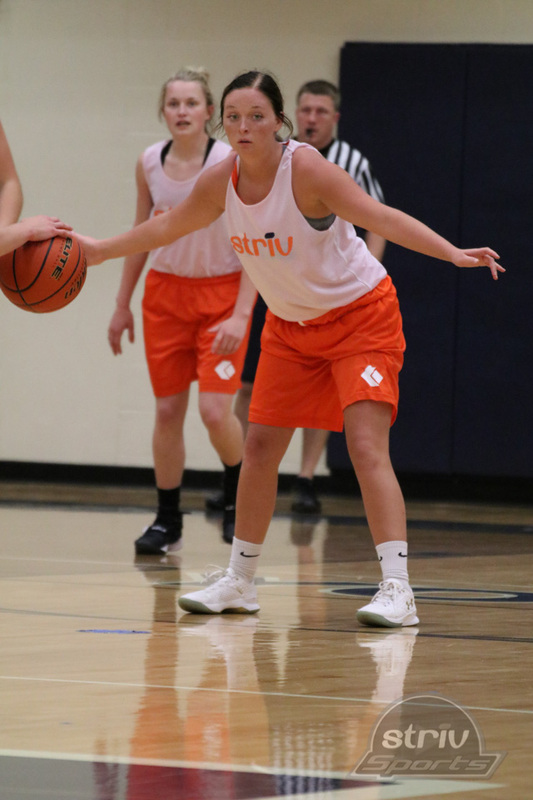 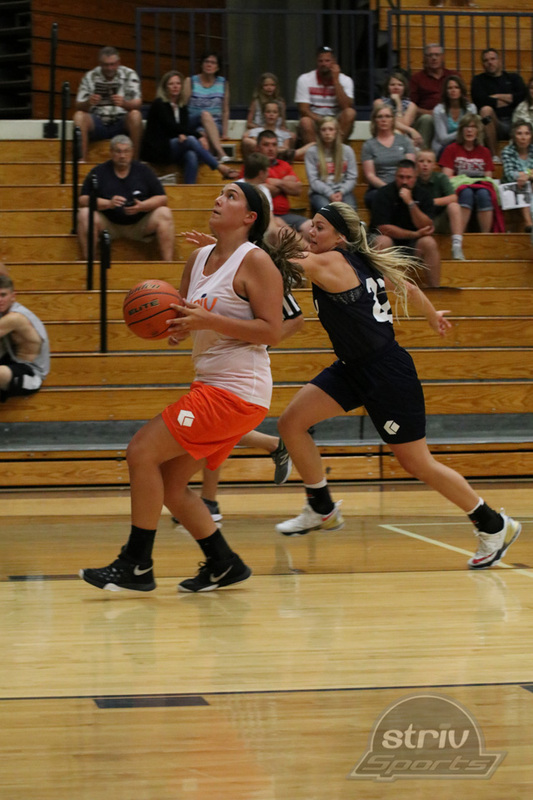 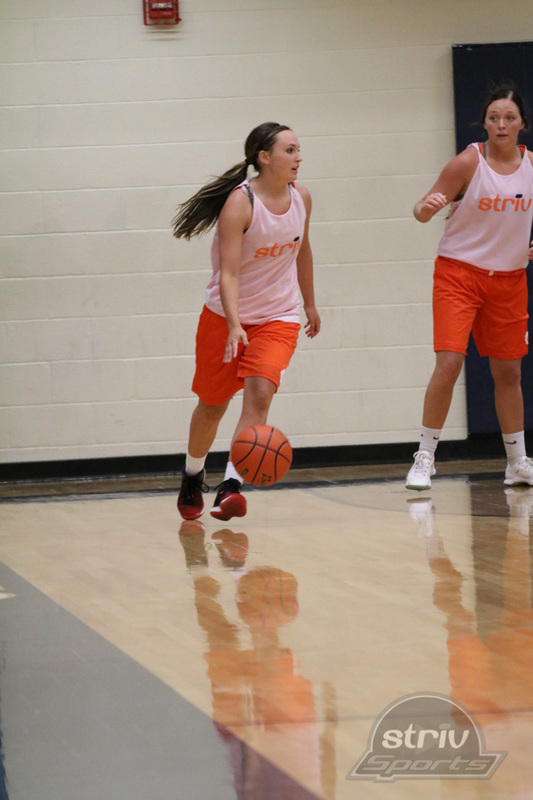 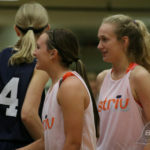 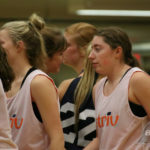 For the Orange, Ashlyn Power (Lincoln Christian) had 14 points and Mikayla Brady (Malcolm) added 11. 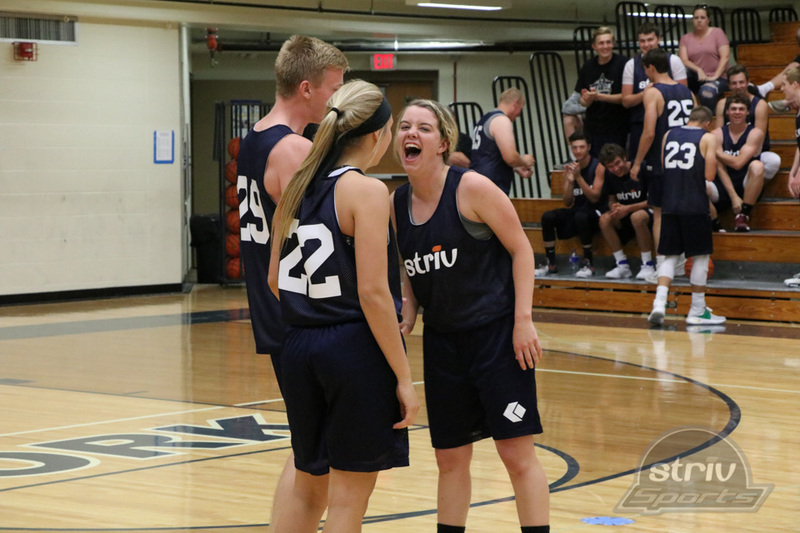 Fun ensued between games as well. 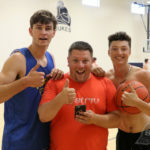 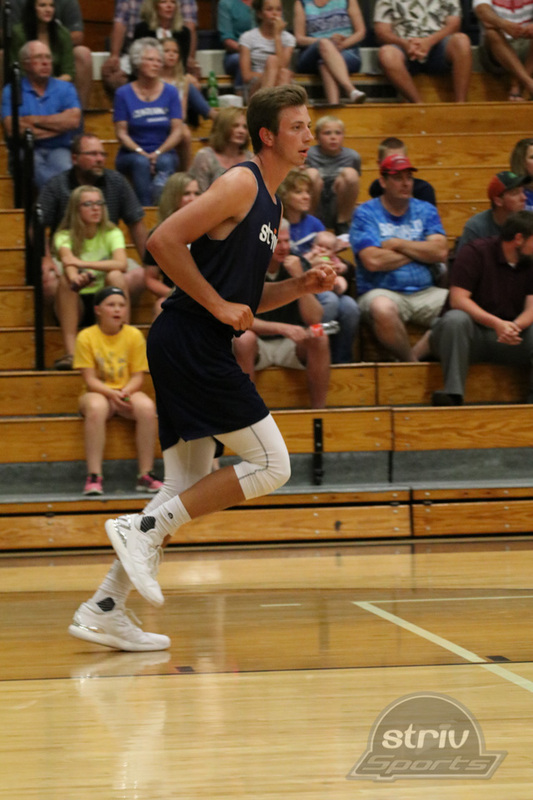 The boys 3 point challenge saw Cross County’s Kenny Wright (with a record 17) defeat Fillmore Central’s Garrett Whitley. 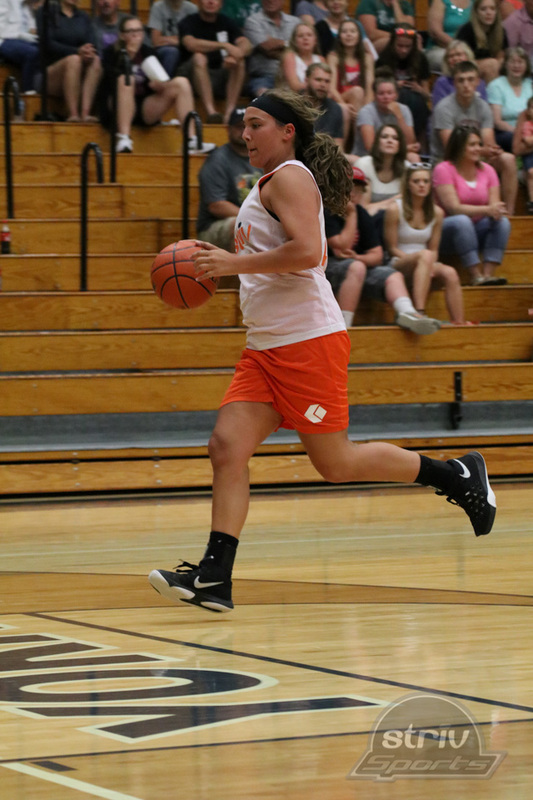 The girls followed with Twin River’s Alexis Raemakers (with a girl’s record 16) defeating Hampton’s Jaime Troester. 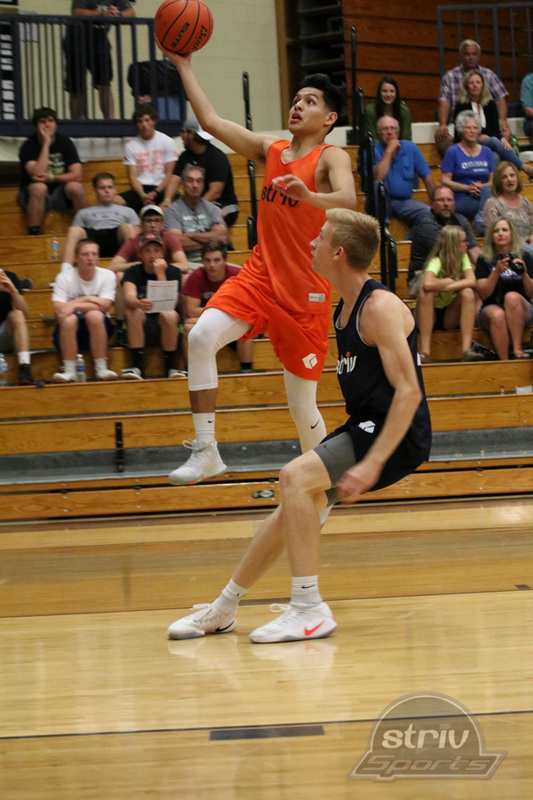 In their head to head, Wright and Raemakers were tied after a minute, which prompted a move back to the 4 point shot, which Wright made on his second try. 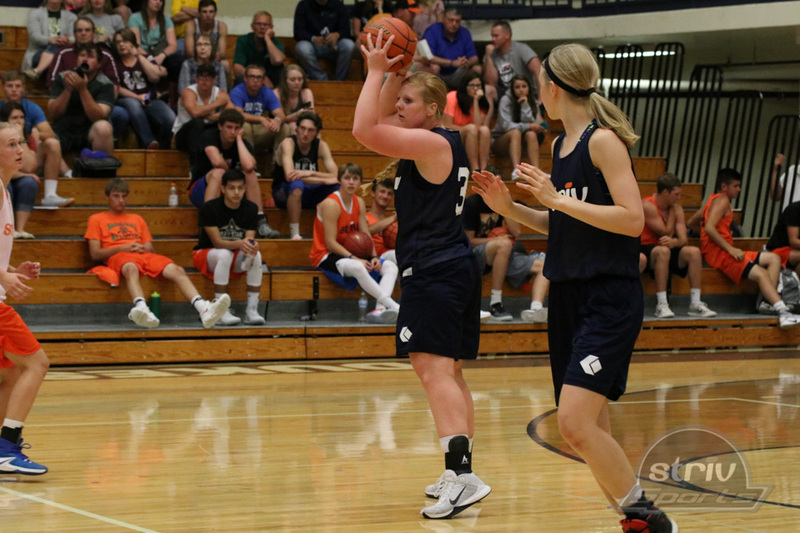 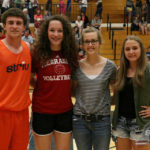 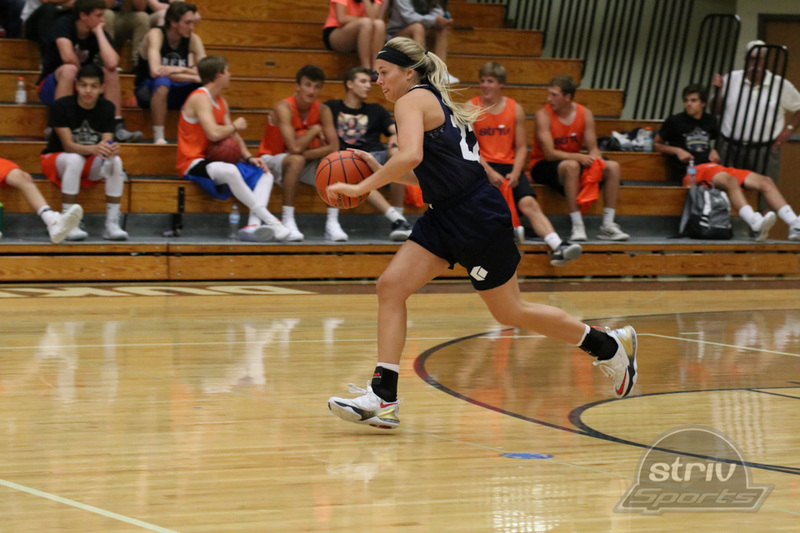 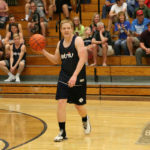 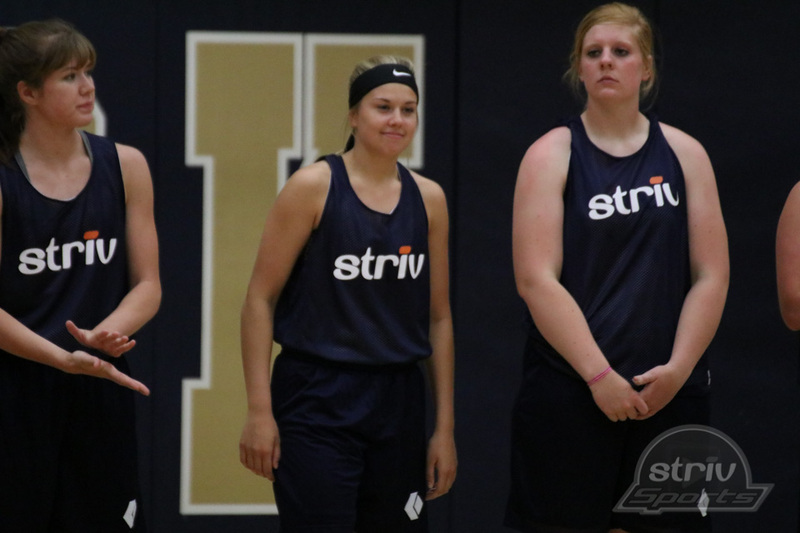 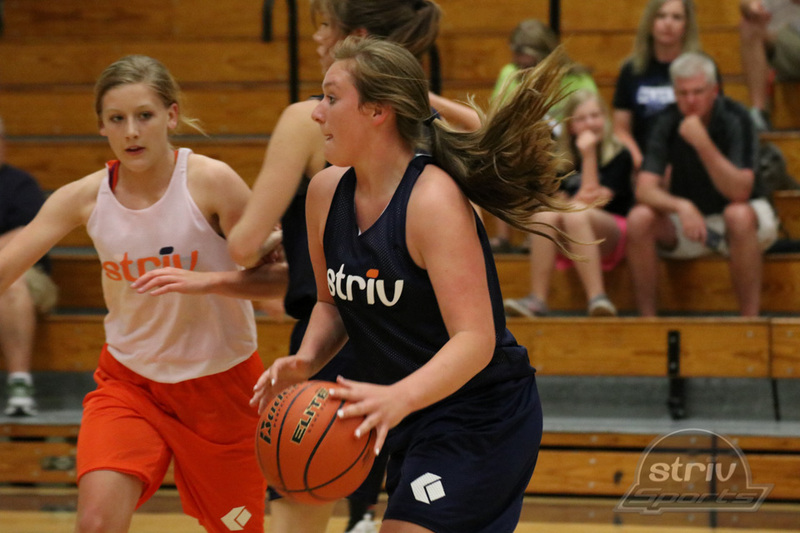 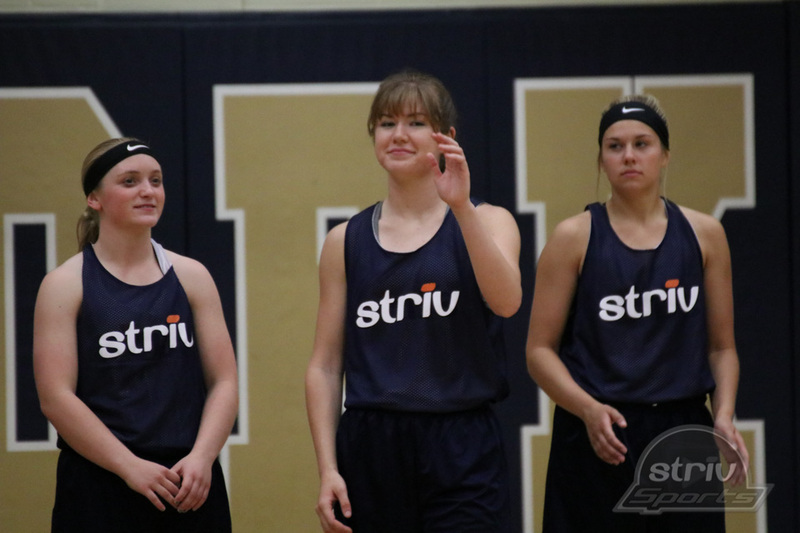 The skills challenge pitted a Blue team of Emily Jones (DCS), Tessa Hedlund (BC/NG), Adam Hoarty (Fillmore Central) and Jaidon Policky (Milford) against an Orange team of Kailyn Wiseman (Sutton), Ashlyn Power (Lincoln Christian), Dylan McKee (Malcolm) and Drake Gorrin (Winnebago). 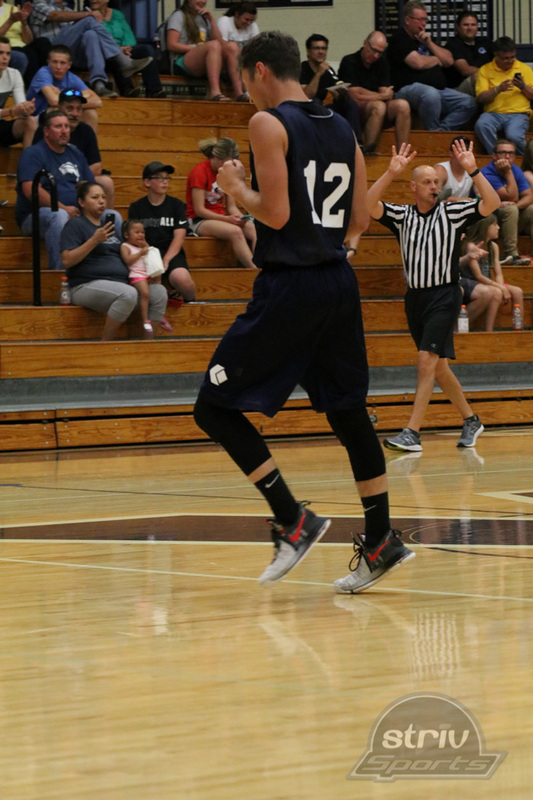 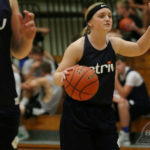 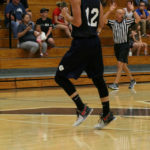 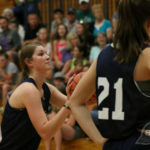 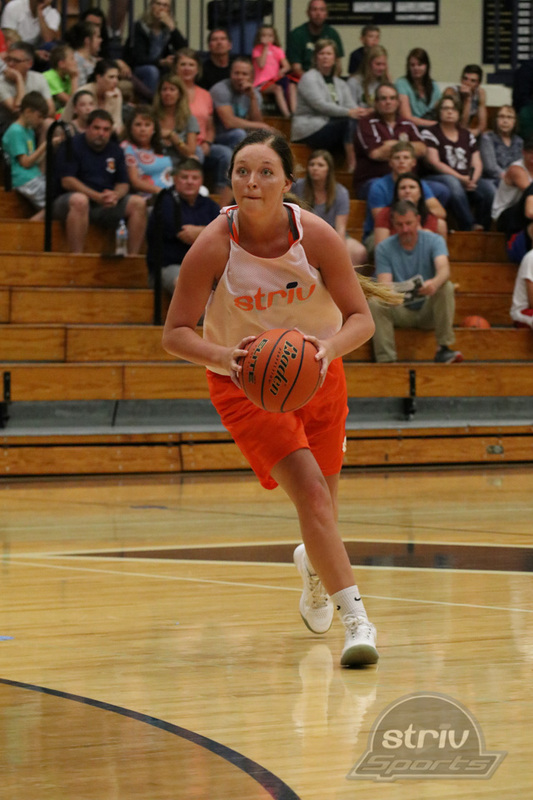 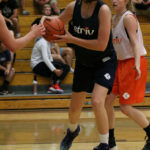 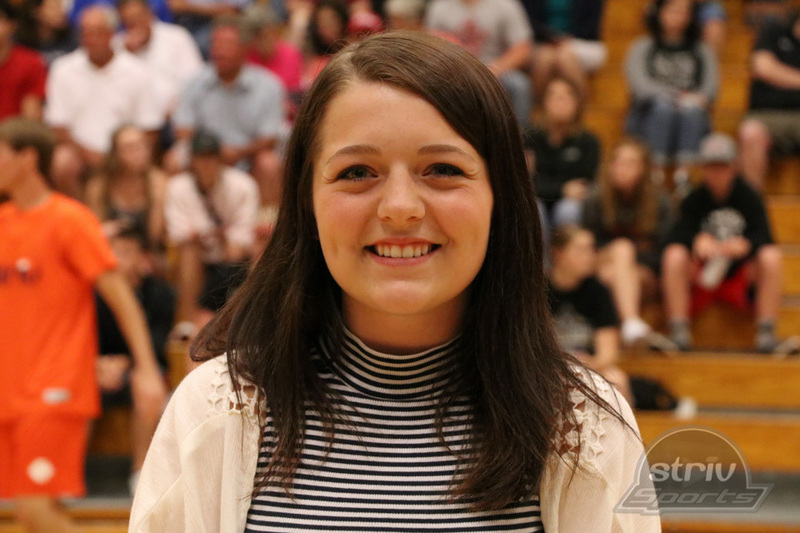 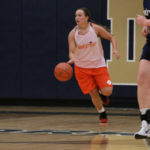 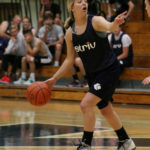 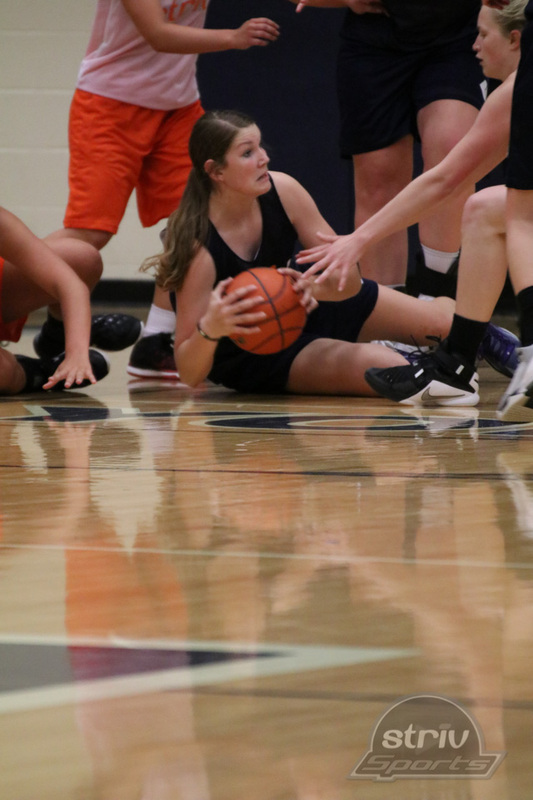 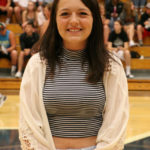 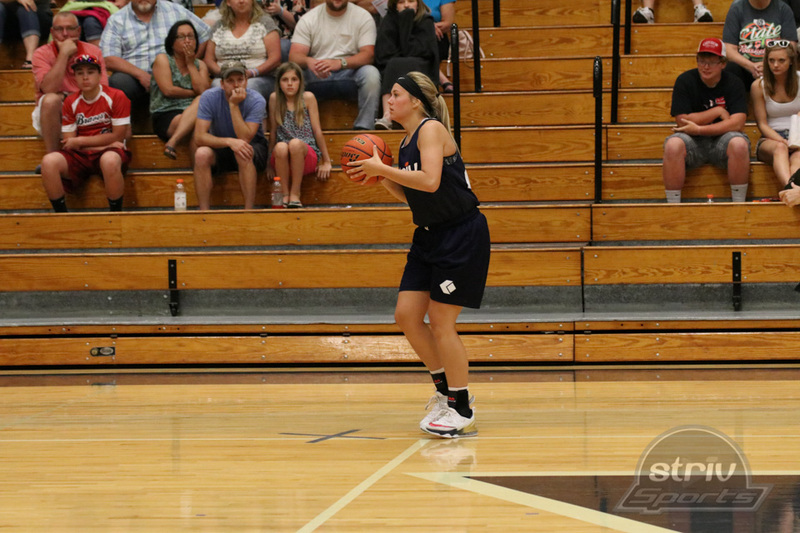 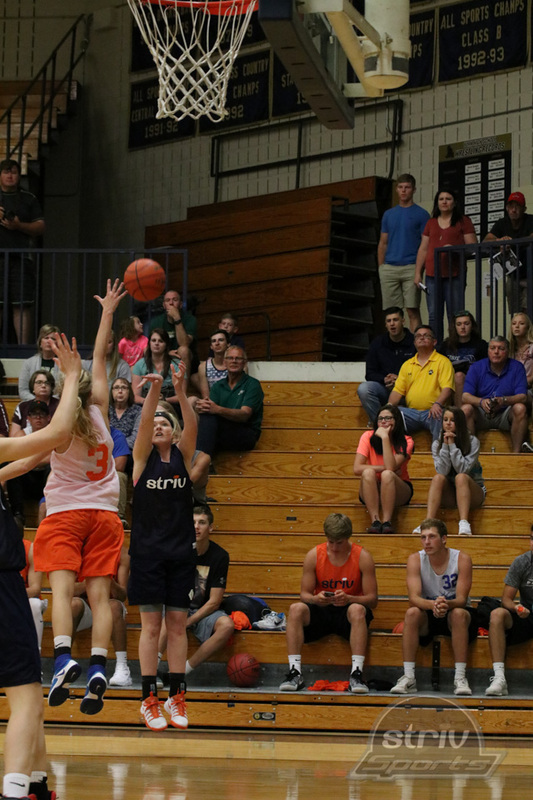 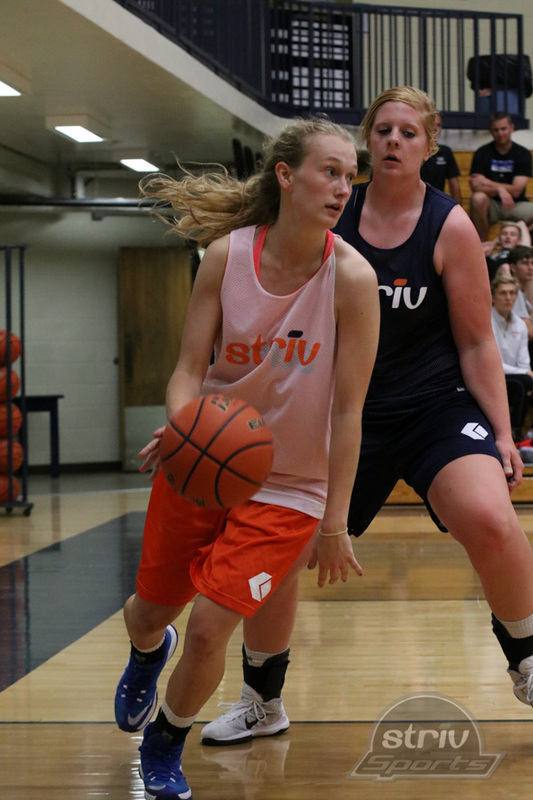 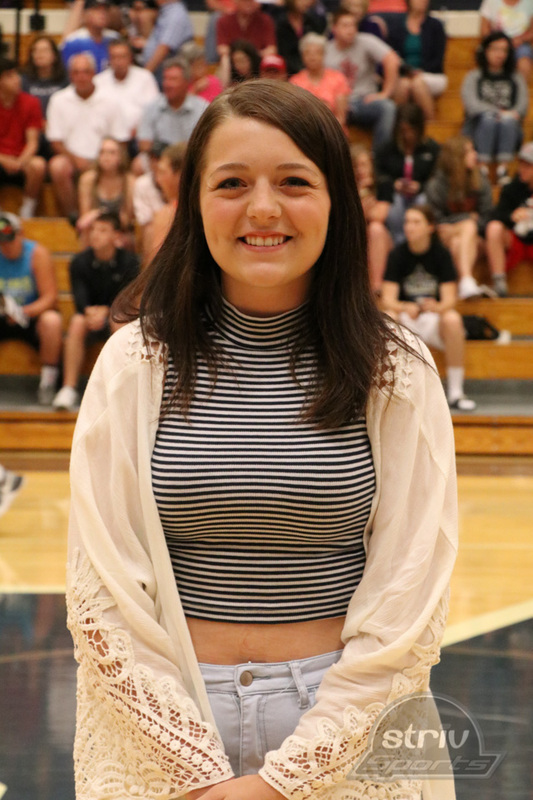 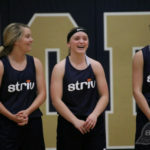 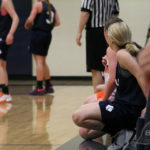 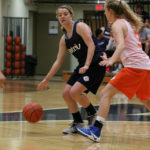 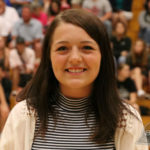 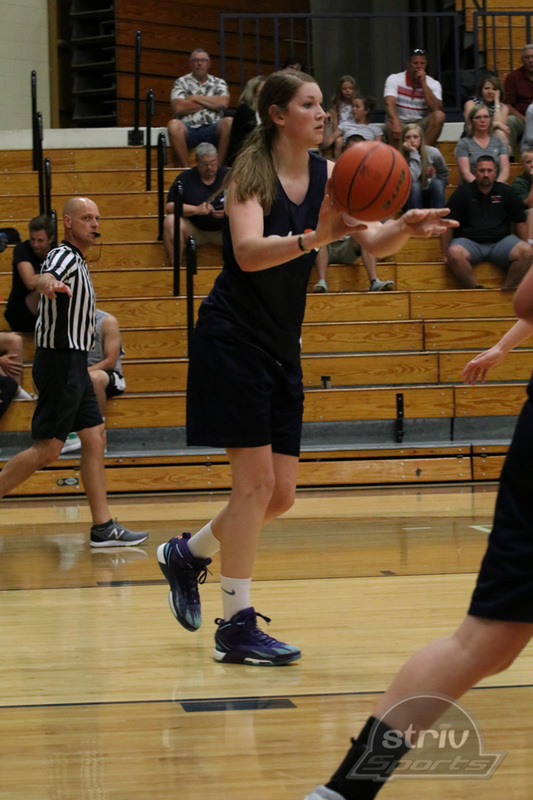 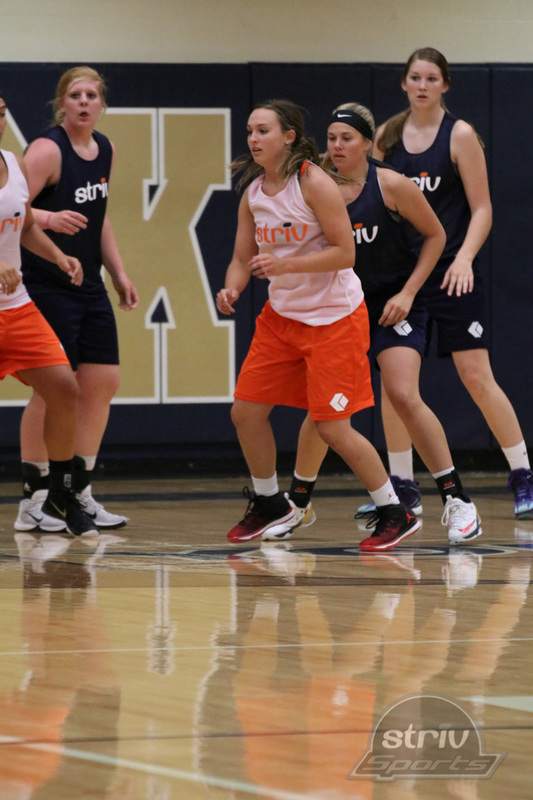 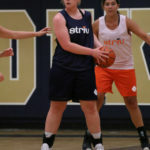 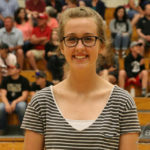 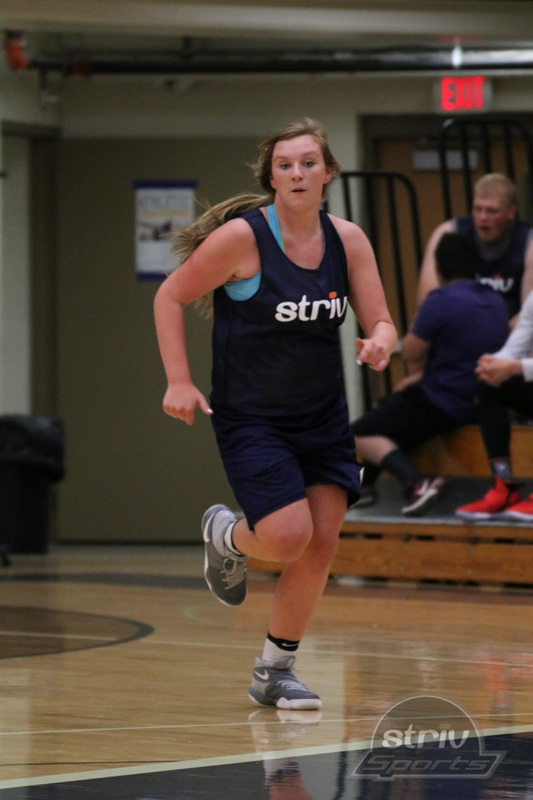 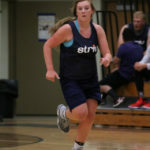 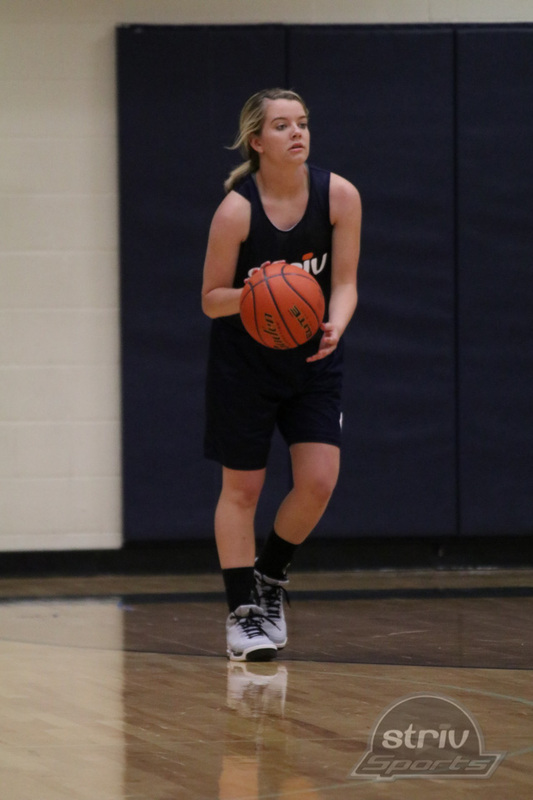 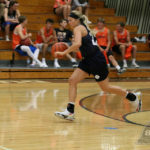 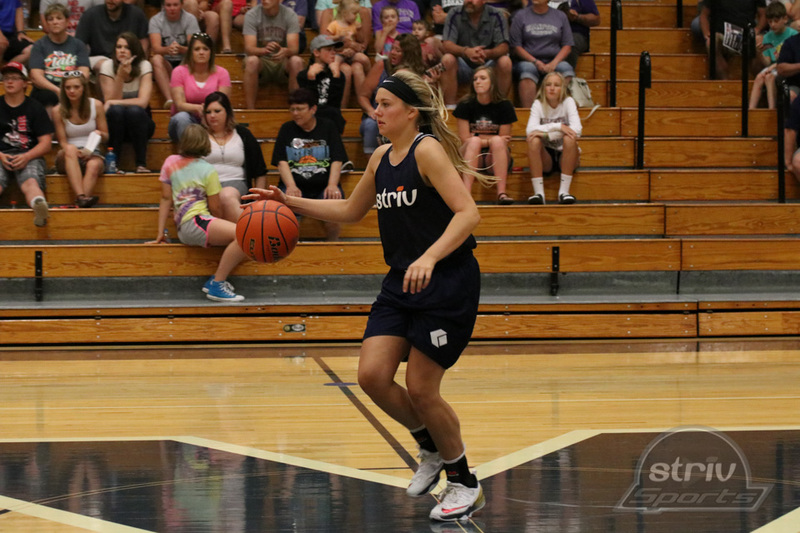 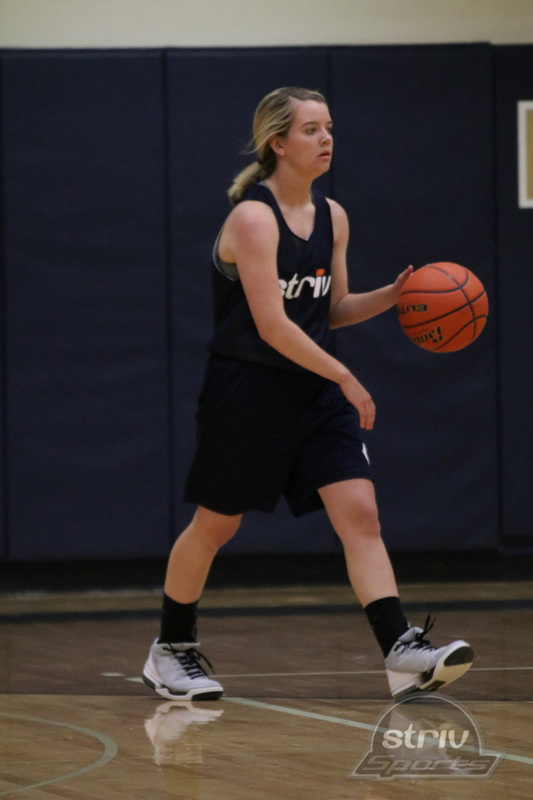 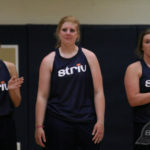 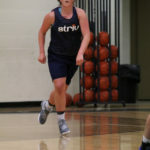 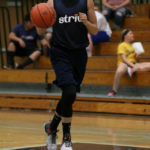 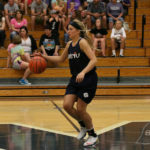 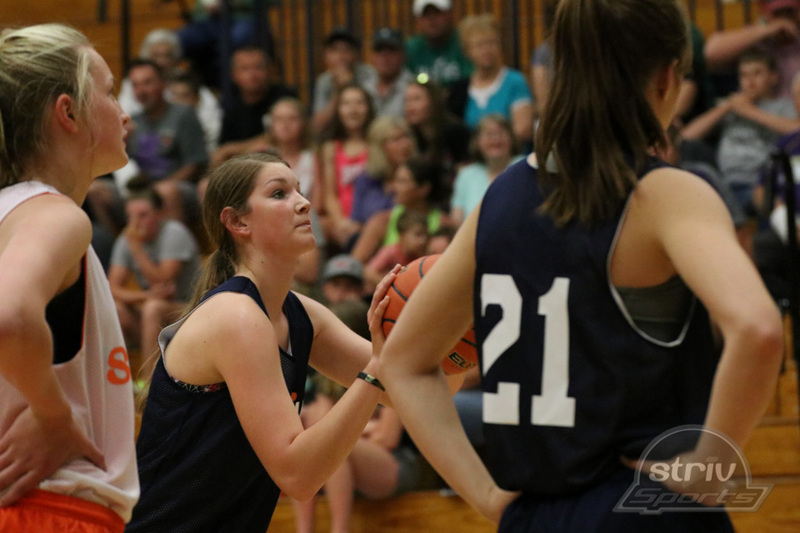 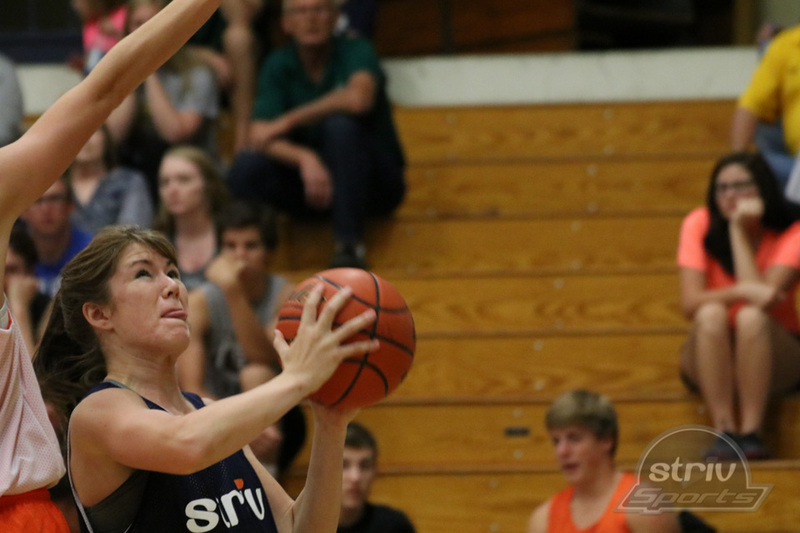 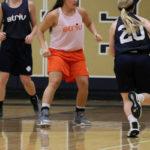 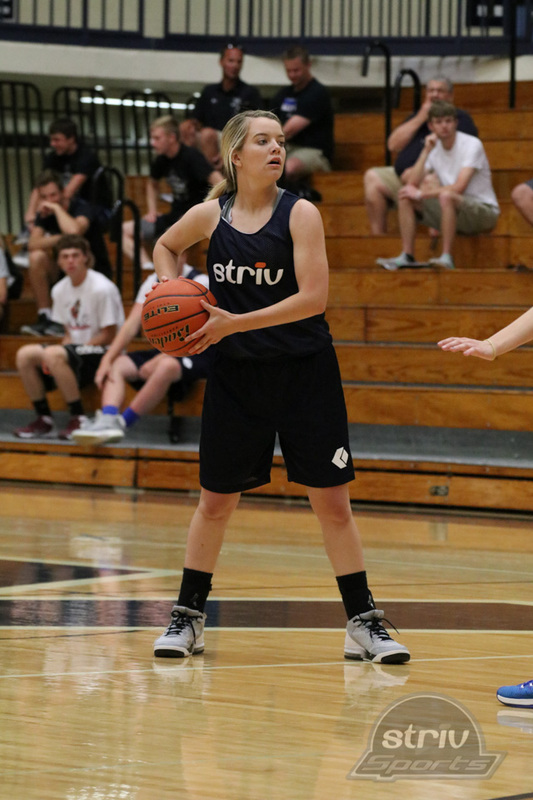 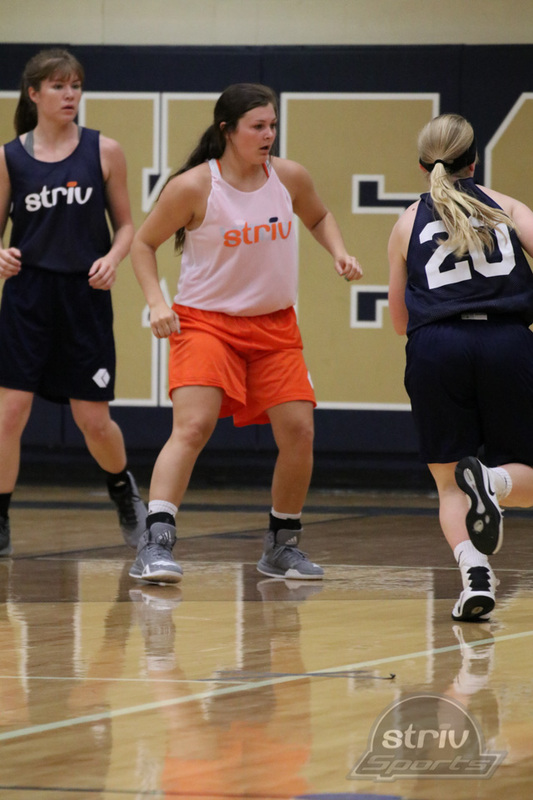 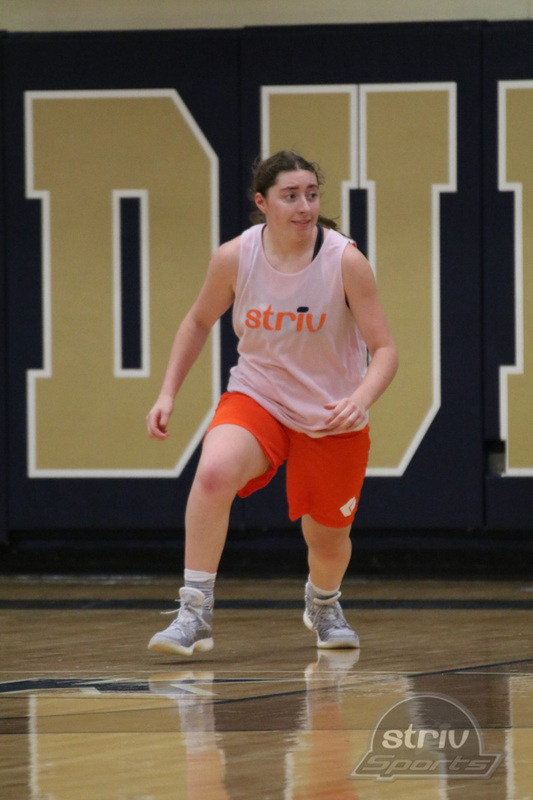 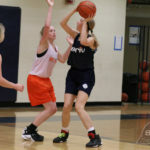 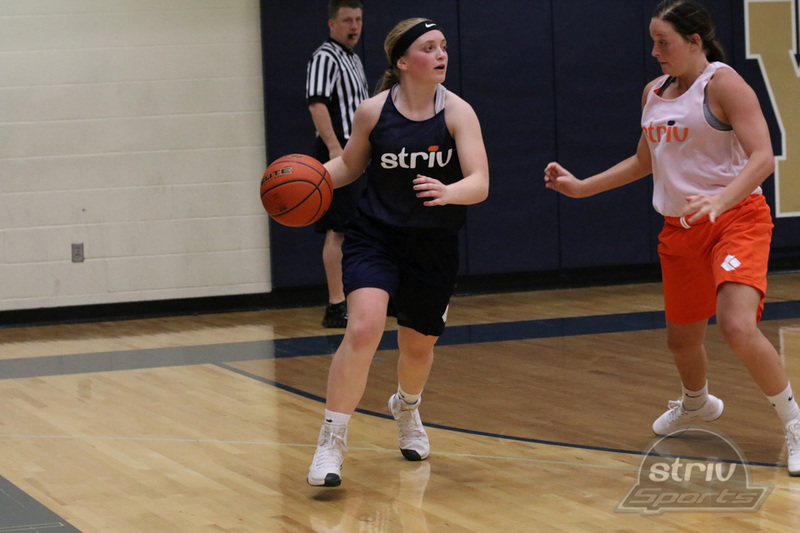 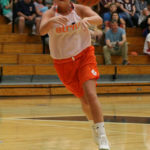 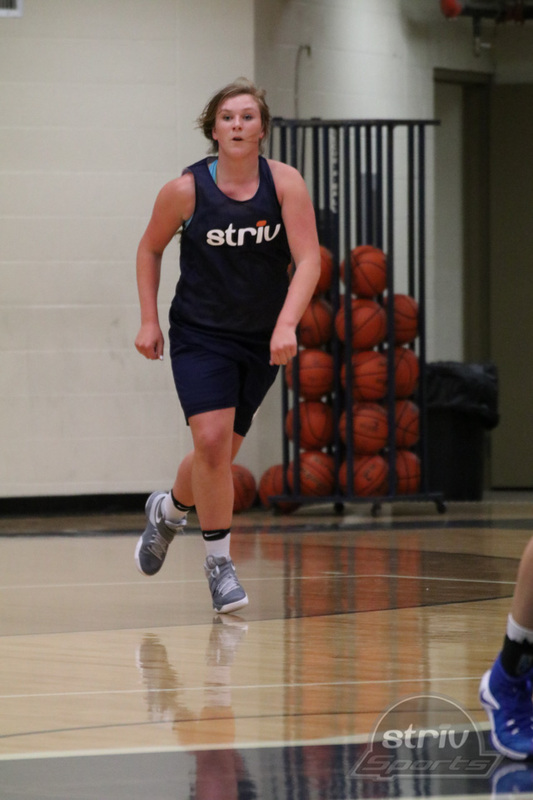 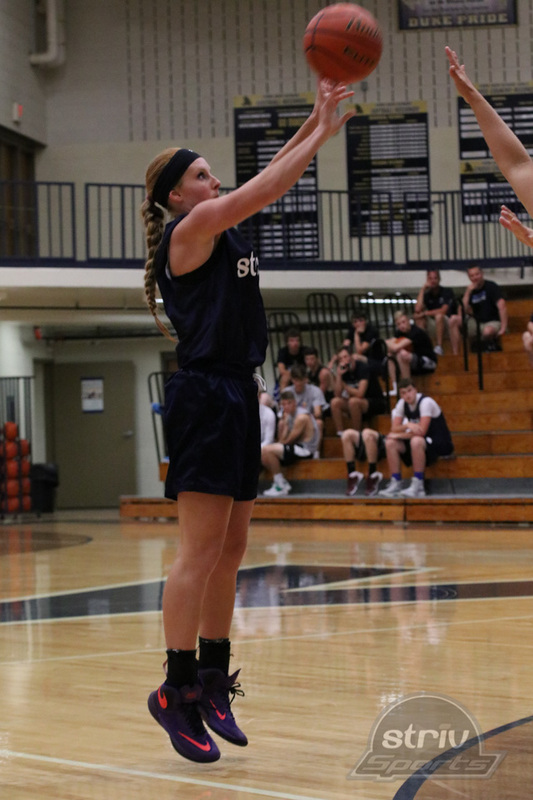 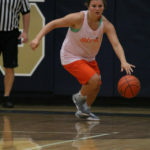 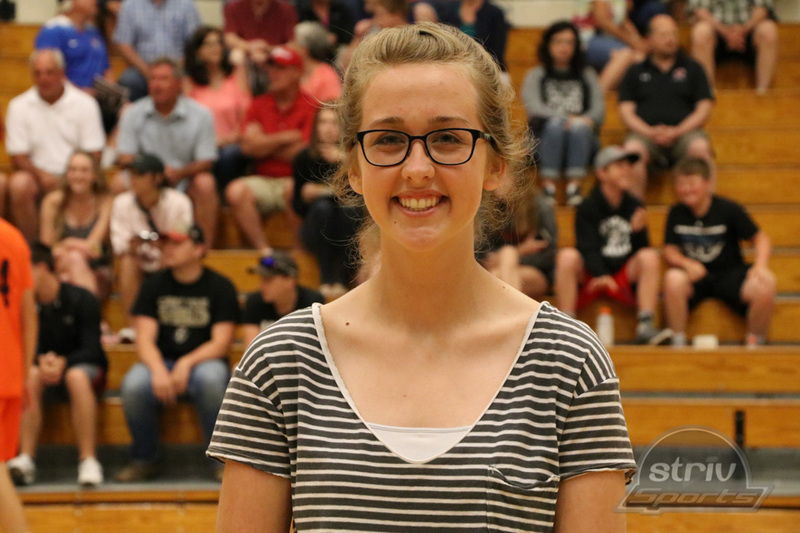 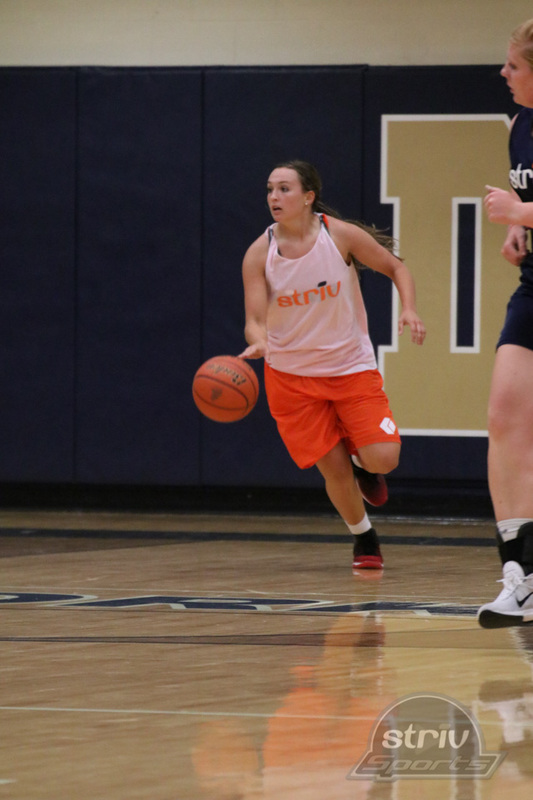 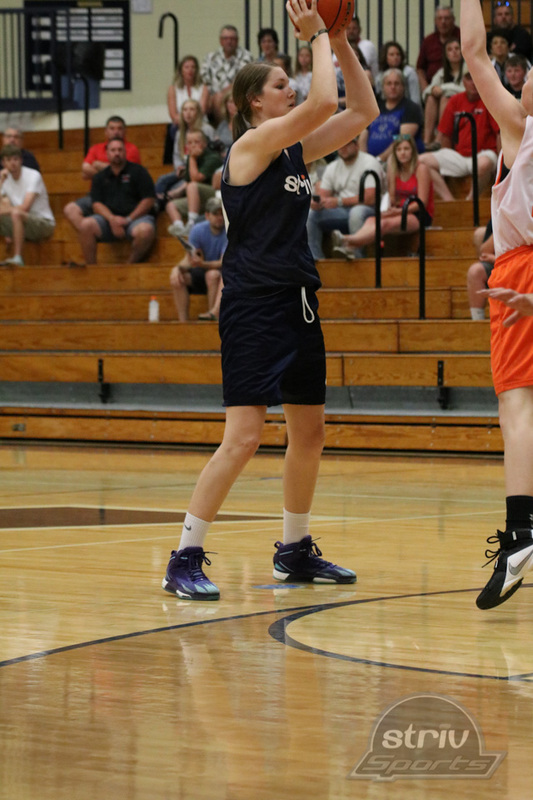 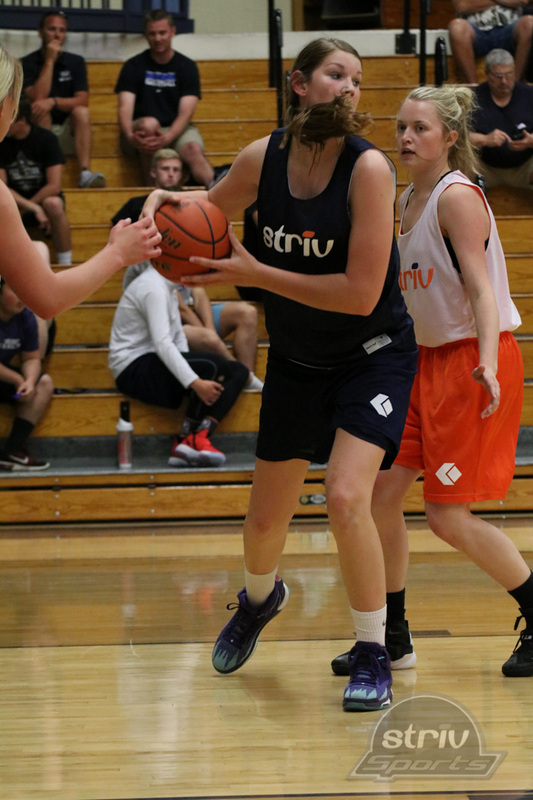 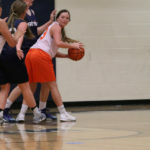 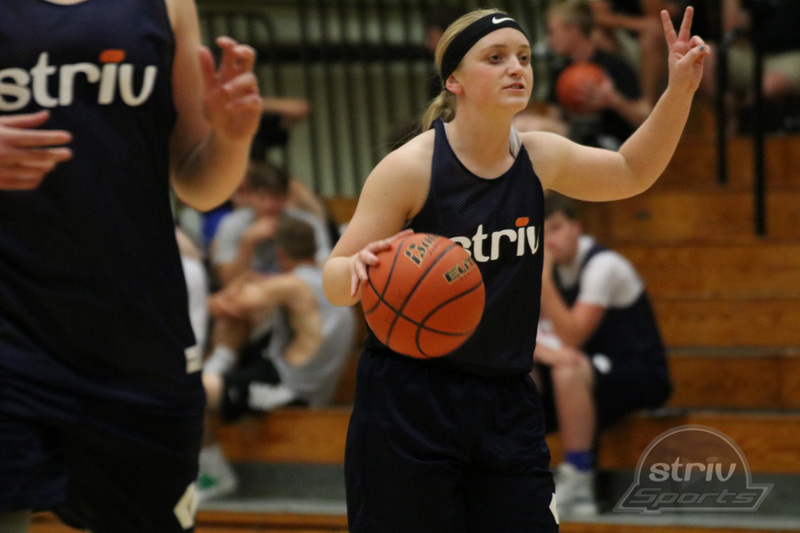 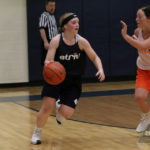 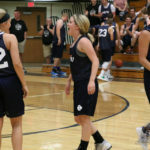 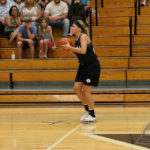 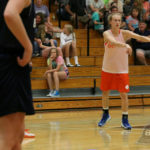 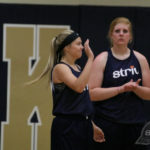 Needing to make a layup, a shot from each elbow, a 3 pointer and a half court shot, the Blue’s Emily Jones banked in her 2nd attempt from half court. 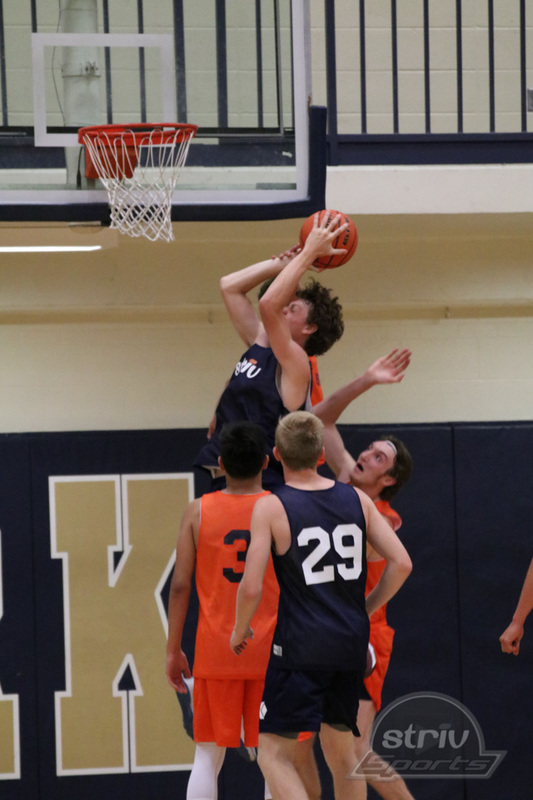 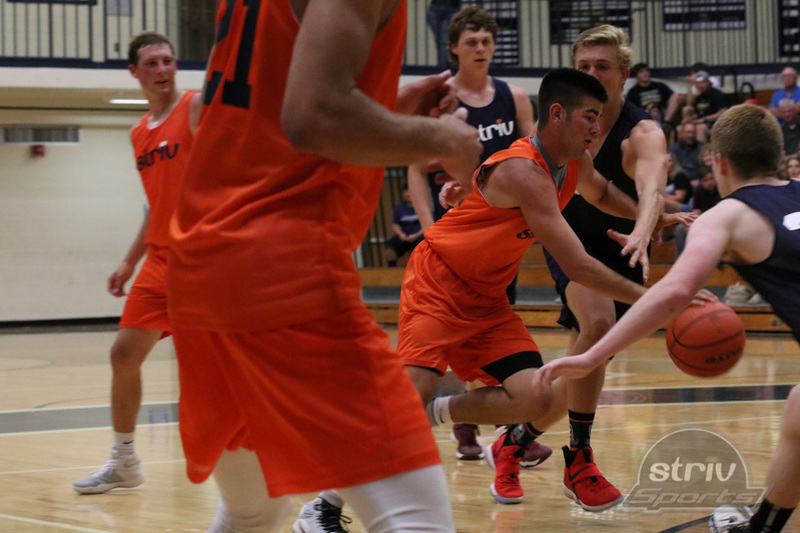 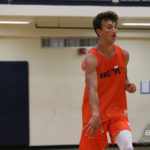 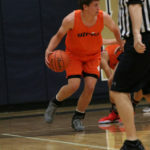 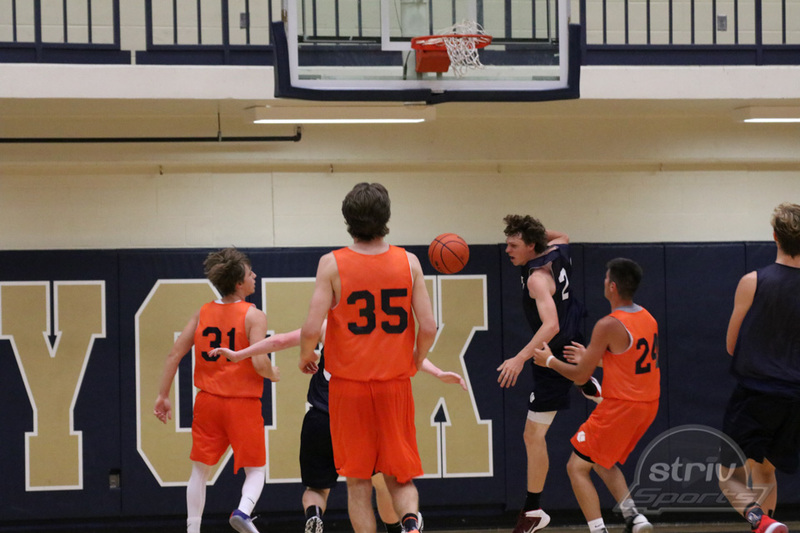 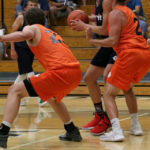 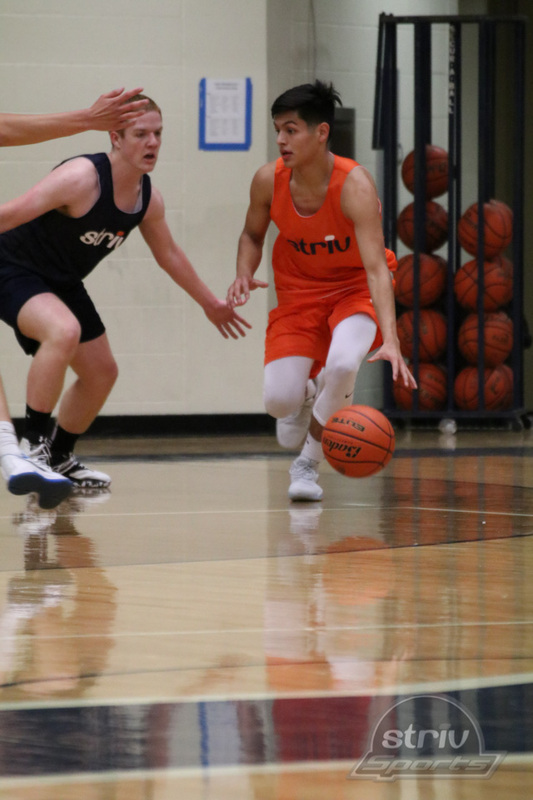 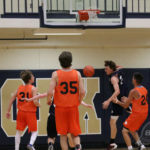 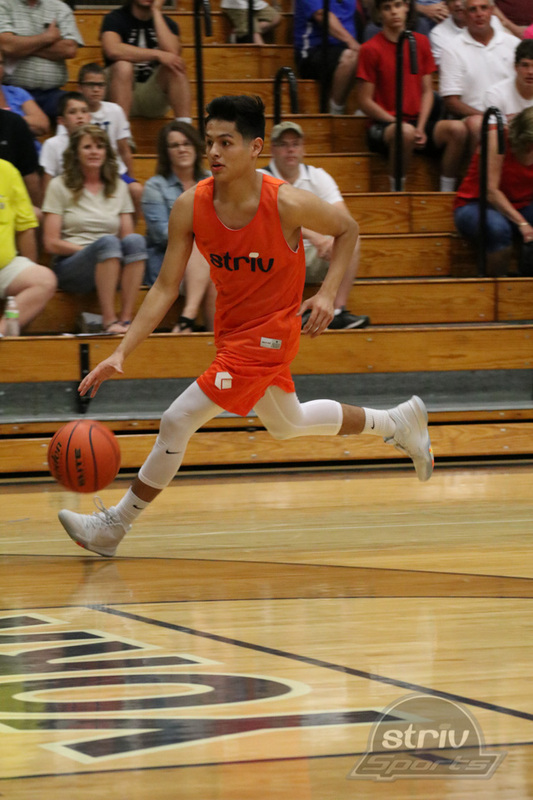 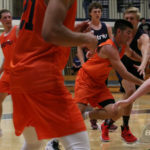 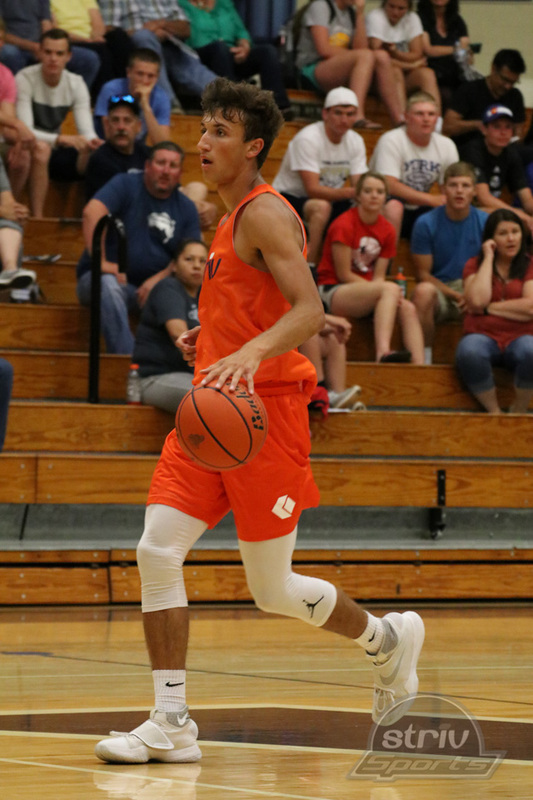 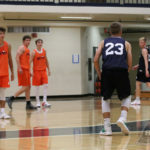 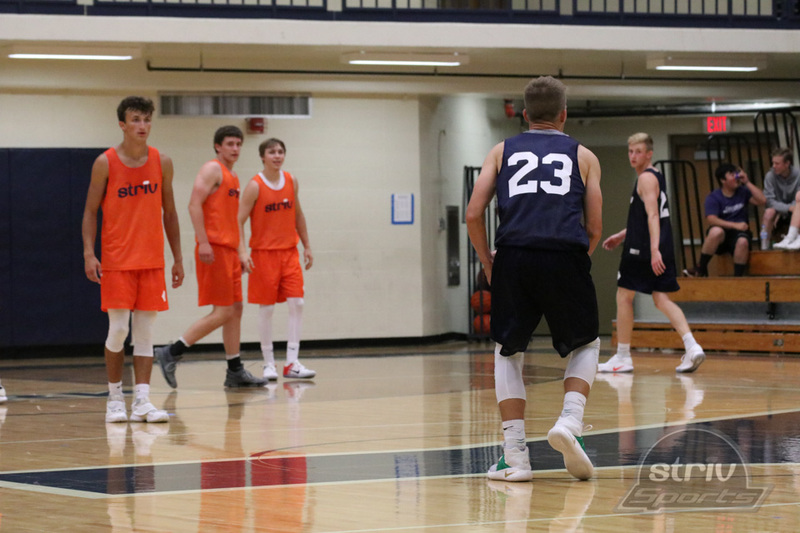 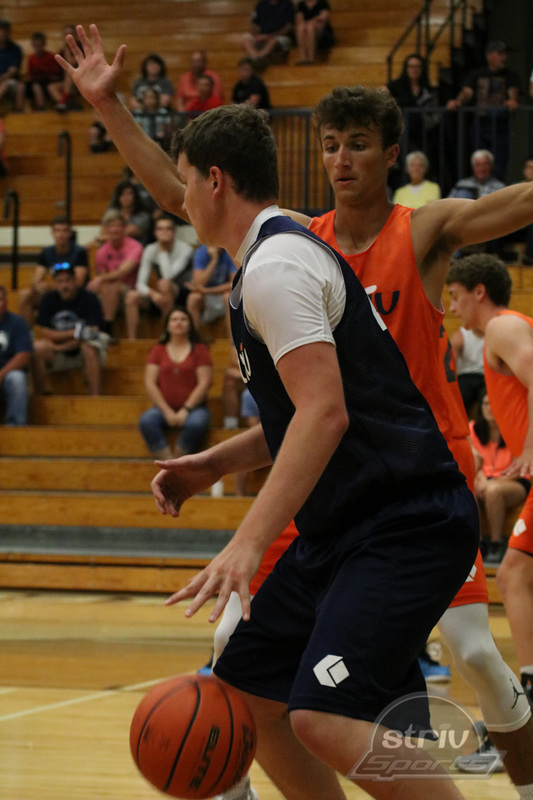 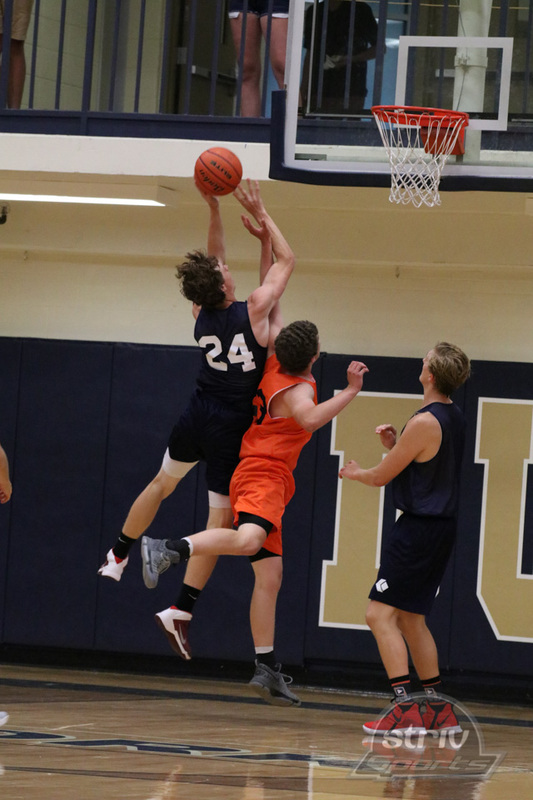 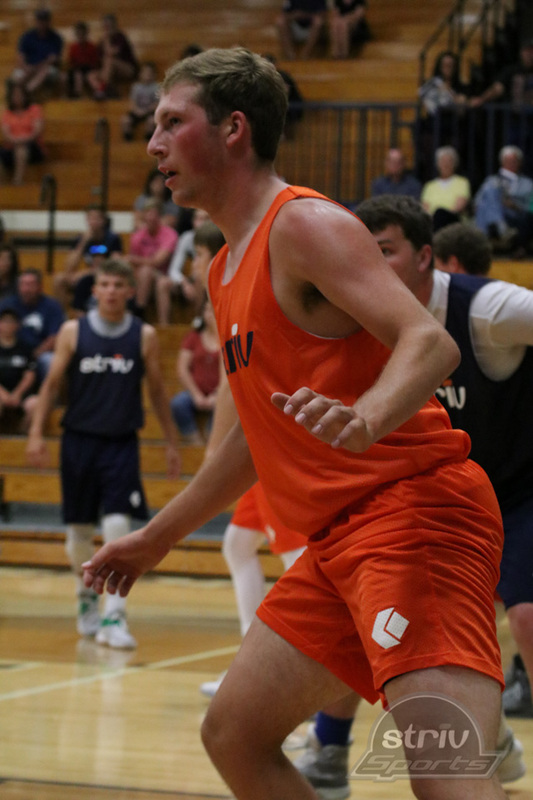 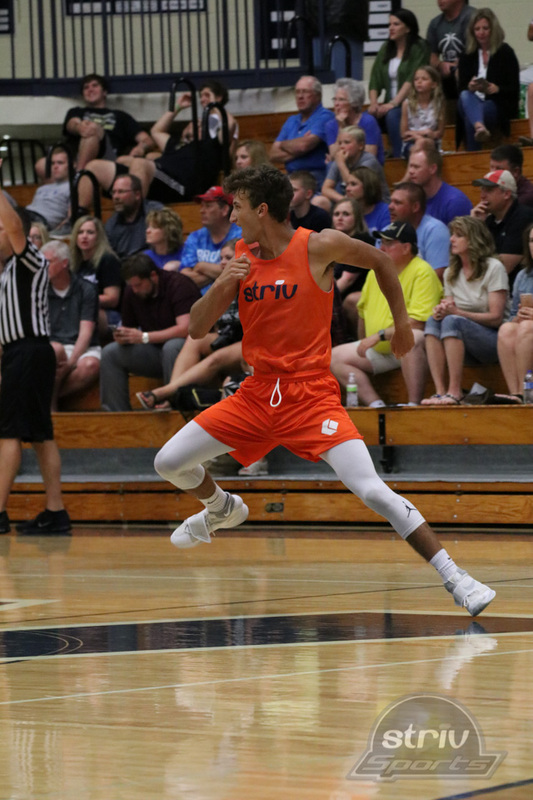 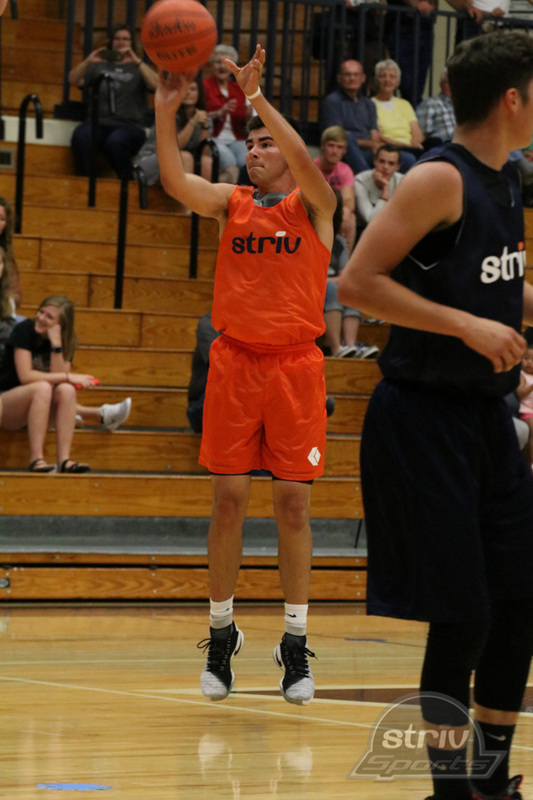 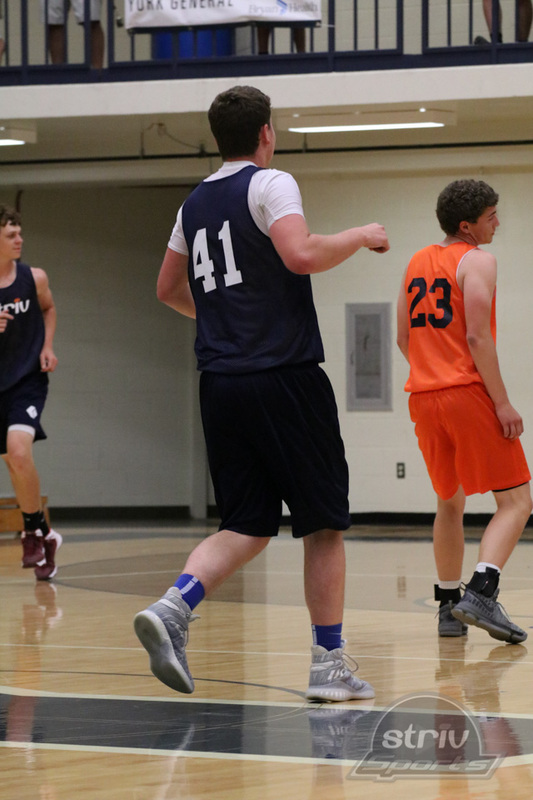 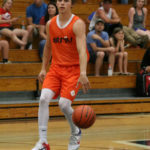 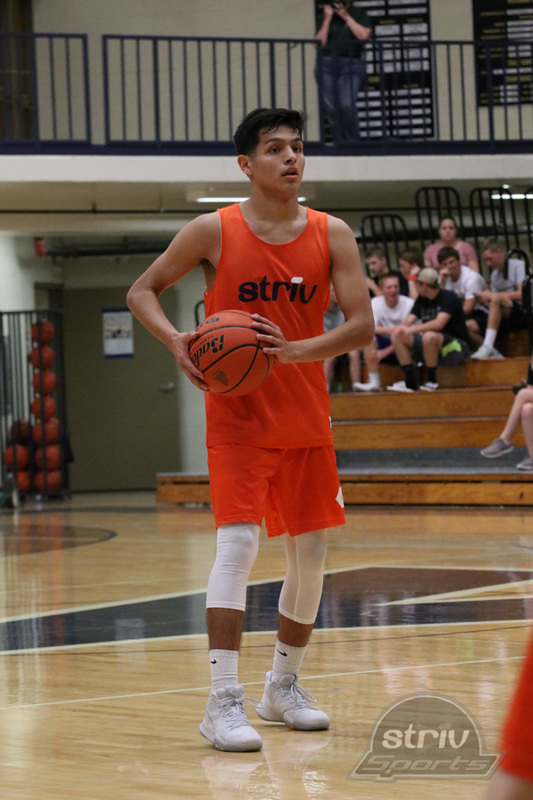 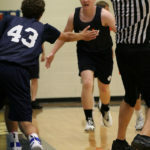 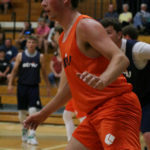 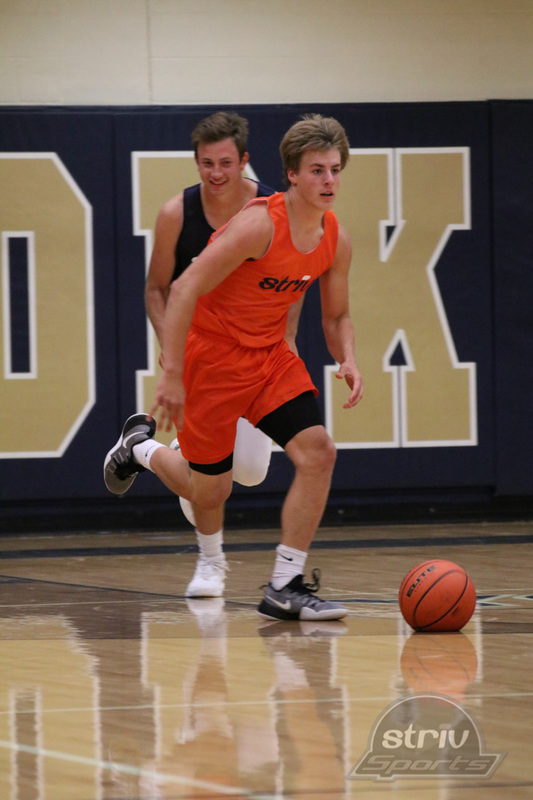 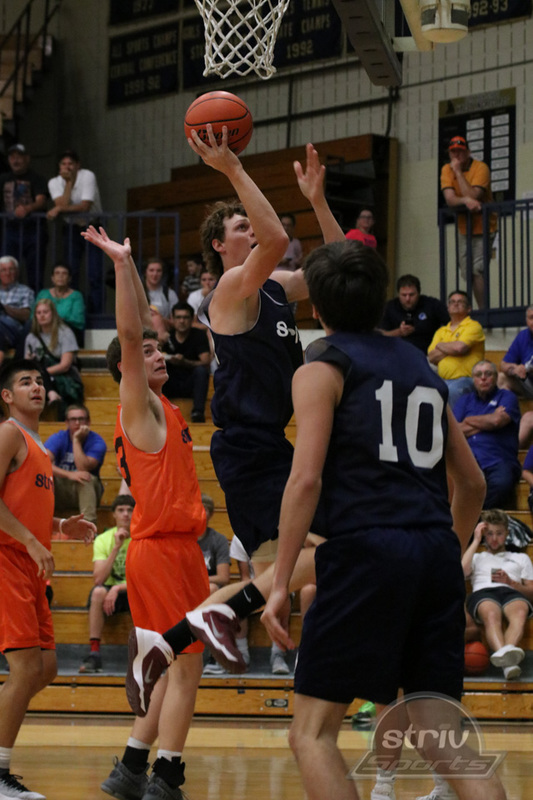 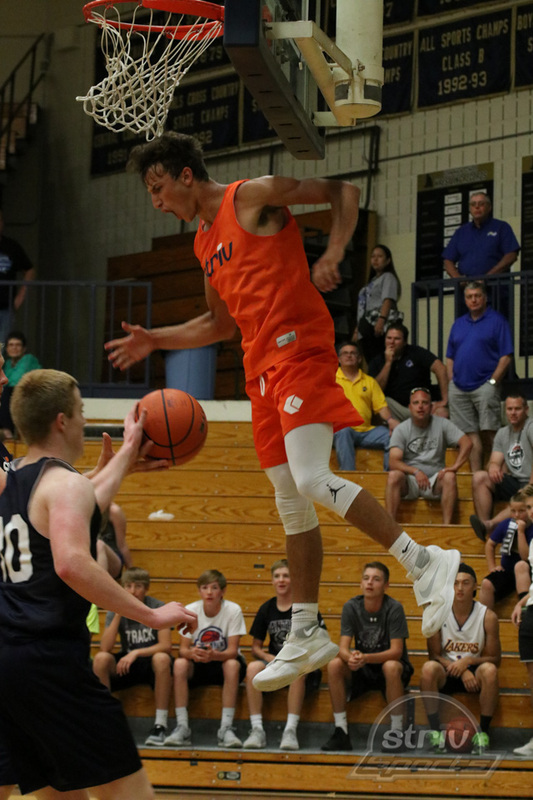 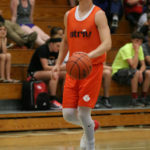 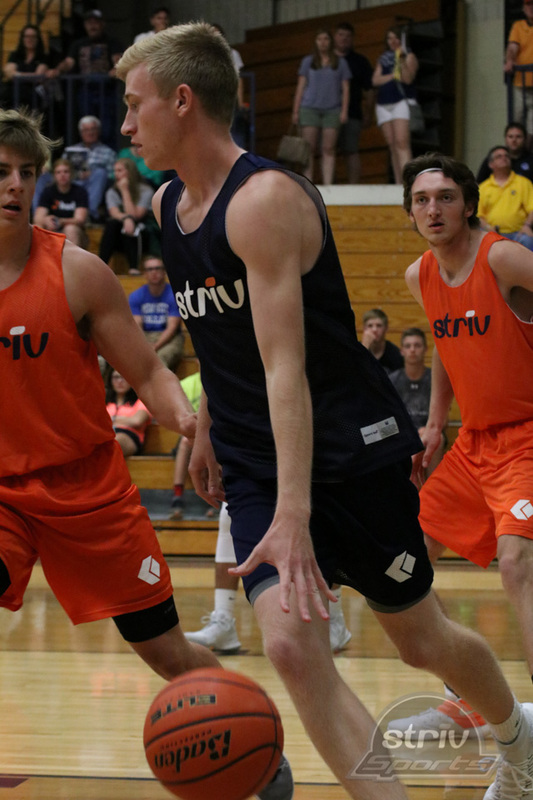 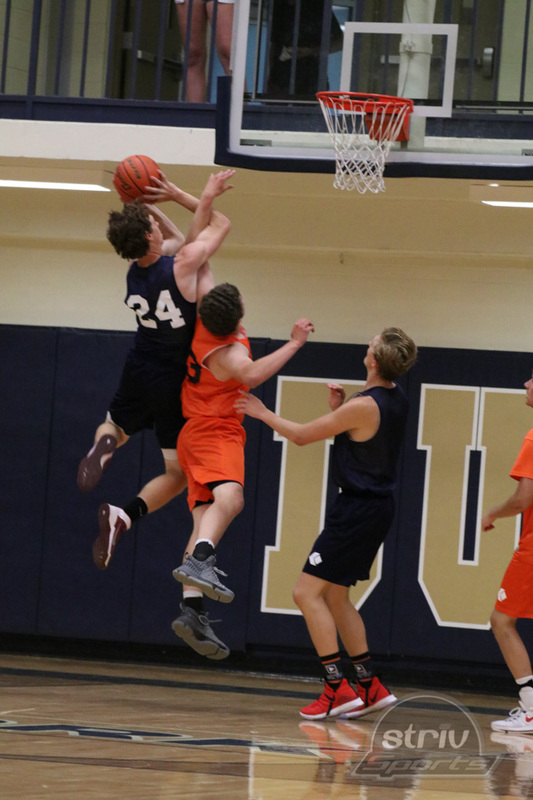 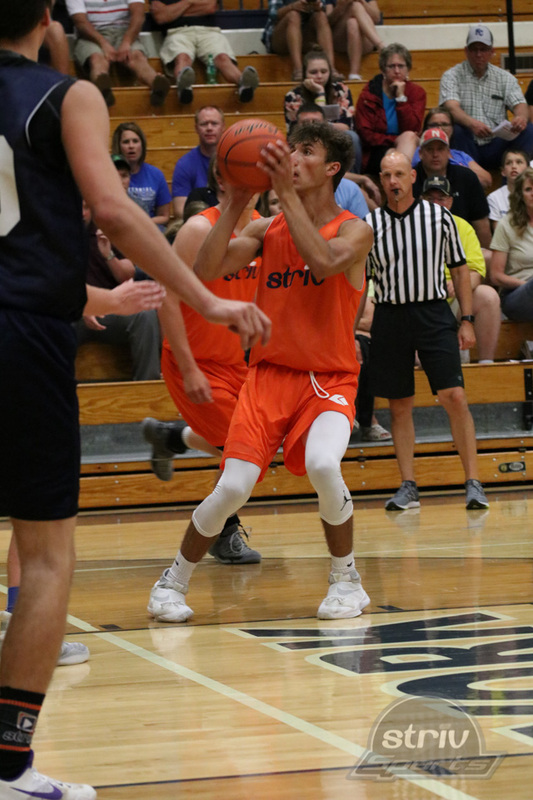 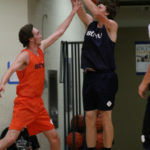 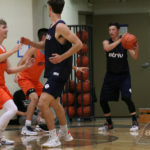 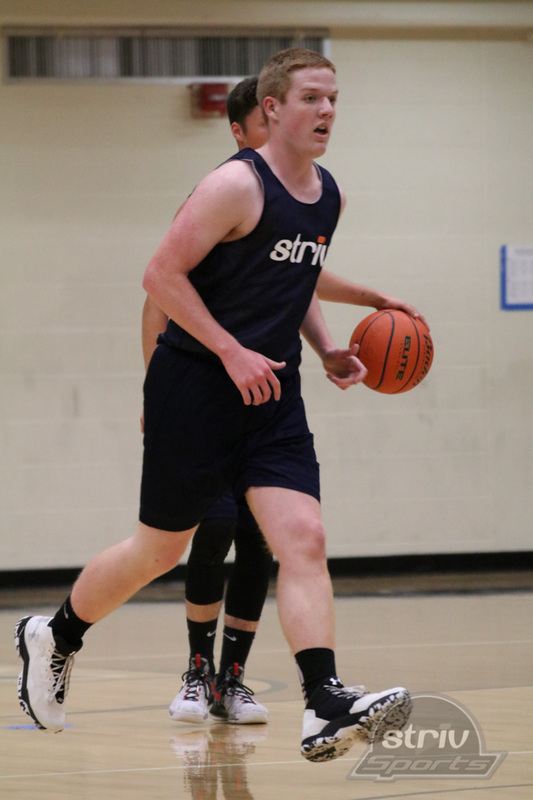 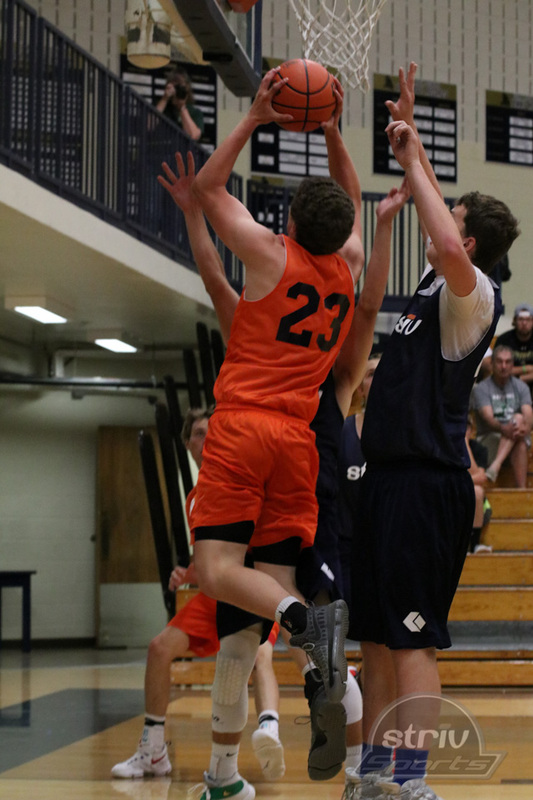 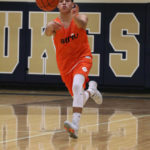 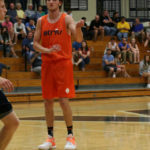 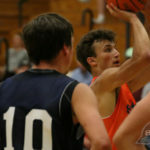 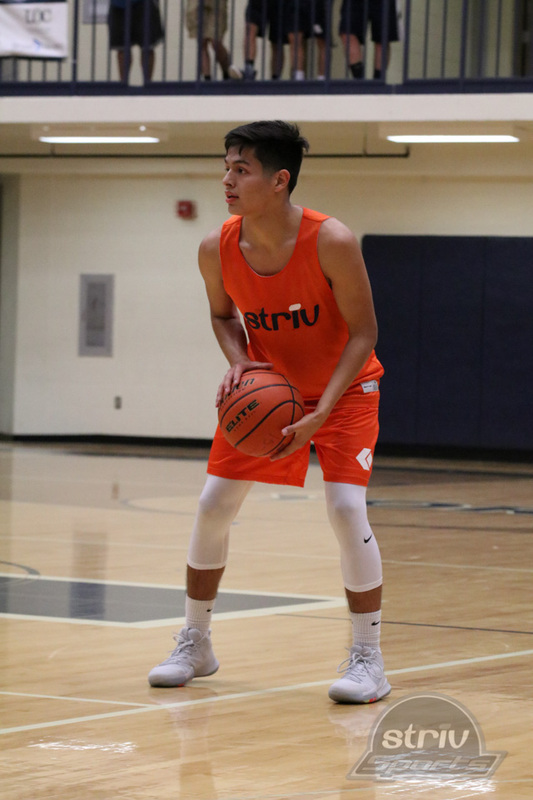 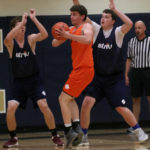 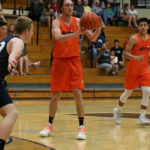 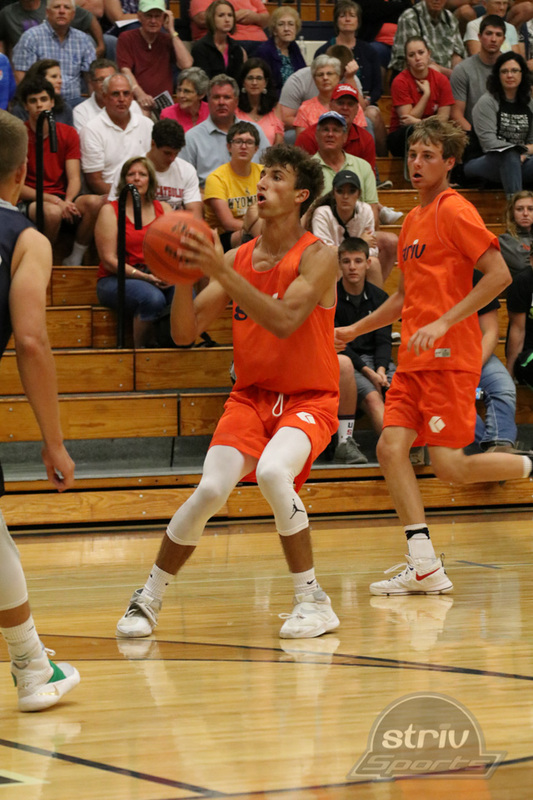 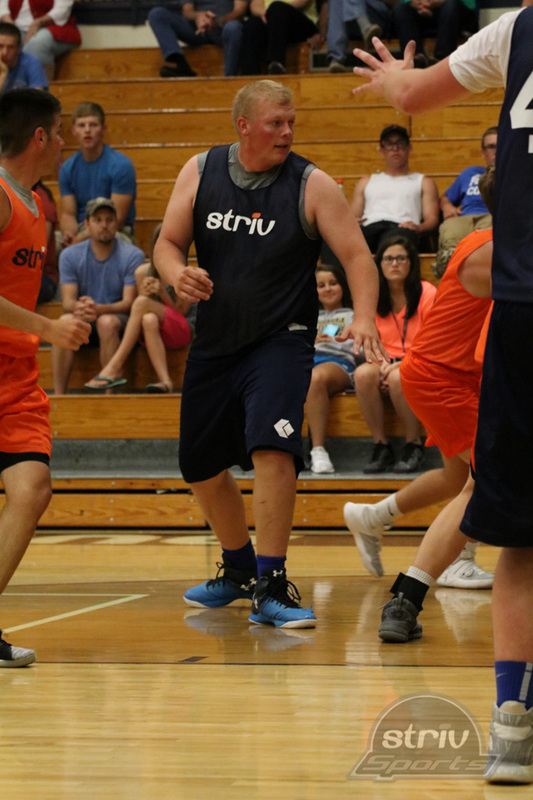 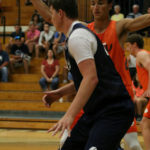 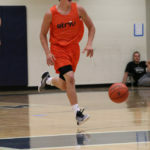 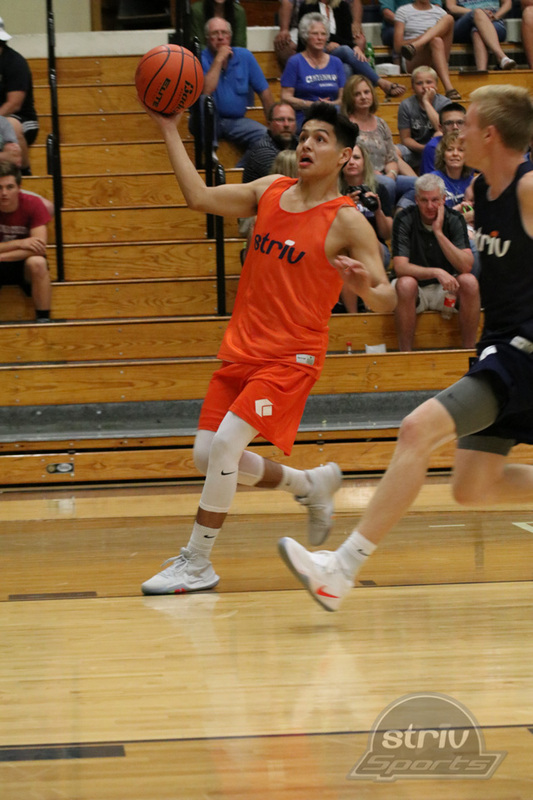 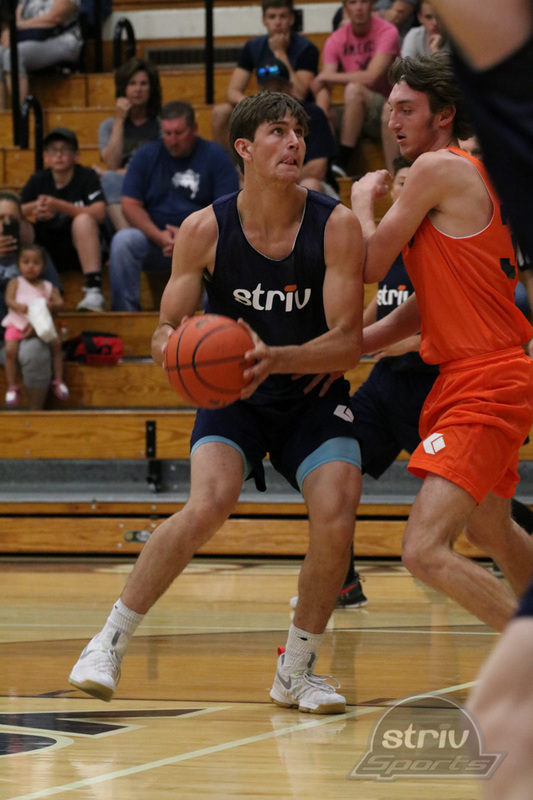 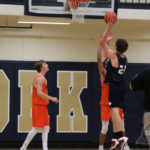 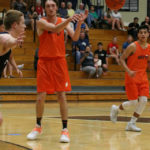 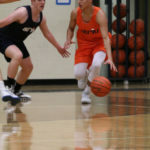 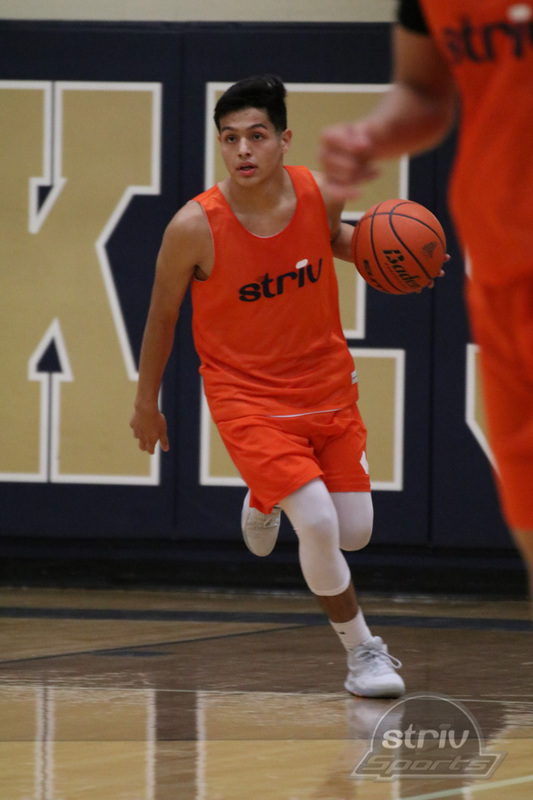 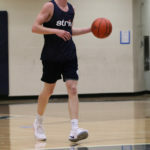 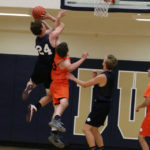 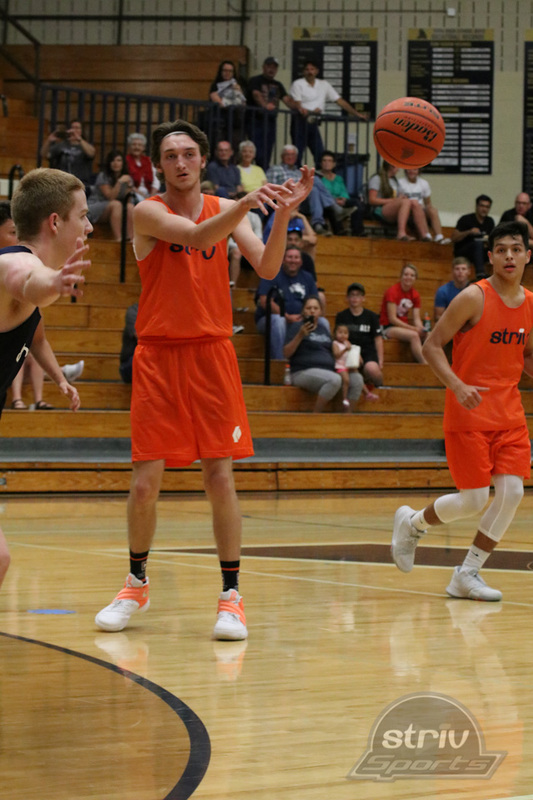 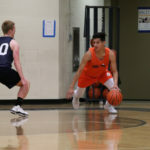 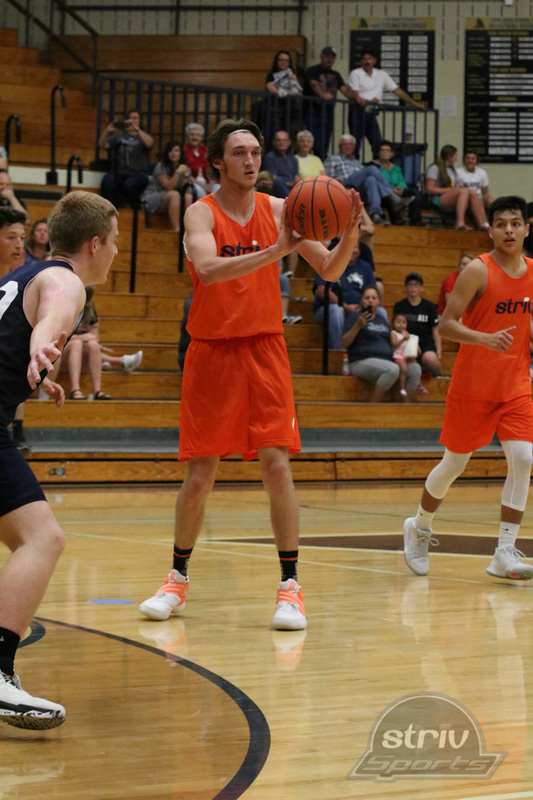 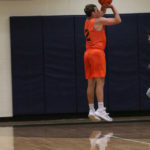 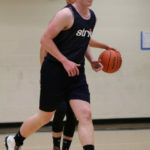 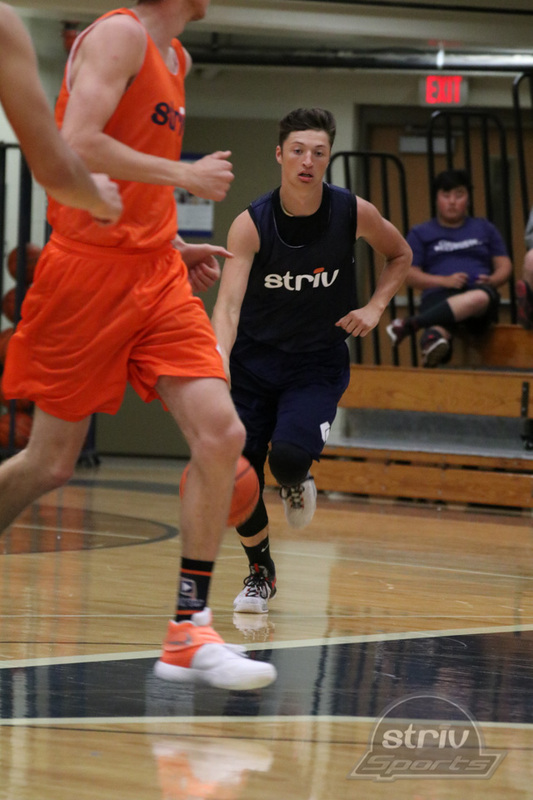 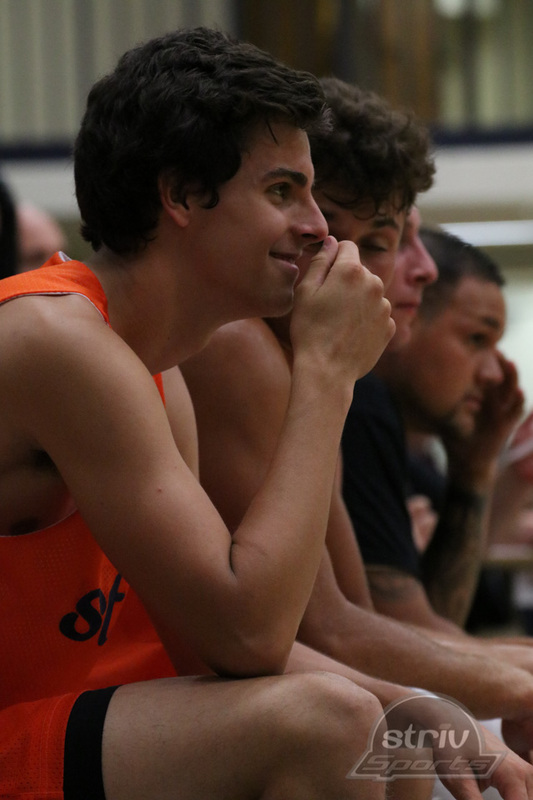 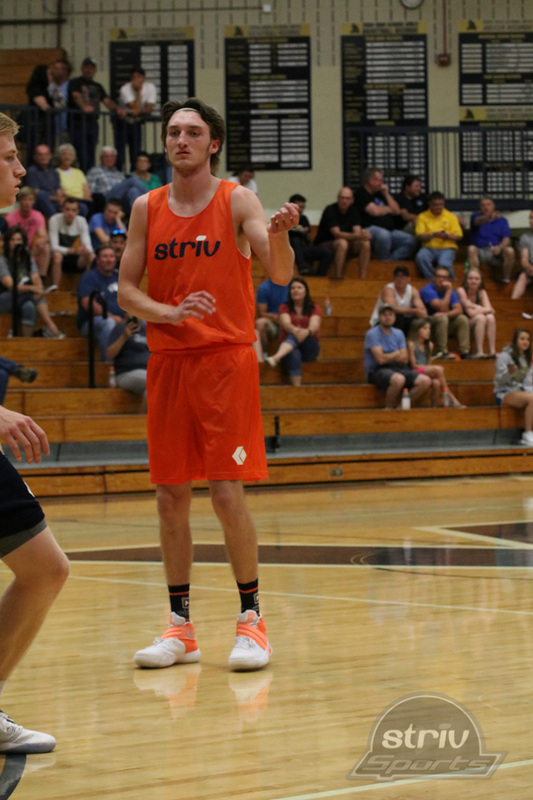 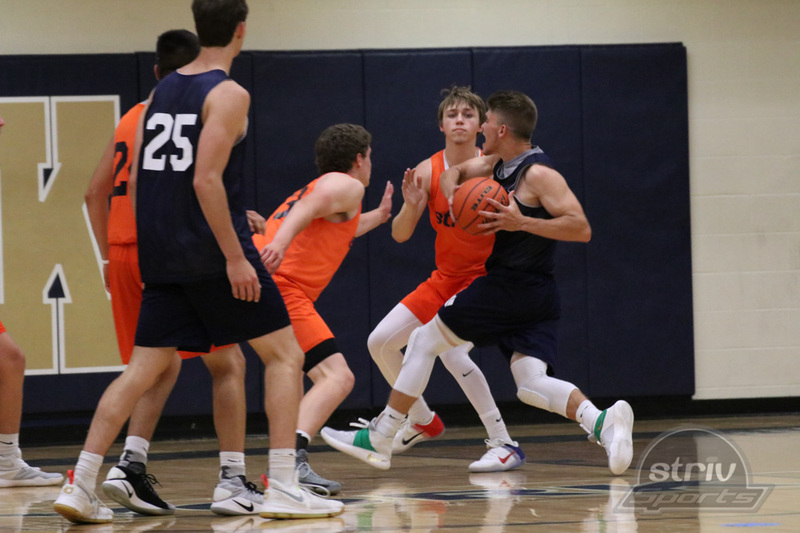 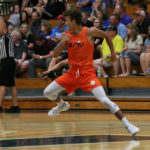 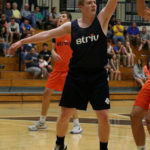 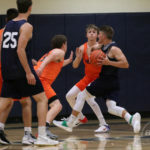 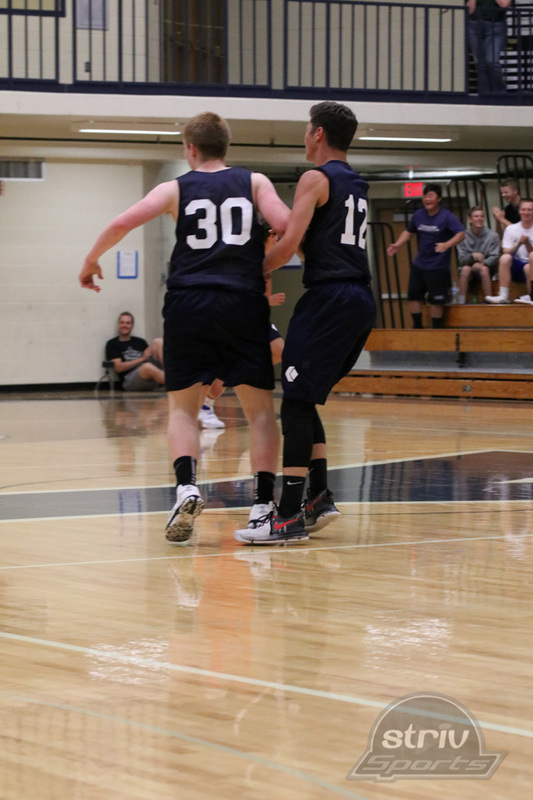 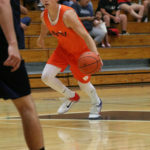 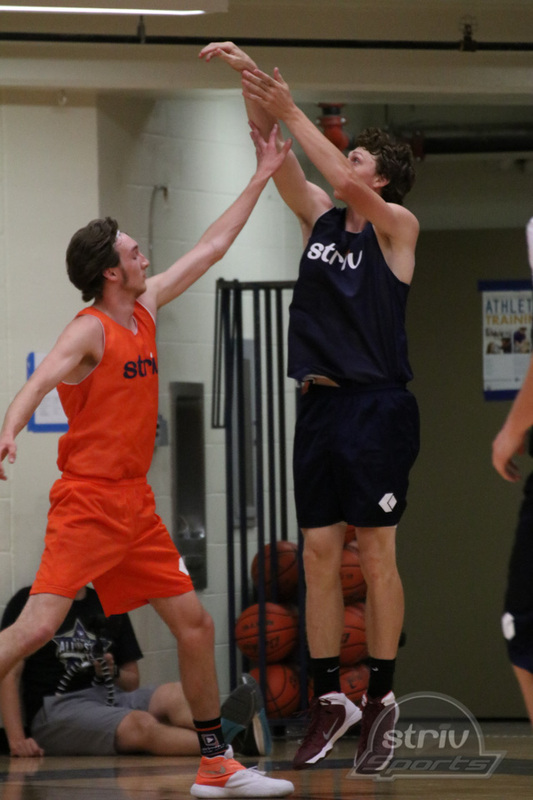 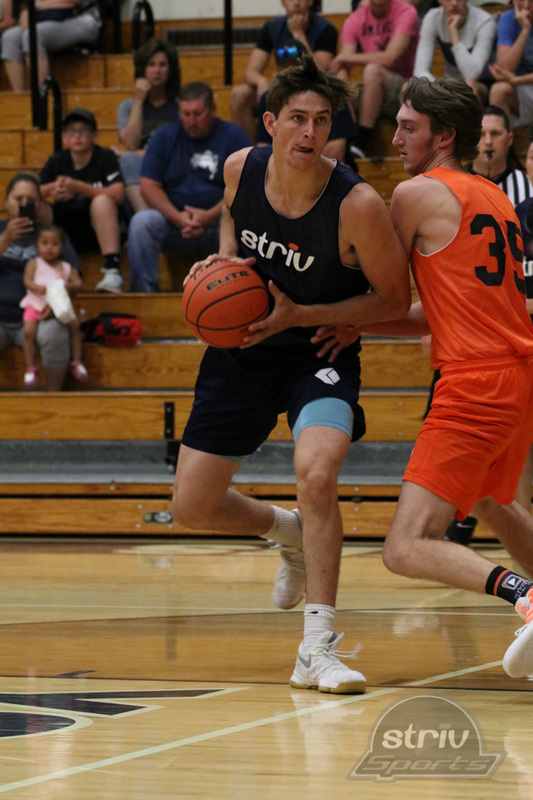 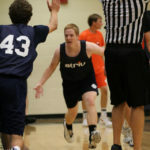 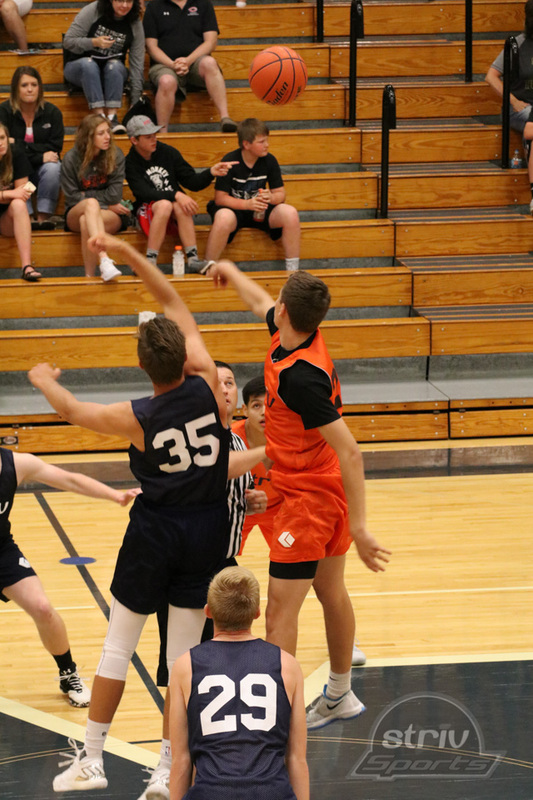 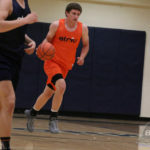 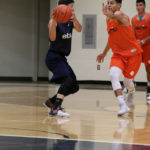 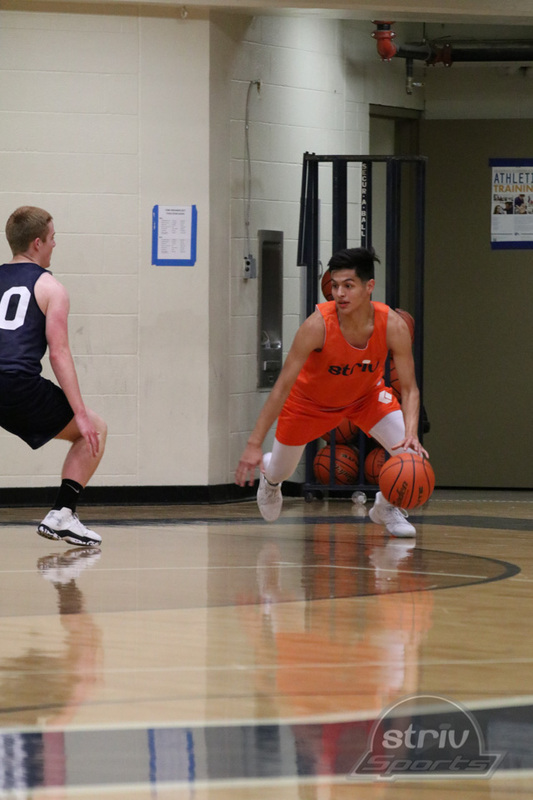 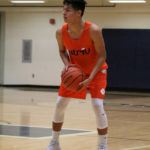 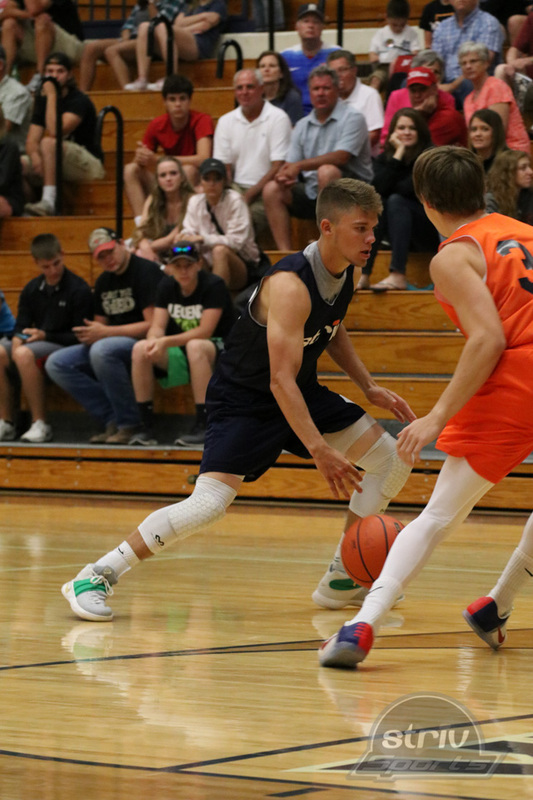 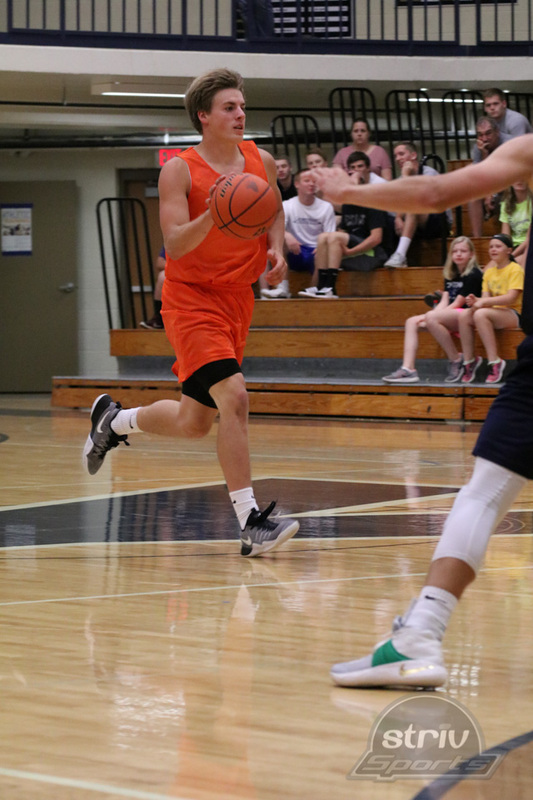 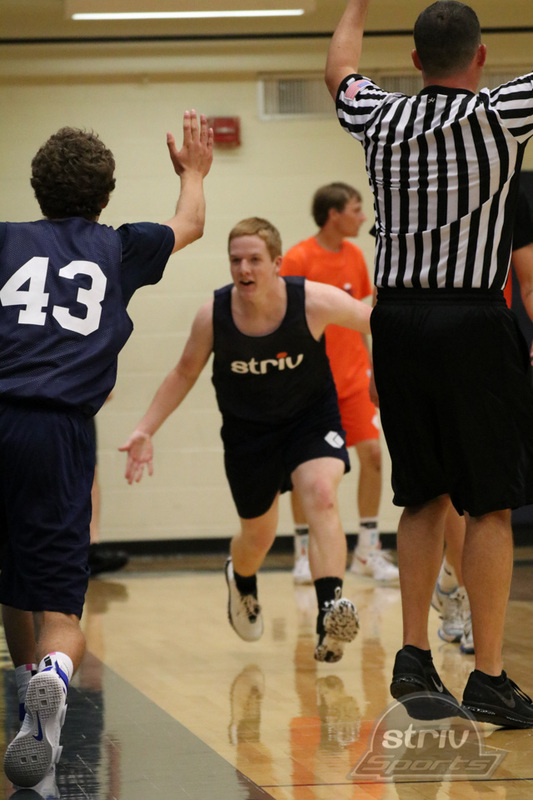 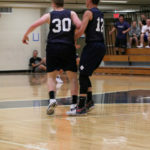 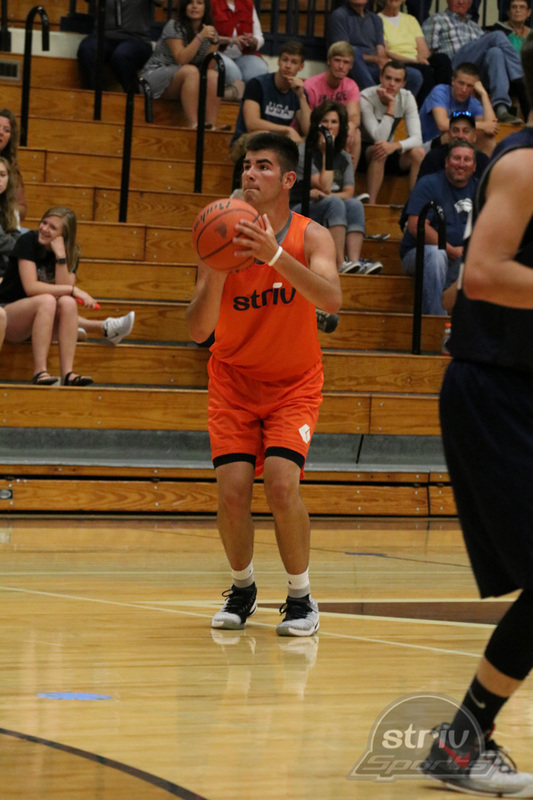 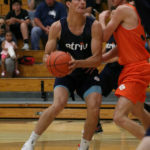 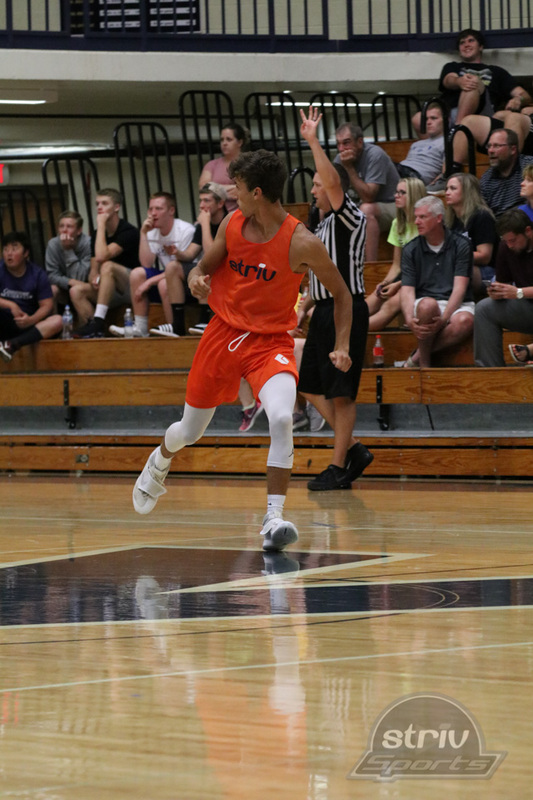 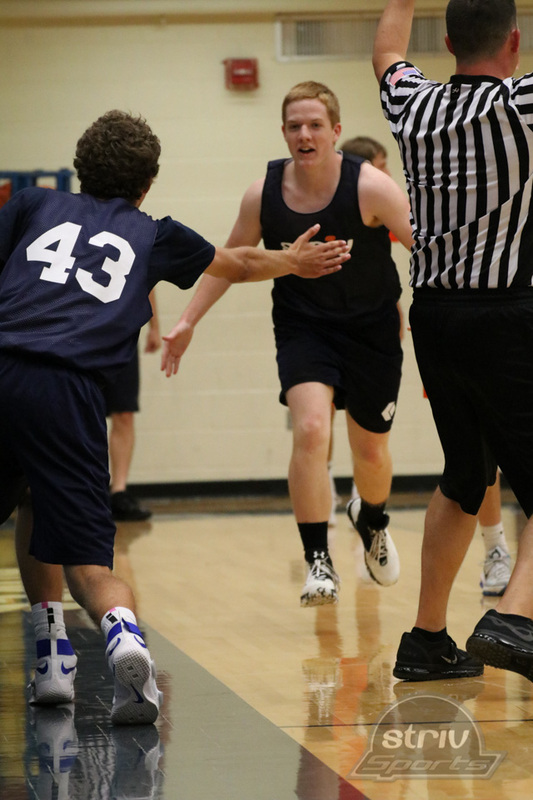 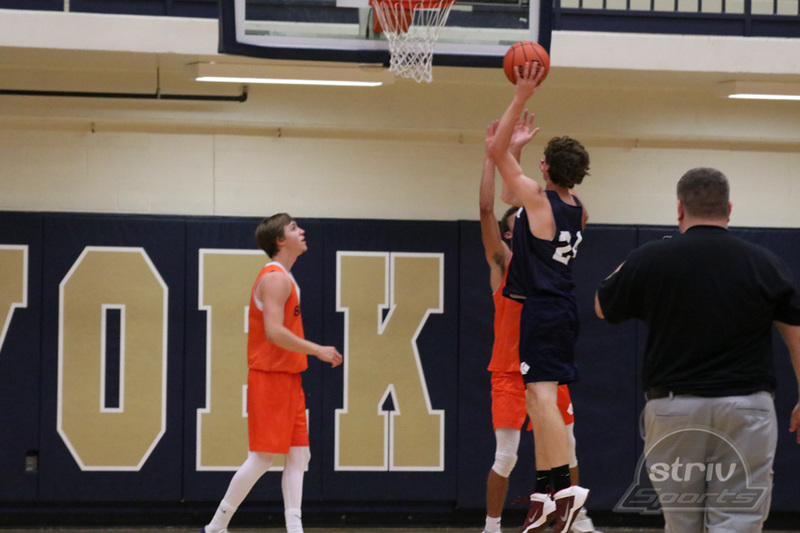 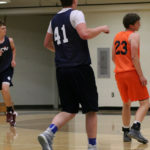 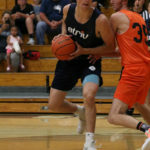 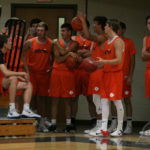 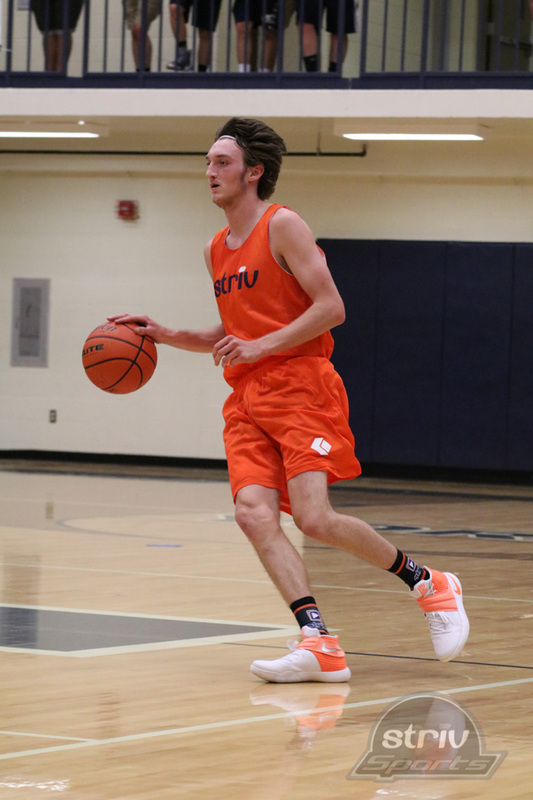 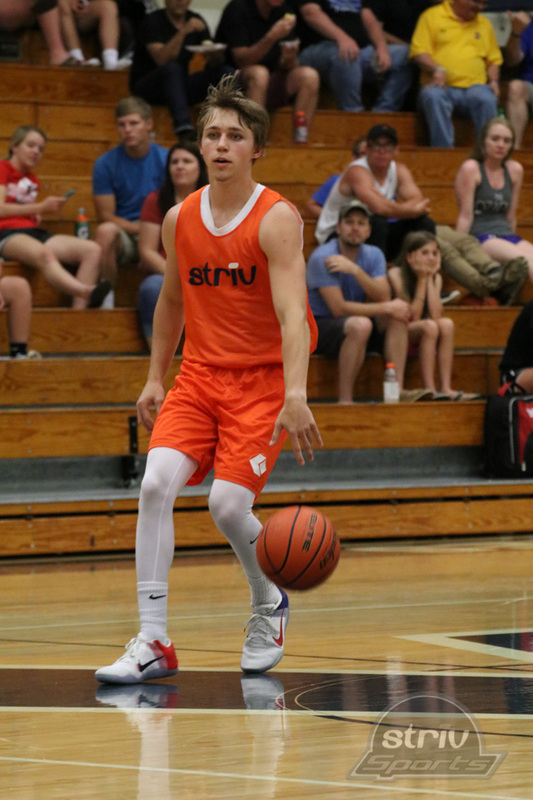 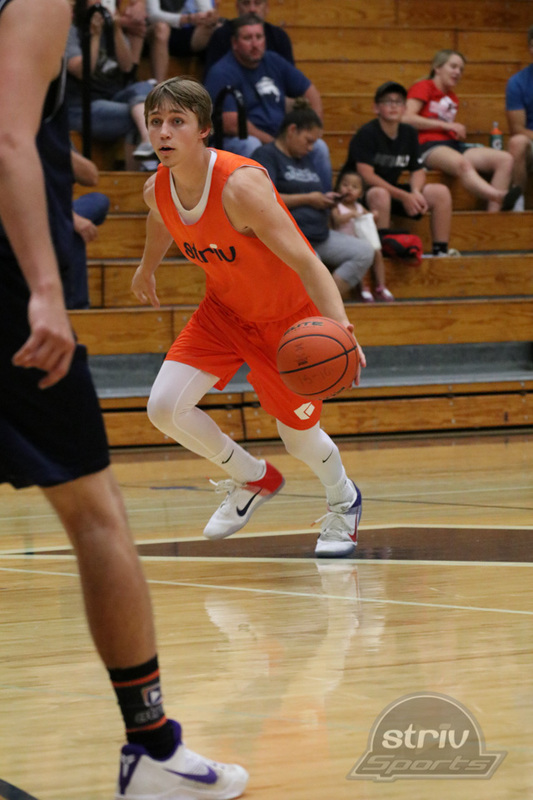 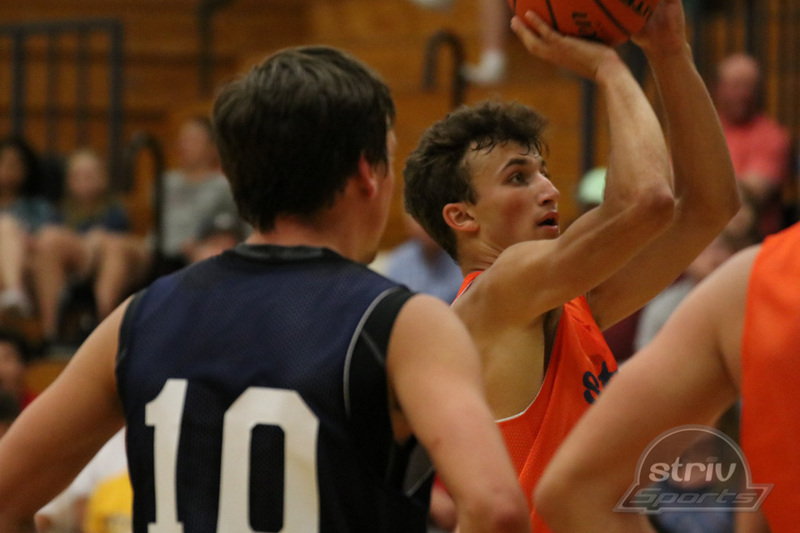 The boys game left little doubt as the Blue team got hot midway through the second quarter and never looked back in a 130-93 win over the Orange. 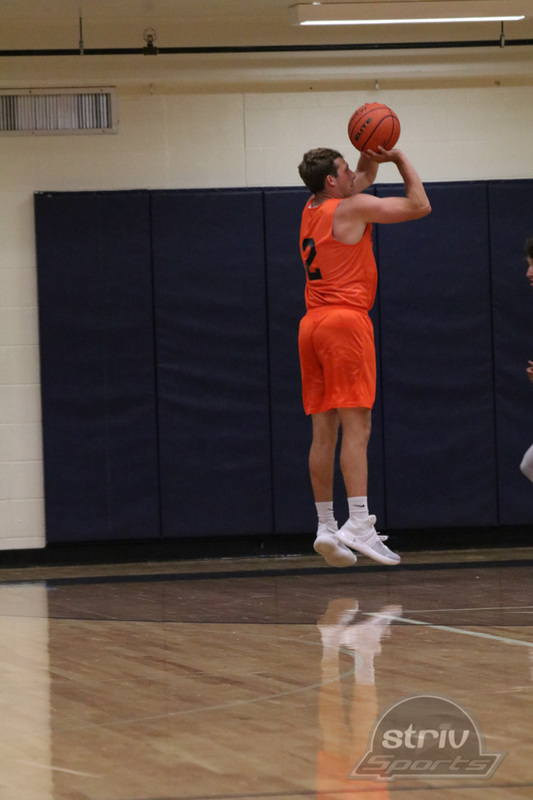 The Orange lead 23-21 after one quarter and extended the lead to double digits in the second when Dylan McKee (Malcolm) hit three consecutive 3-point baskets. 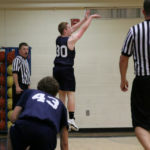 Then it was all Blue. 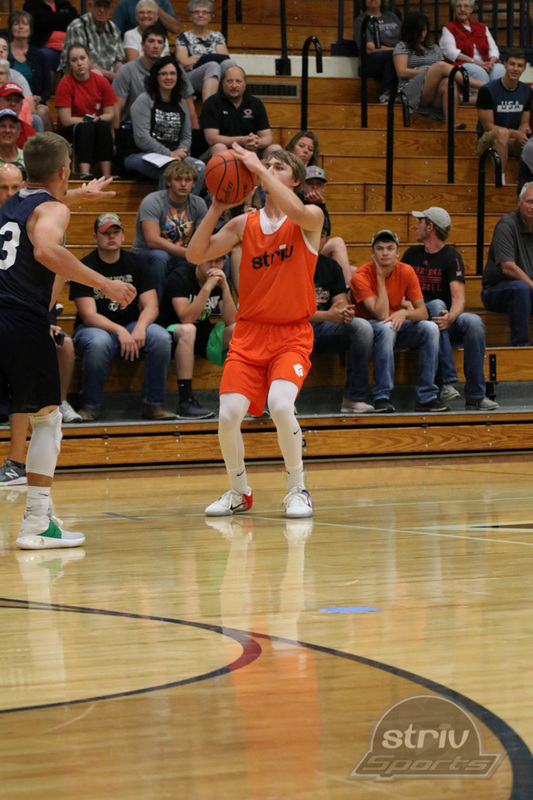 They stormed back to a 56-49 half lead while setting the game record for points in a quarter at 35. 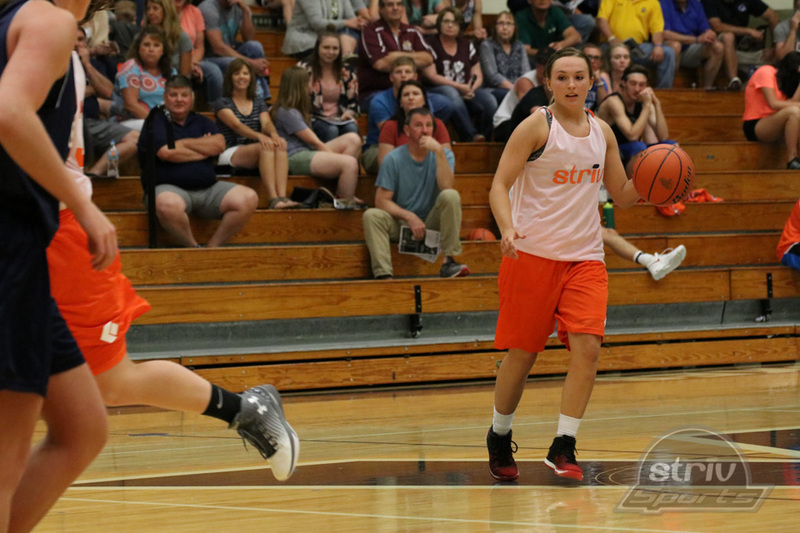 They broke it again in the third with 37 points as they held a 93-68 lead after three quarters. 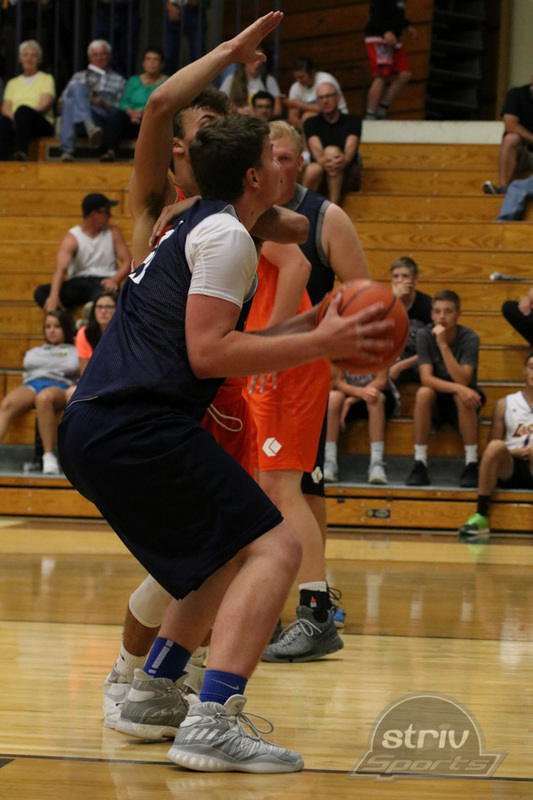 In breaking open the contest in the middle two periods, the Blue shot a mind-blowing 26-for-37 from the field. 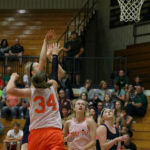 They also tied a game-record with 22 3-point baskets. 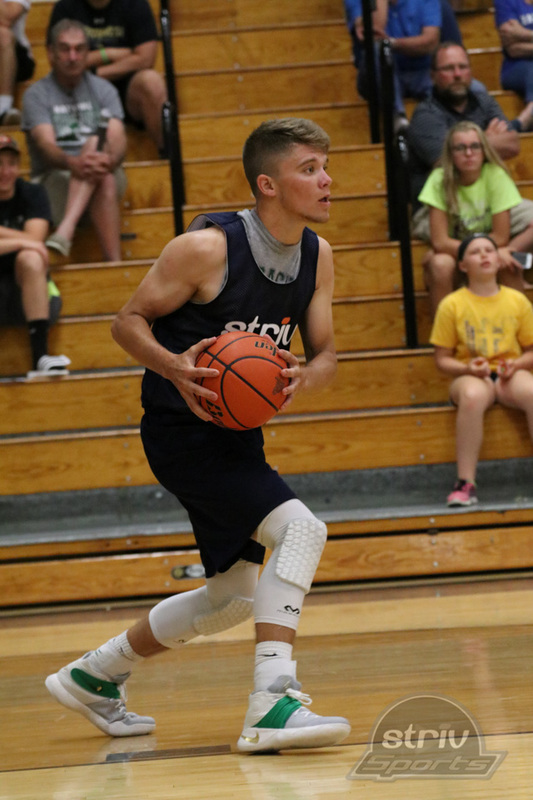 Jaidon Policky (Milford) led six players in double digits with 22 points for the Blue. 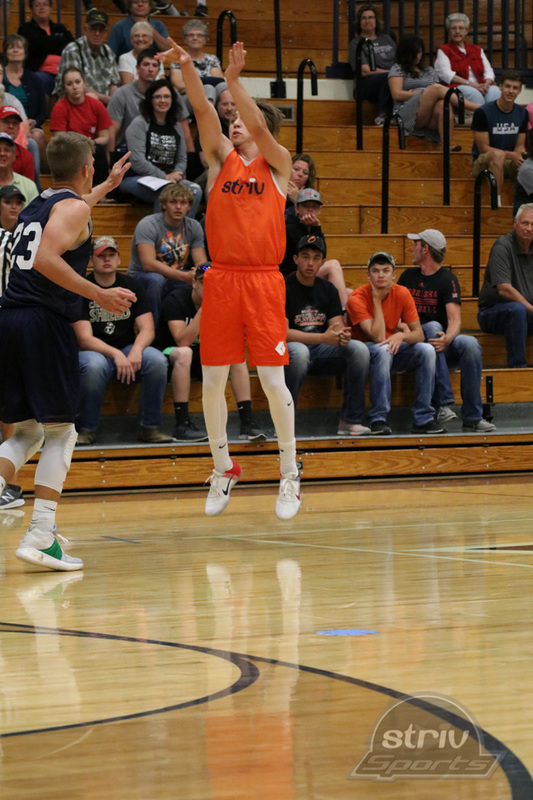 Monty Roberts (Syracuse) added 19, Blaine Emerson (Cozad) and John Irwin (York) 17, Devon Wagoner (Sutton) 13 and Adam Hoarty (Fillmore Central) 12. 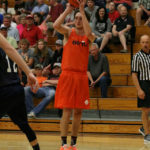 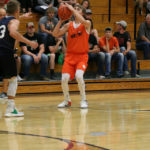 For the Orange, Falls City’s Kyle Leafty had 18 points, McKee had 17, Miles Griffith (St. Paul) had 15, Drake Gorrin (Winnebago) 12 and Cole Eggert (Elmwood-Murdock) added 10. 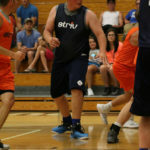 Photos have not been straightened, cropped or color corrected. 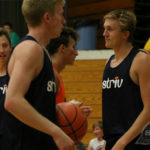 If you’d like to purchase an edited full-size photo, please contact us via email at austin@striv.tv. 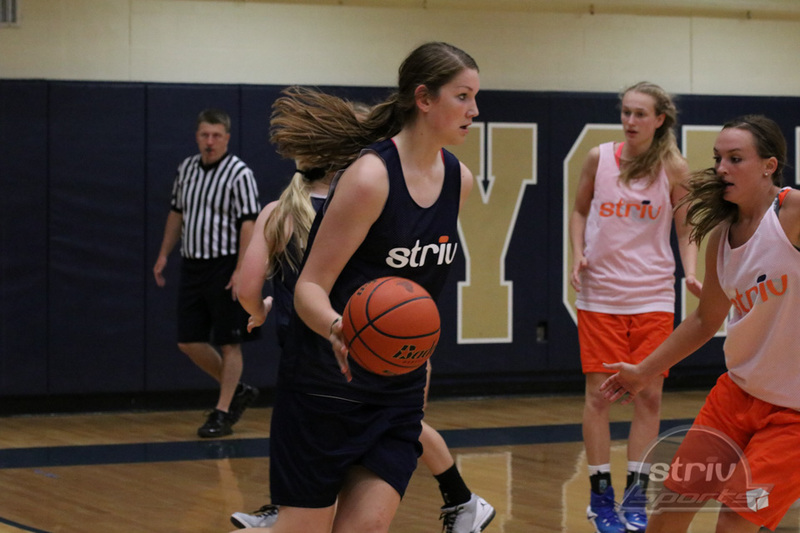 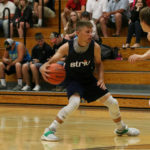 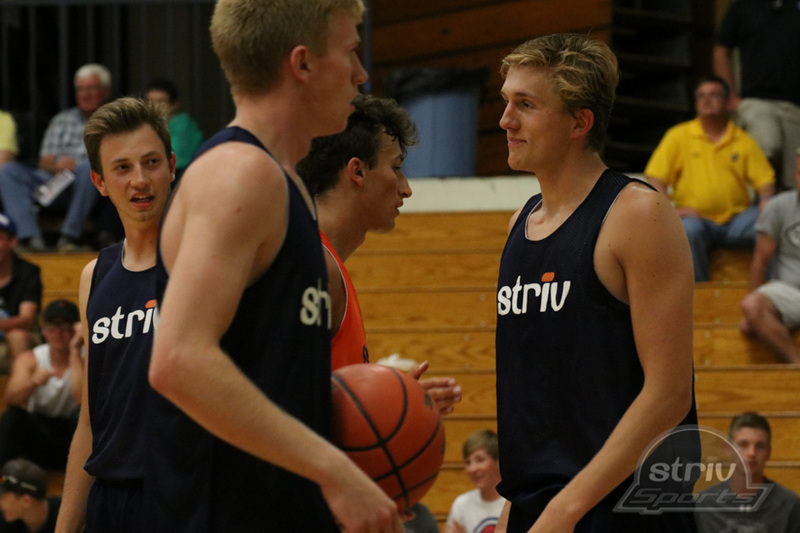 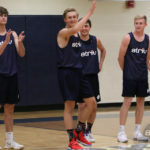 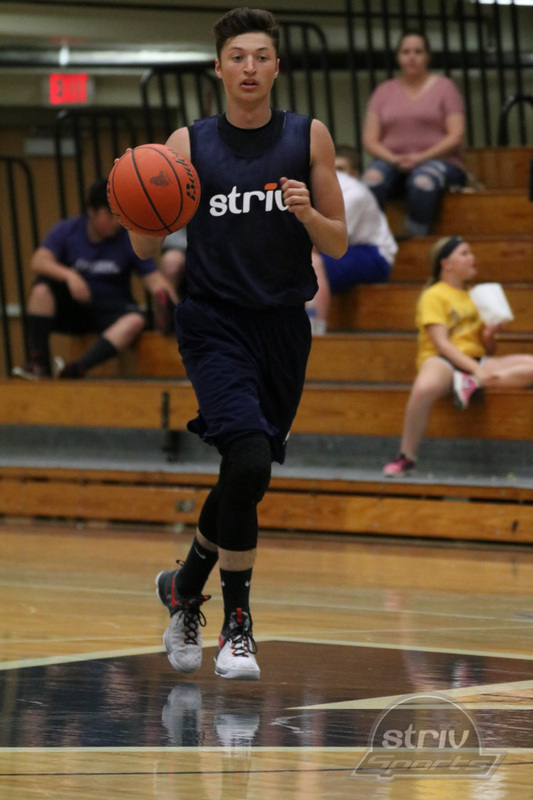 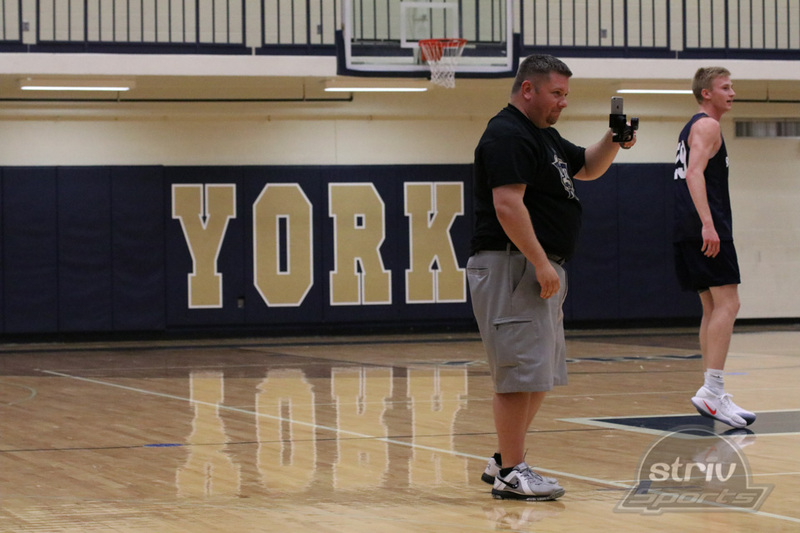 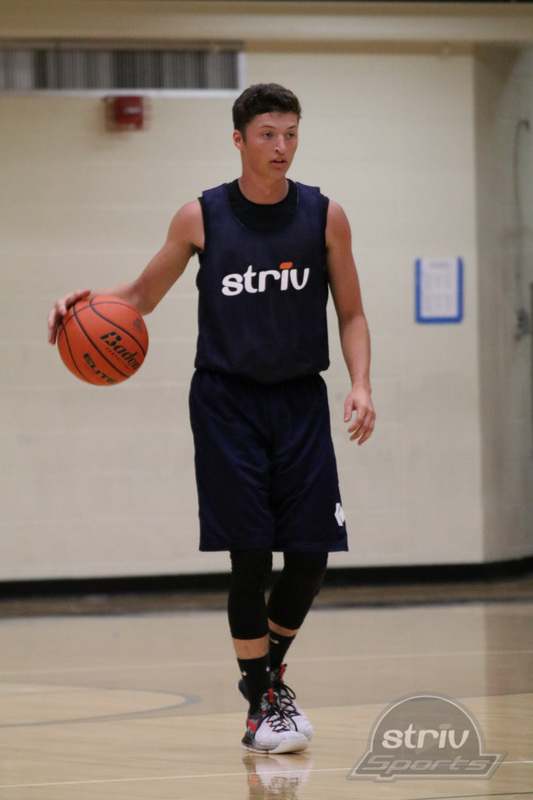 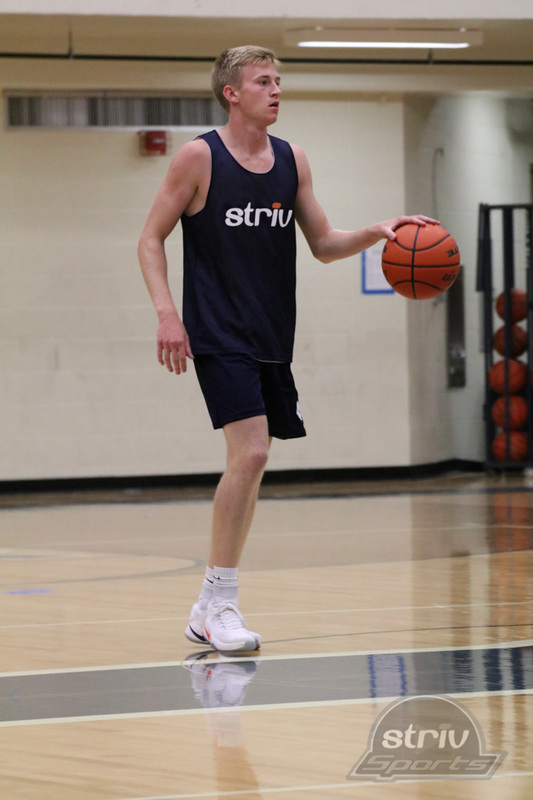 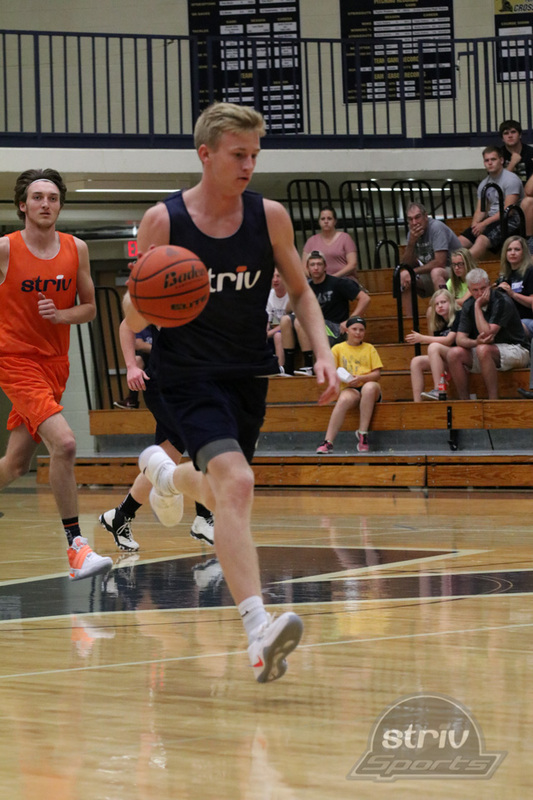 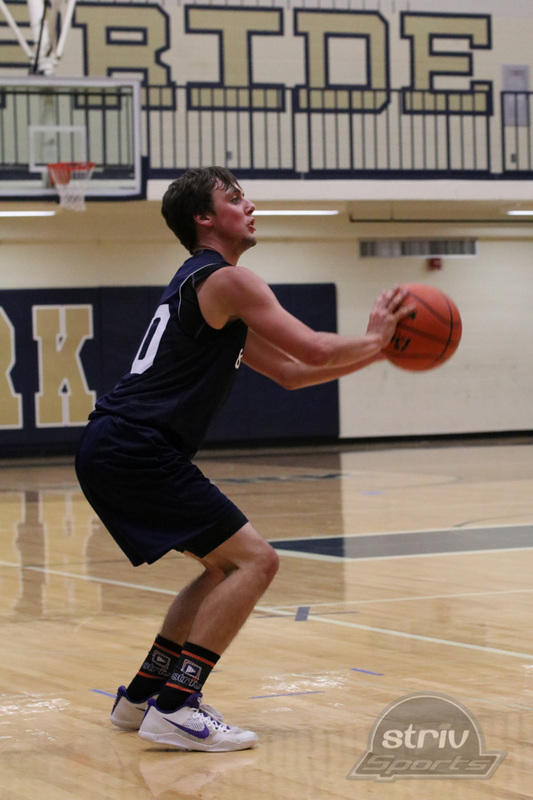 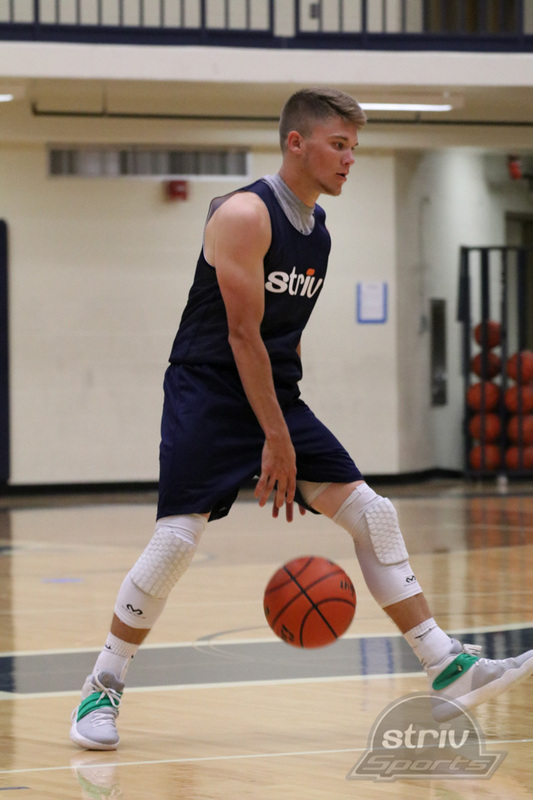 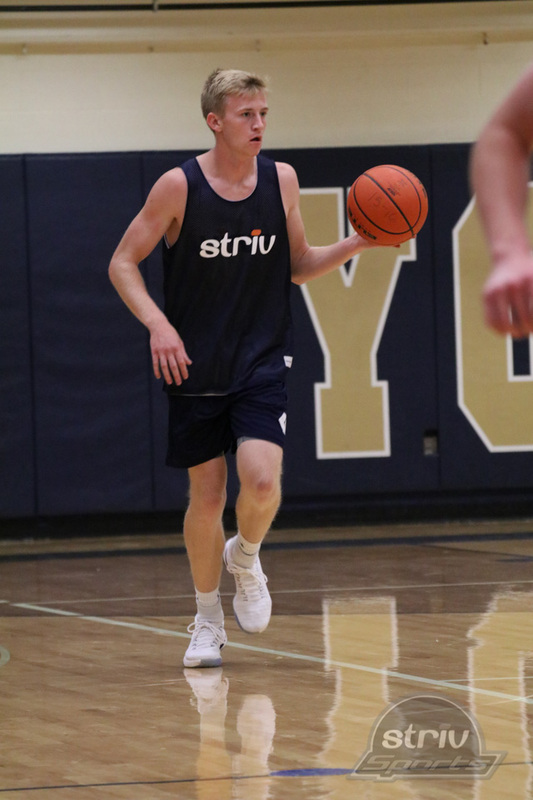 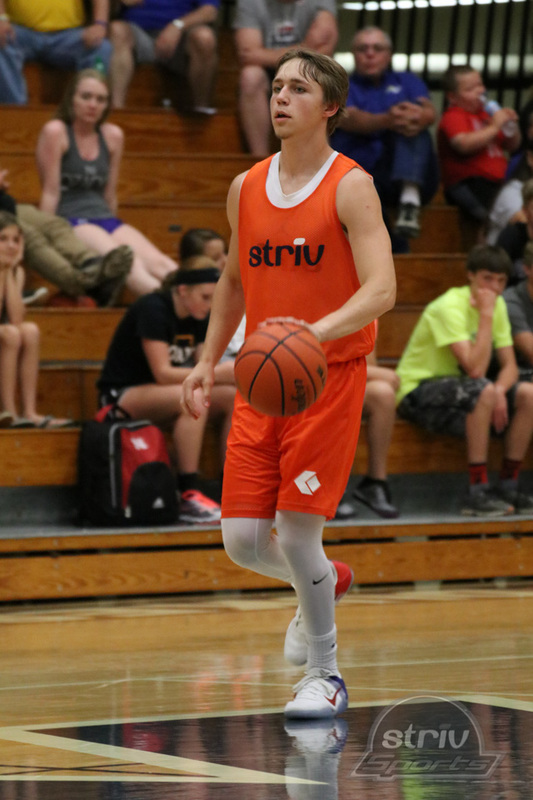 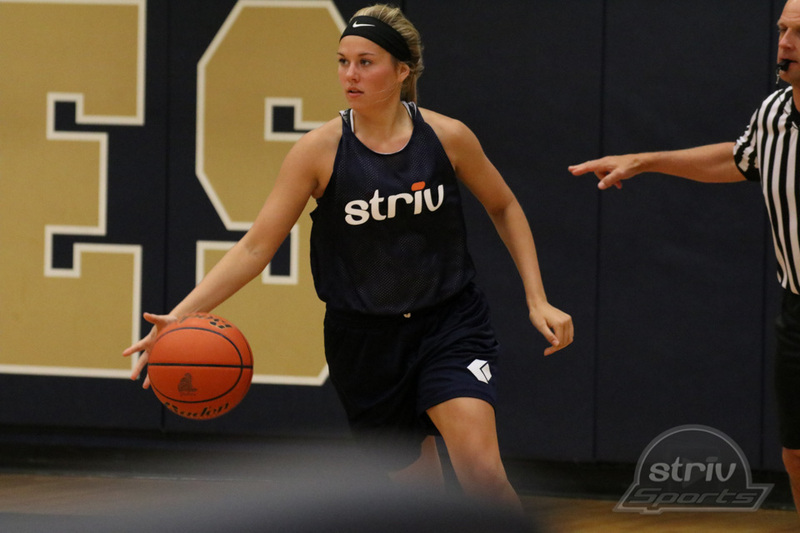 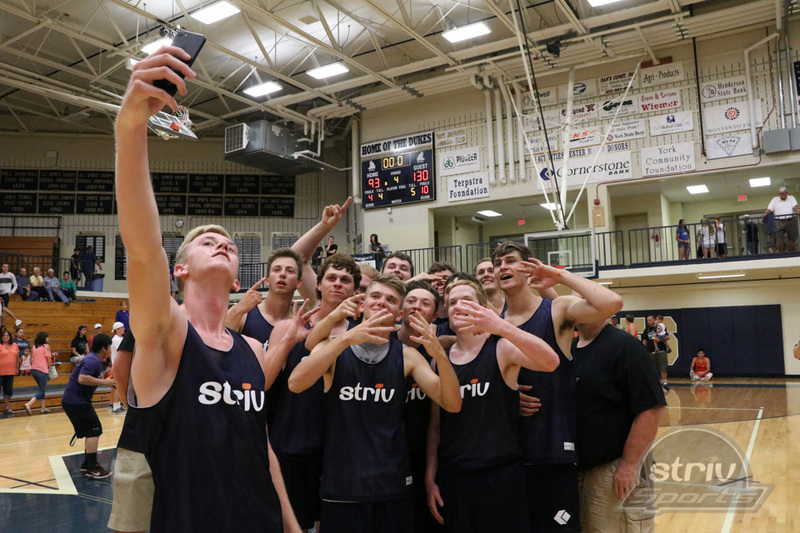 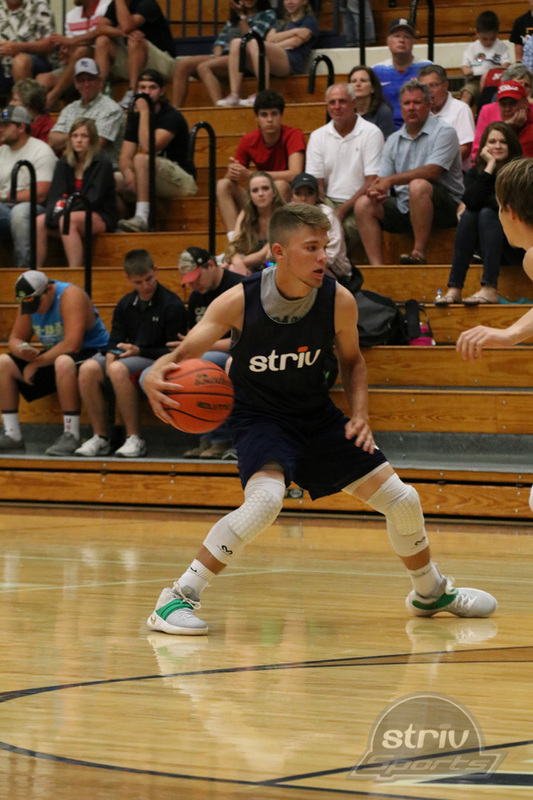 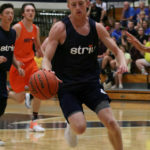 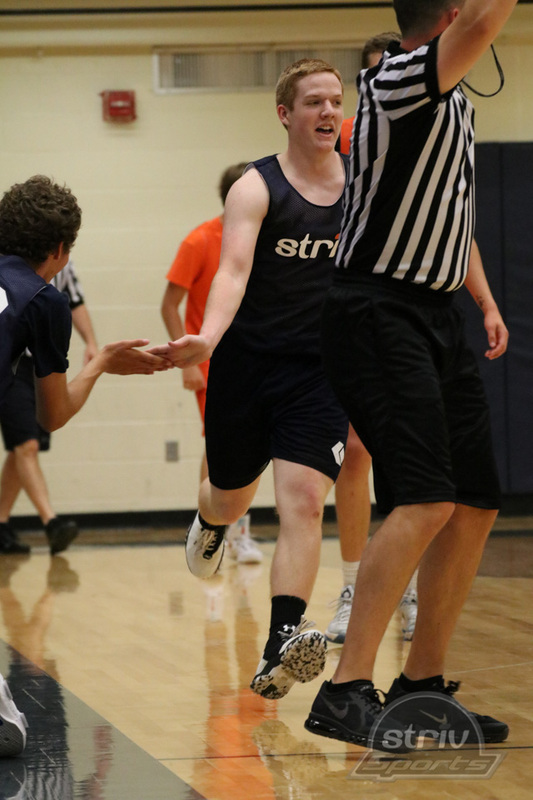 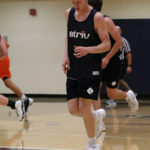 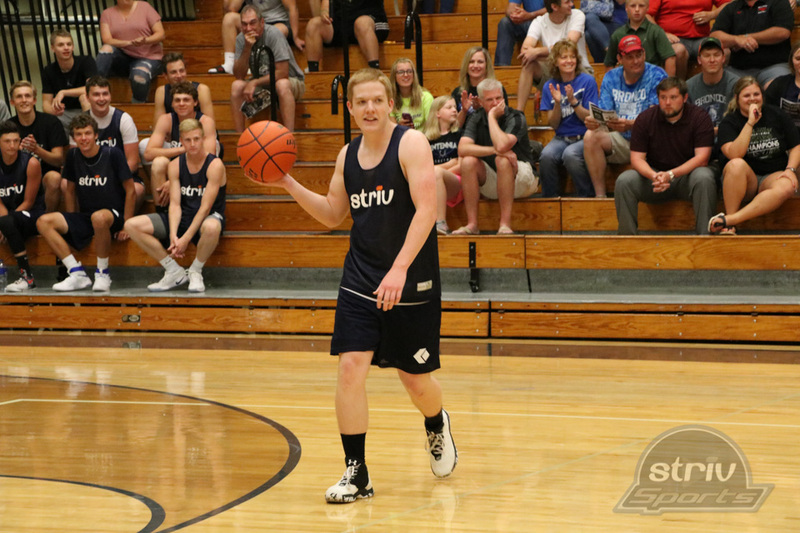 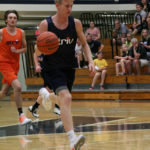 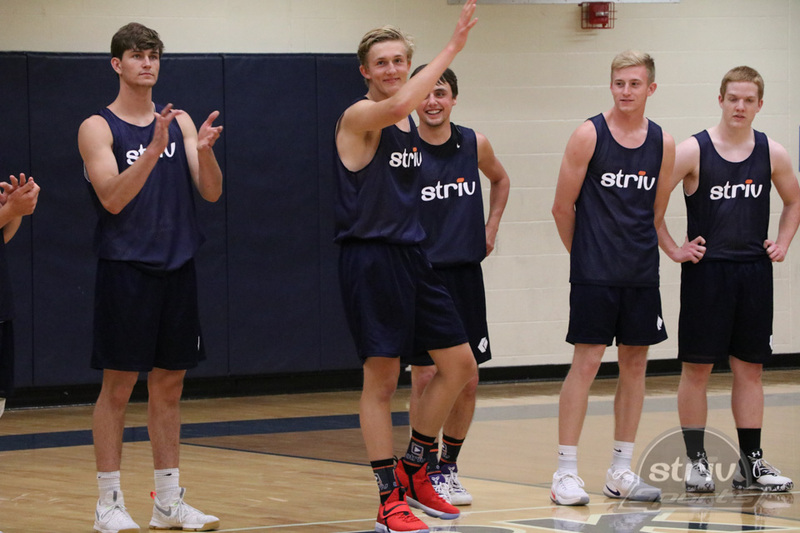 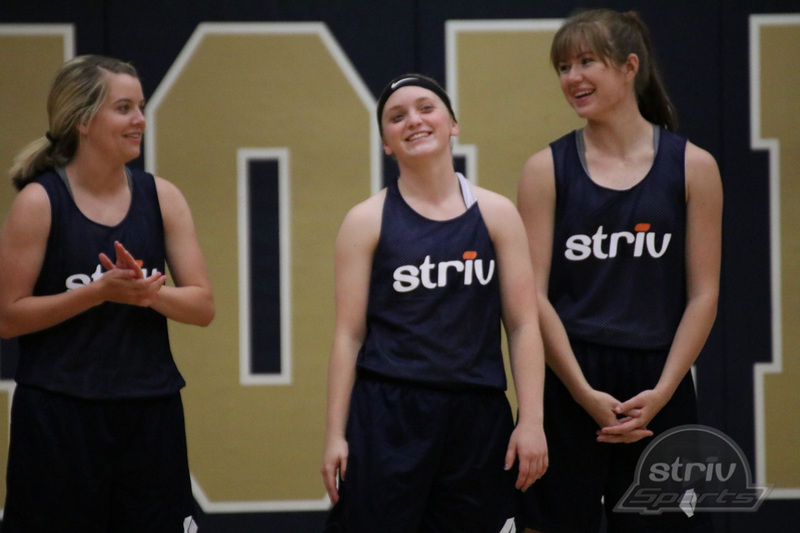 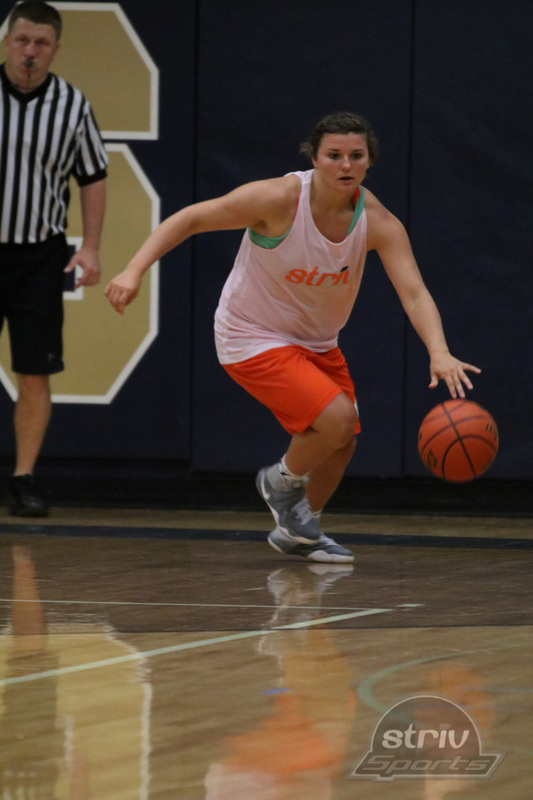 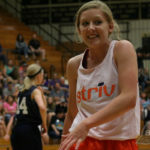 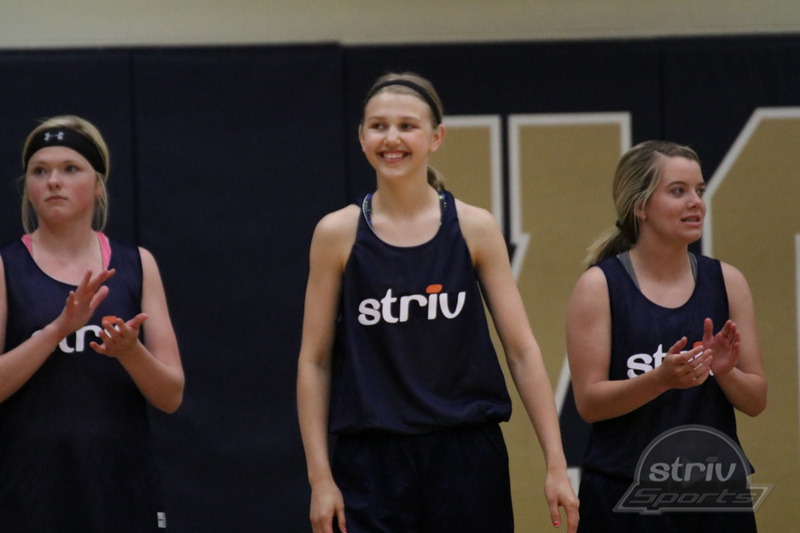 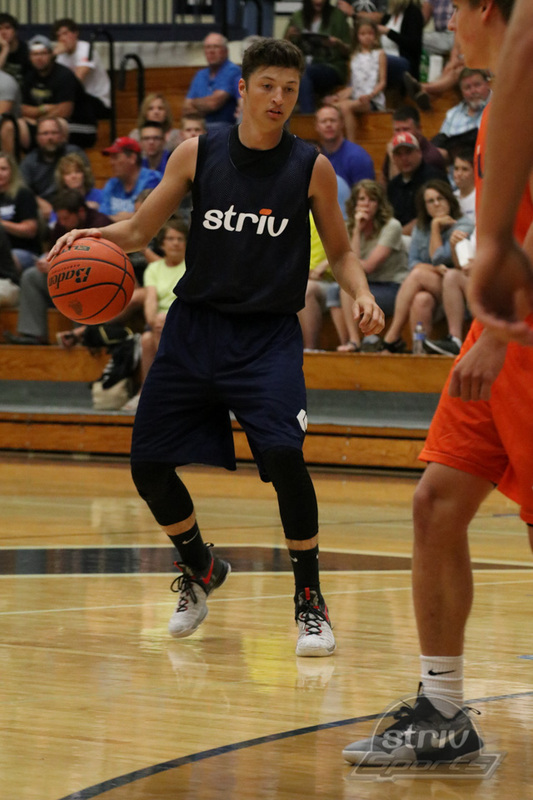 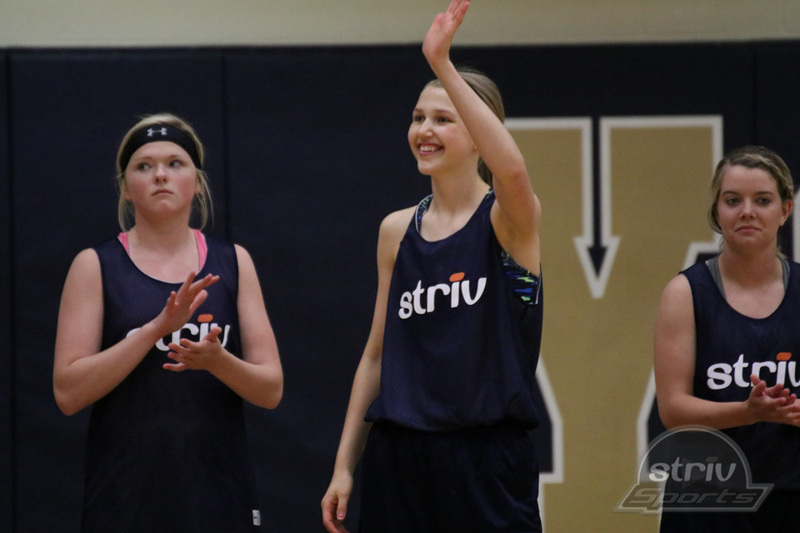 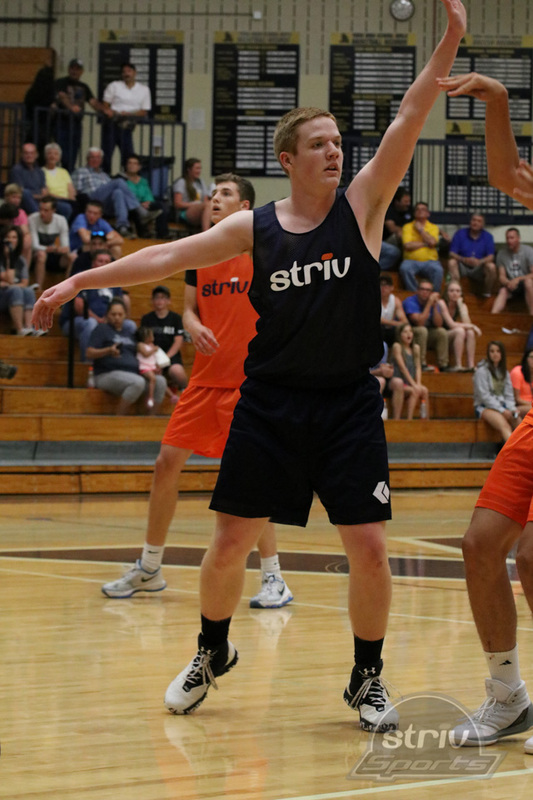 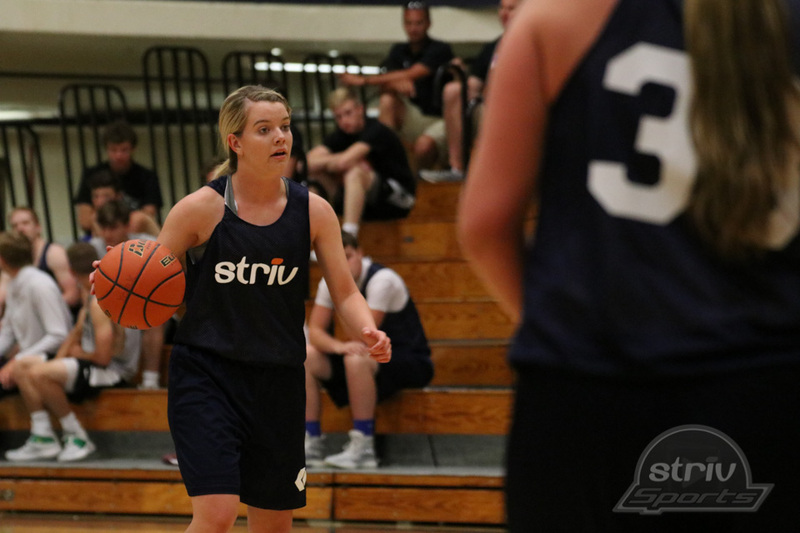 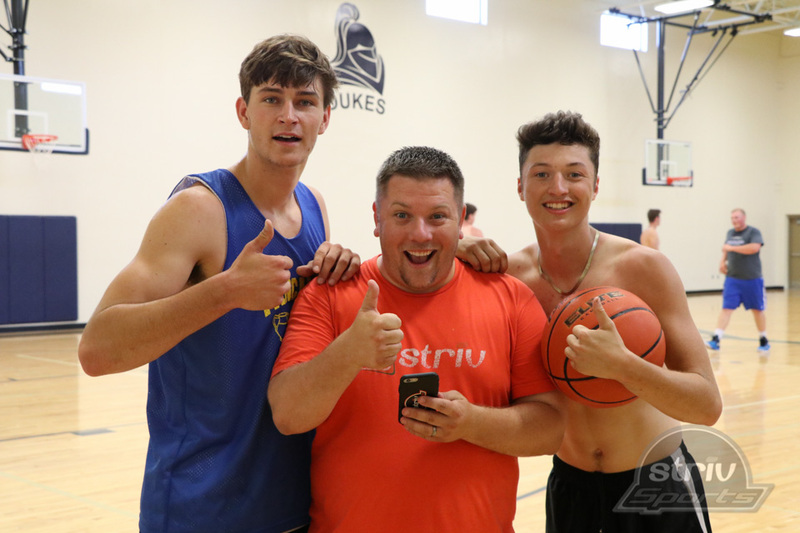 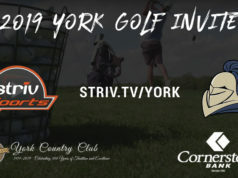 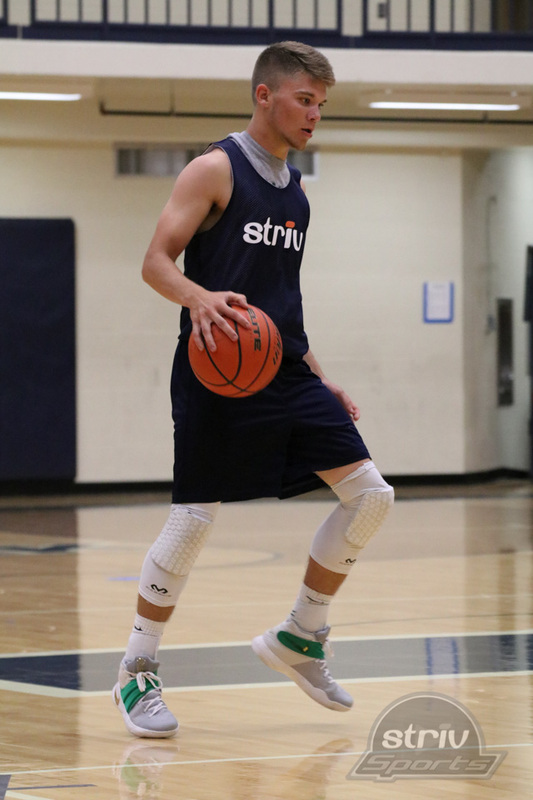 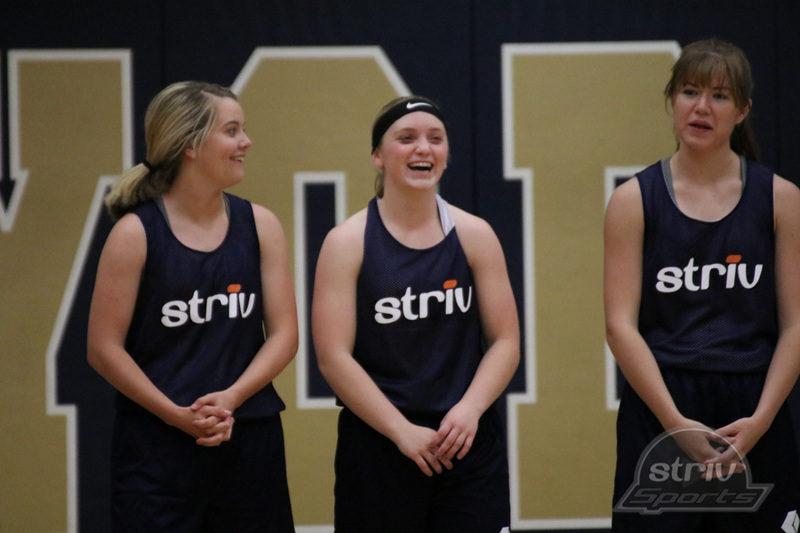 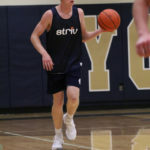 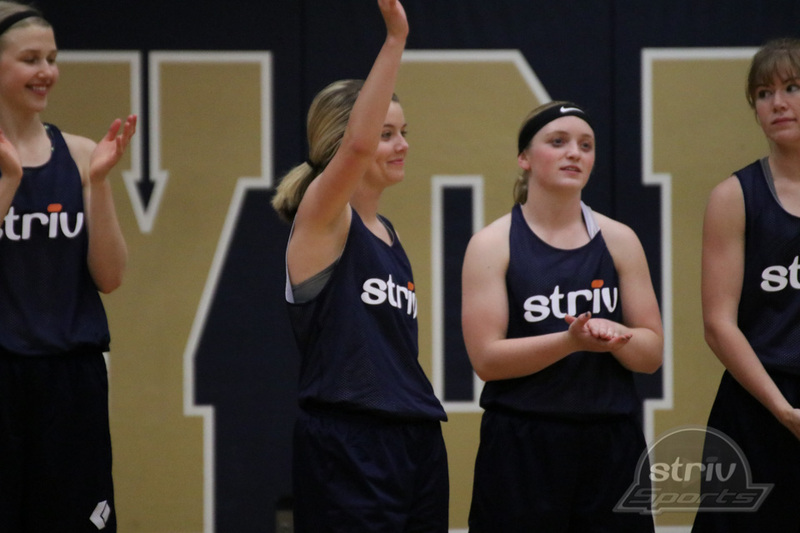 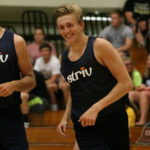 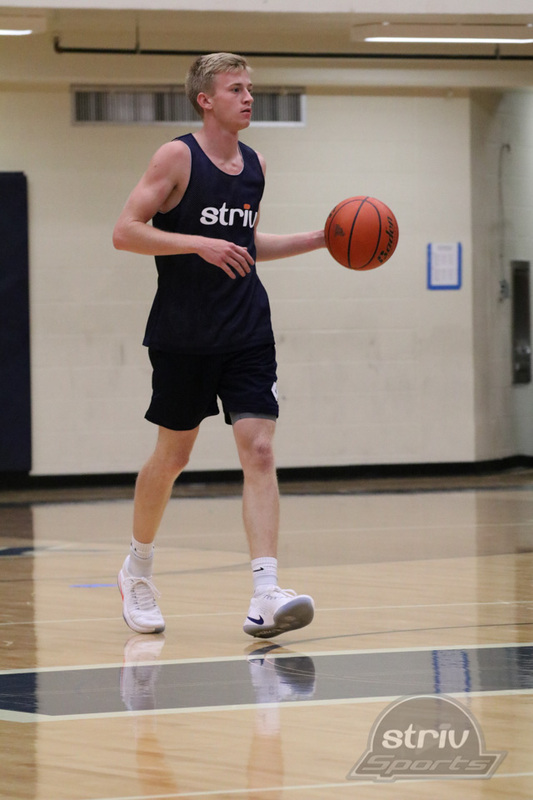 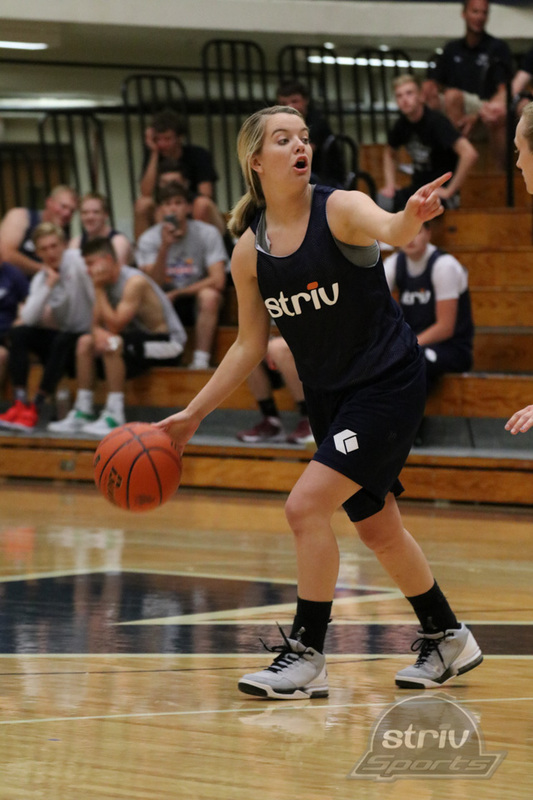 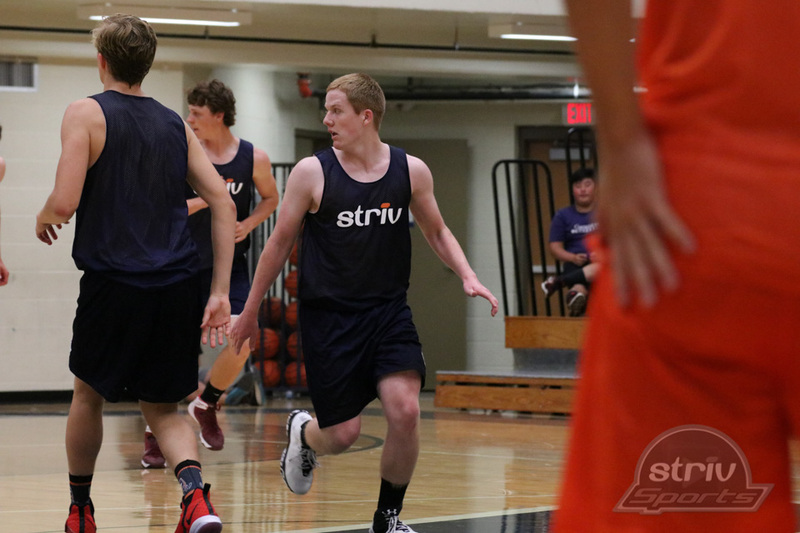 Striv founder and CEO Taylor Siebert is pleased to announce that York High School will again be the host for the 3rd Annual Striv All-Star Basketball Classic presented by Cornerstone Bank on June 3. 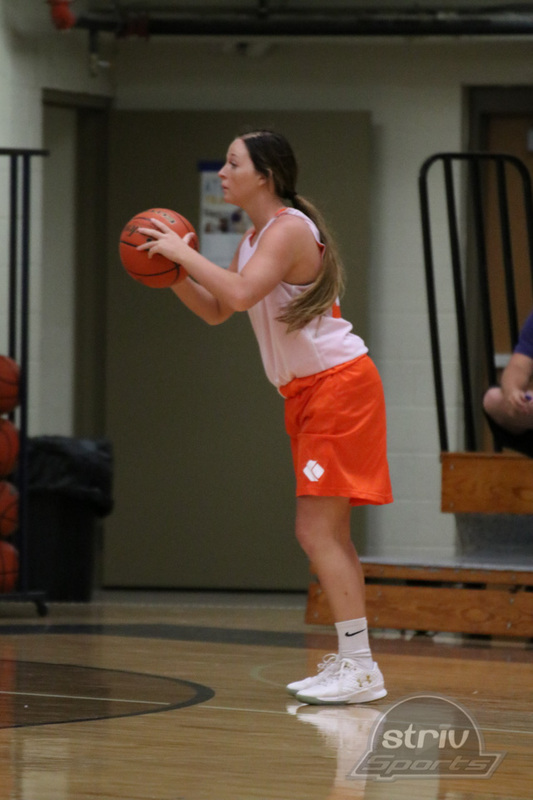 The girls game will begin at 6:00 with boys to follow at 8:00 in addition to a new skills challenge and 3-point shooting contest between games. 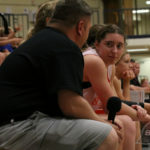 “The first Saturday in June has certainly been a success we didn’t really plan on,” Siebert said. 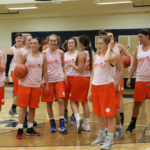 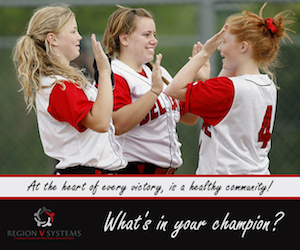 “We have been floored by the success of this event and the response we got from players, coaches and fans. 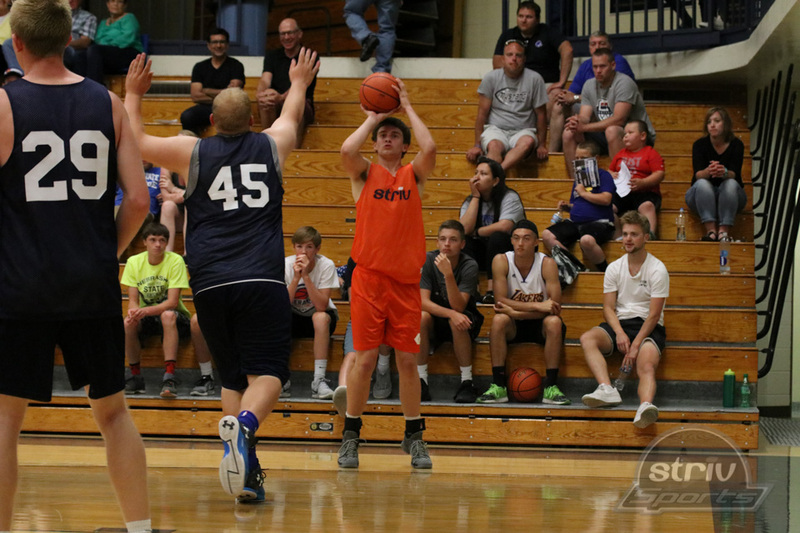 The coaches and players could be the best since the game started in 2015. 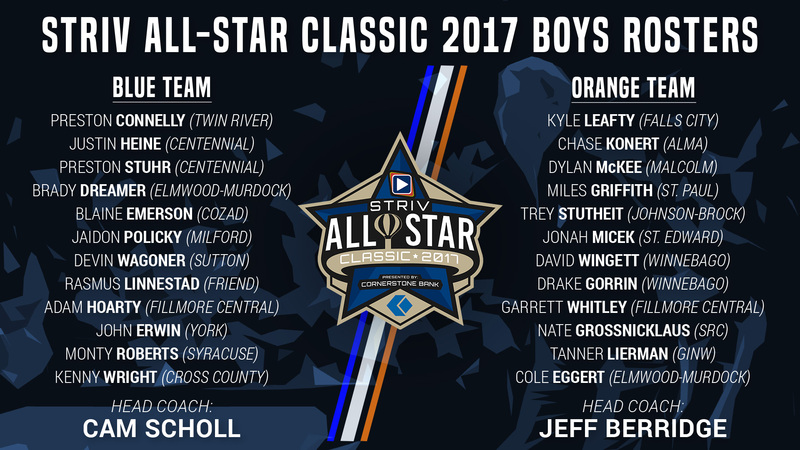 The boys Blue Team will be coached by Centennial’s Cam Scholl while the Orange team will be led by Winnebago’s Jeff Berridge. 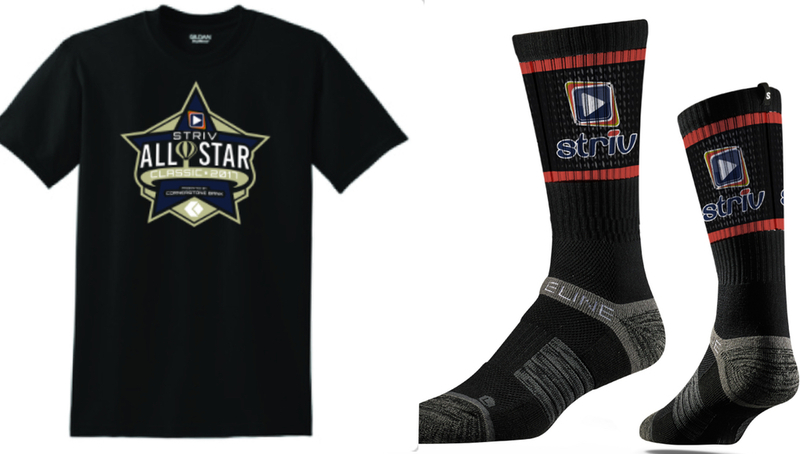 Click the image to get your official Striv All-Star Classic gear! 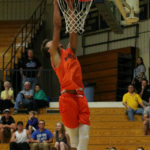 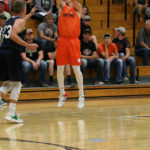 Scholl led the Broncos to an appearance in the Class C-2 state tournament where they were defeated in the first round by eventual state champion Ponca. 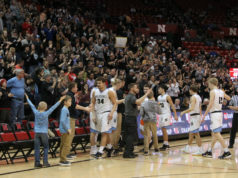 Centennial qualified for the first time since 1983 while finishing with a record of 22-4. 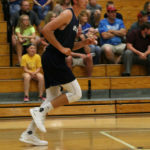 Berridge has turned the Indians in a perennial power in Class C. They won the Class C-1 title in 2015 and finished third in C-2 in 2016 and C-1 this past season. 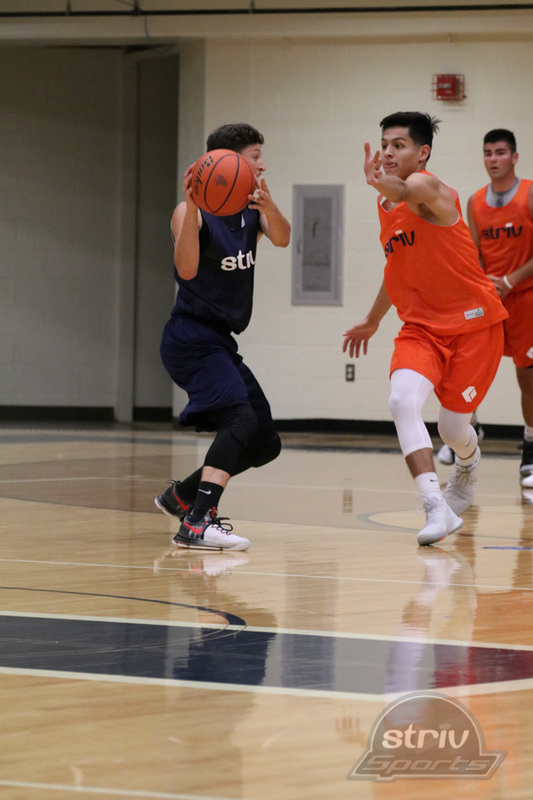 ‘Bago finished 2017 28-3. Both coaches will have the honor of coaching two of their players for a final time. 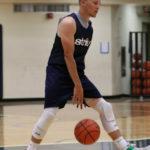 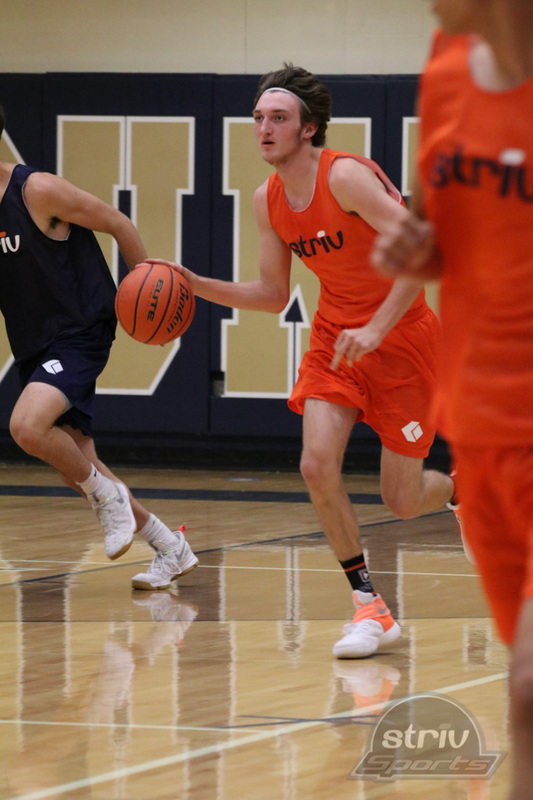 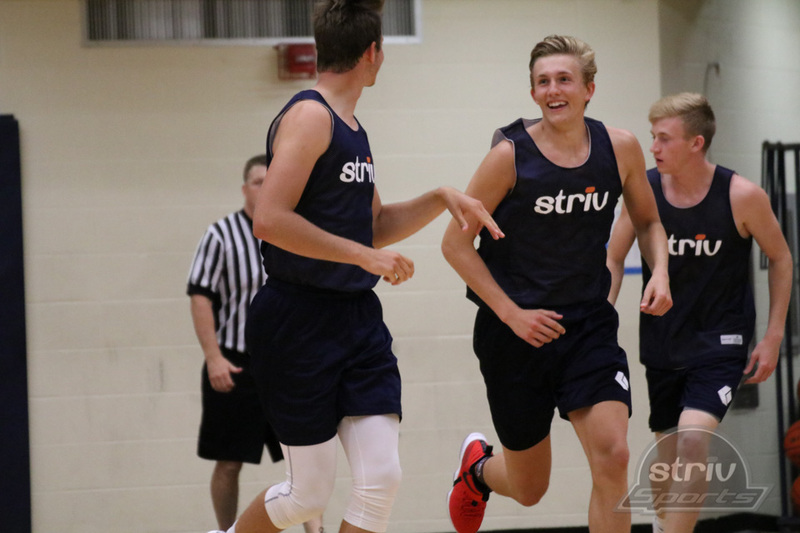 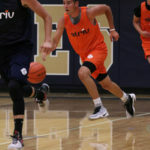 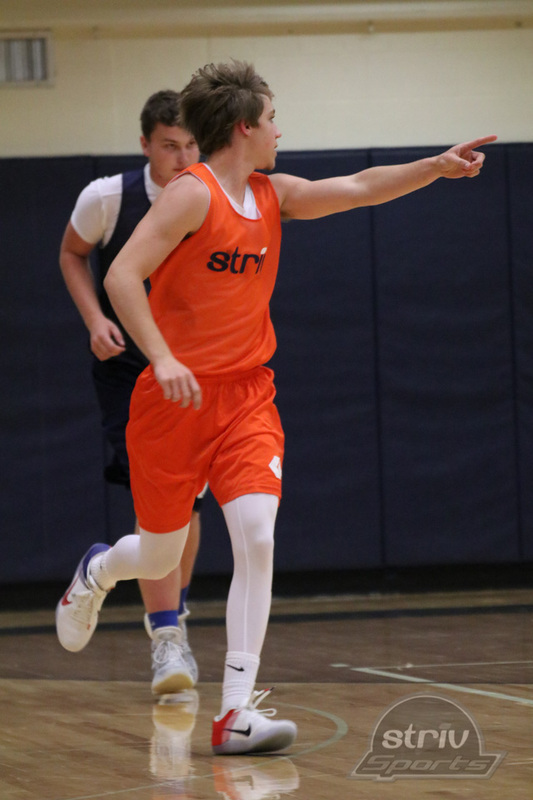 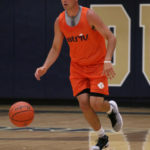 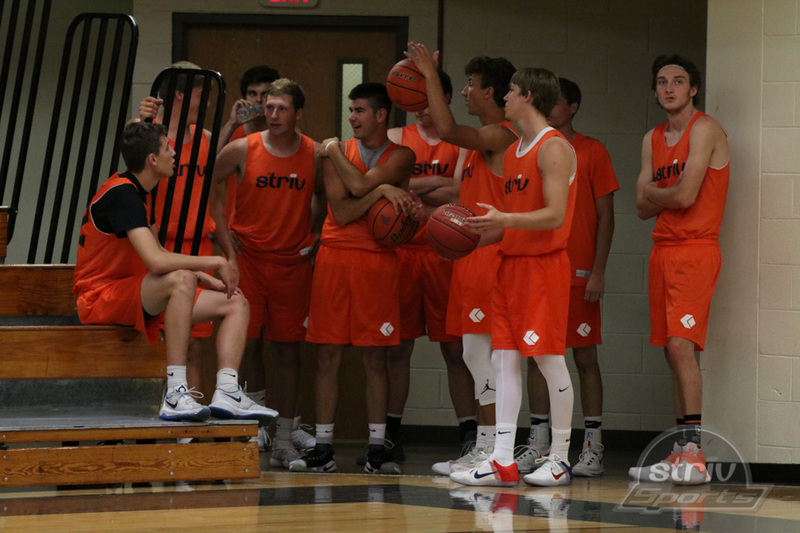 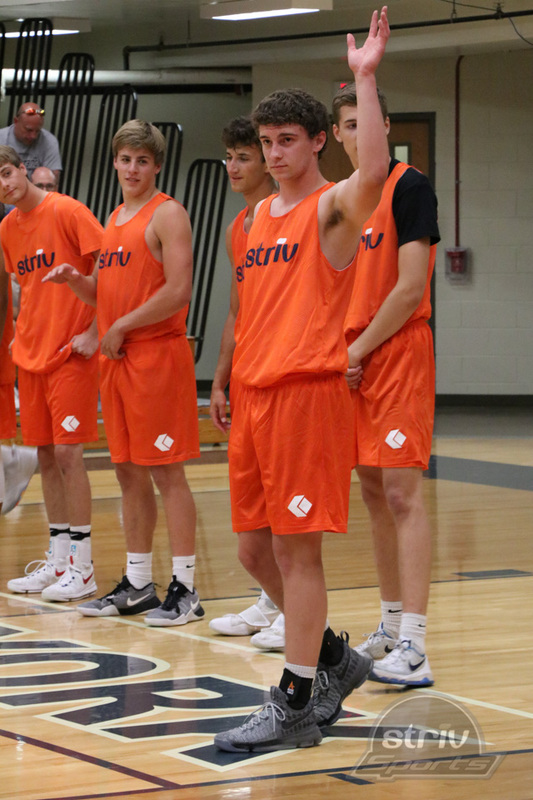 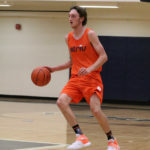 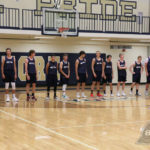 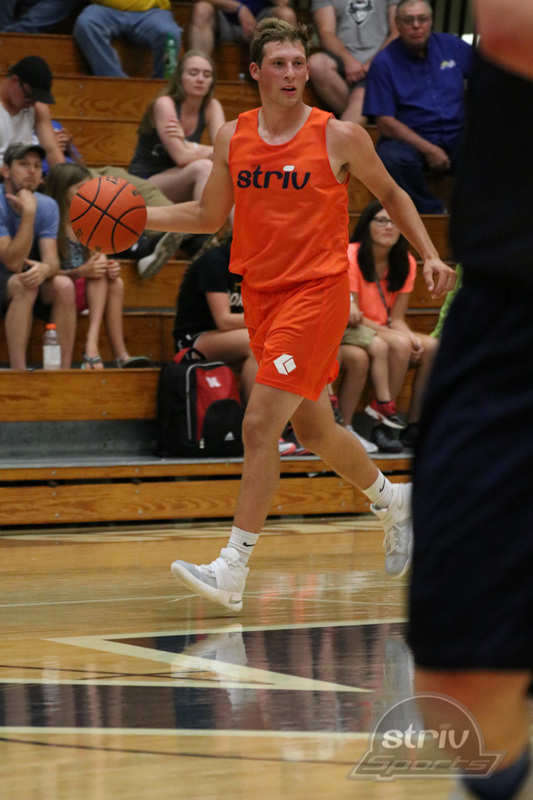 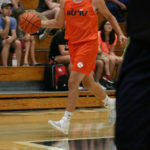 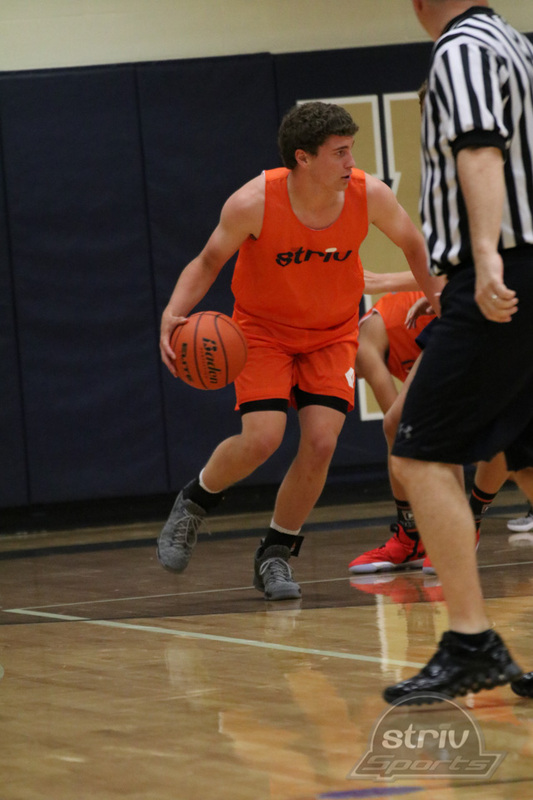 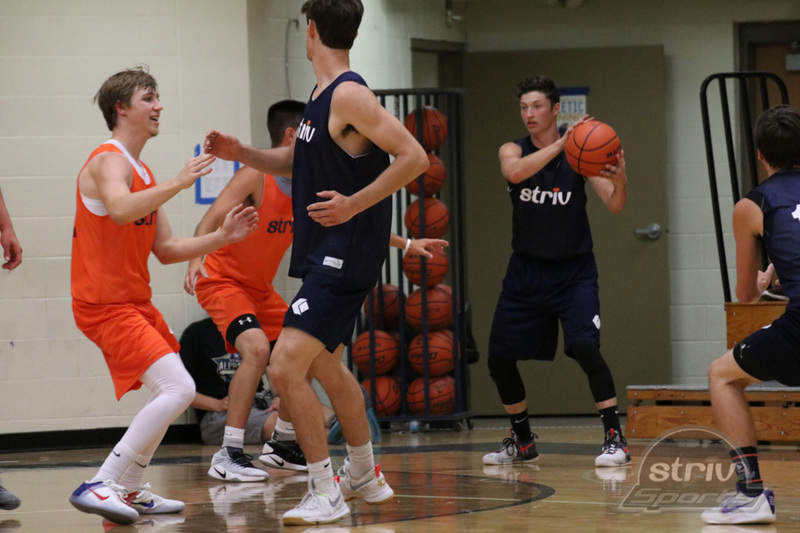 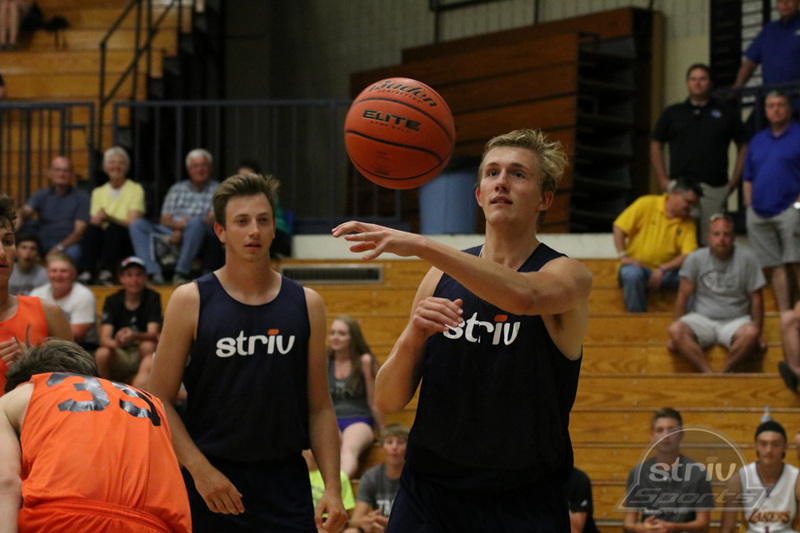 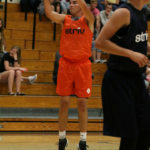 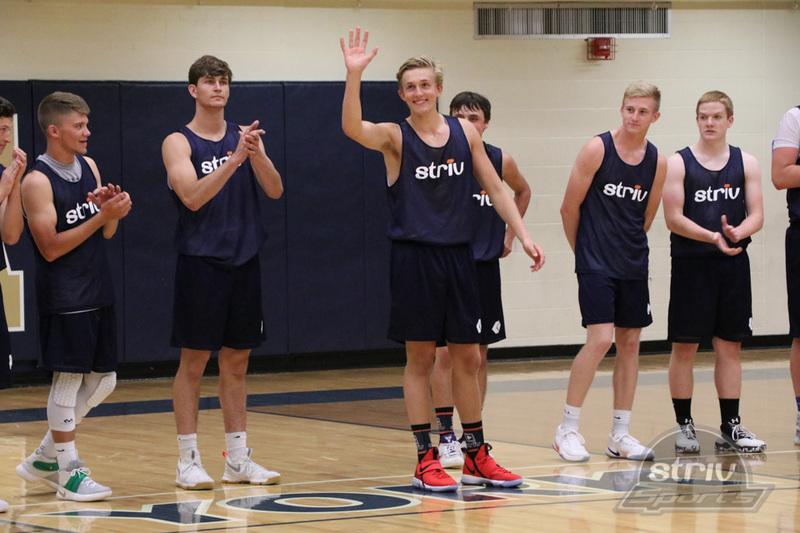 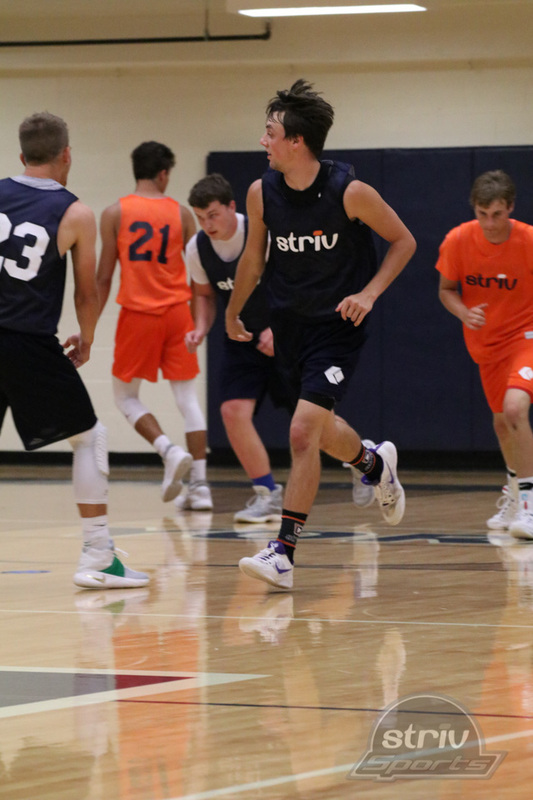 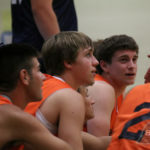 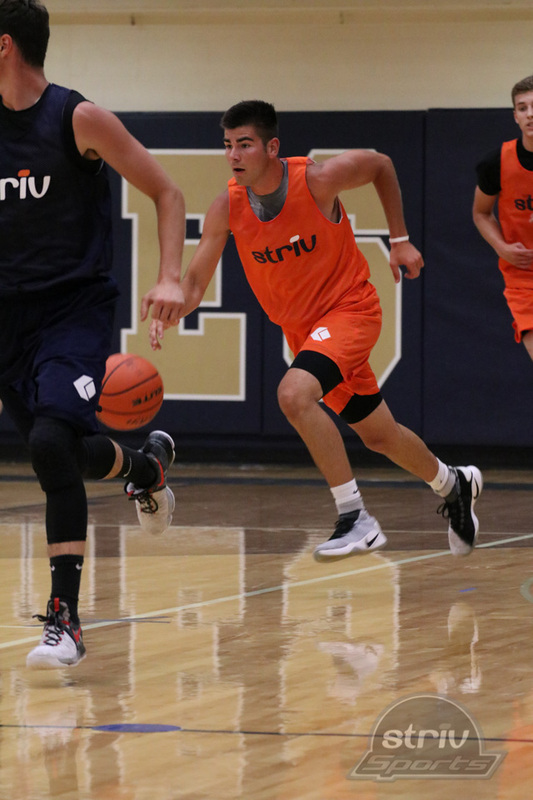 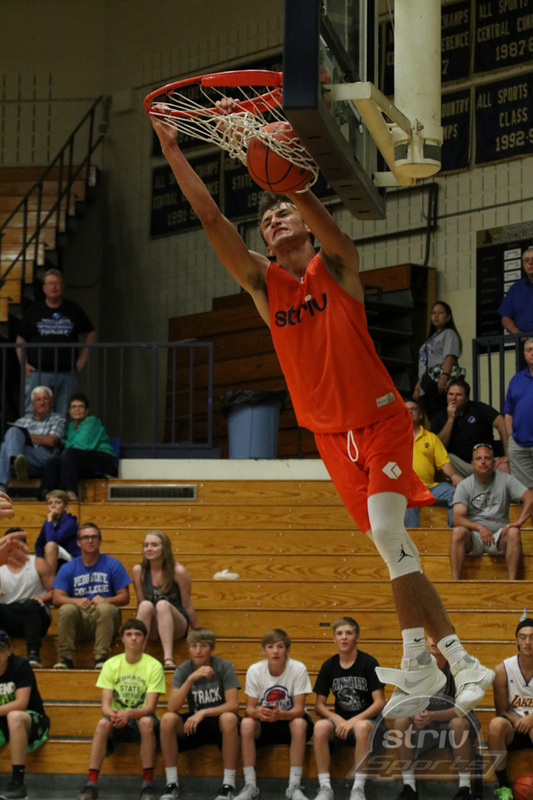 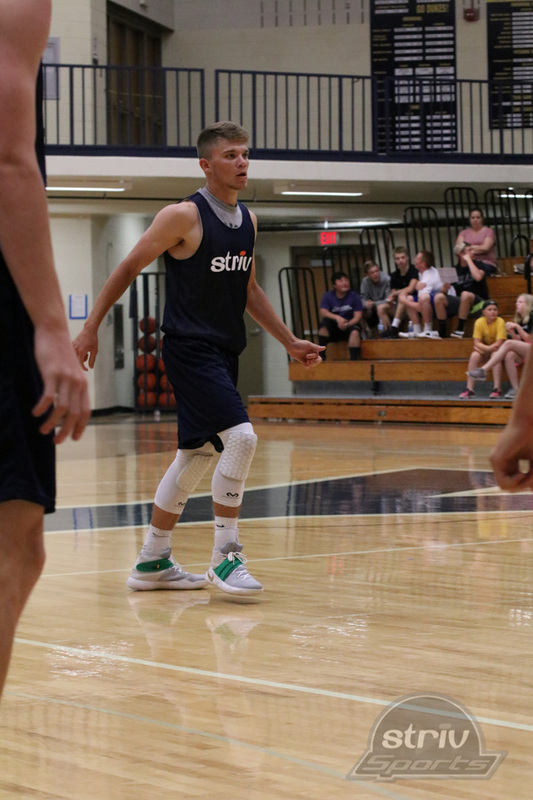 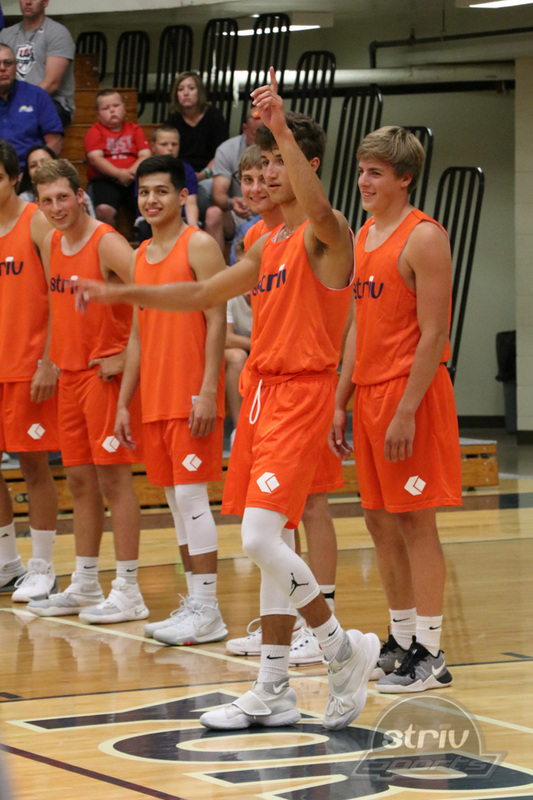 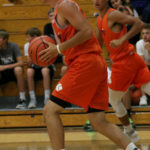 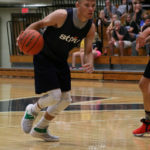 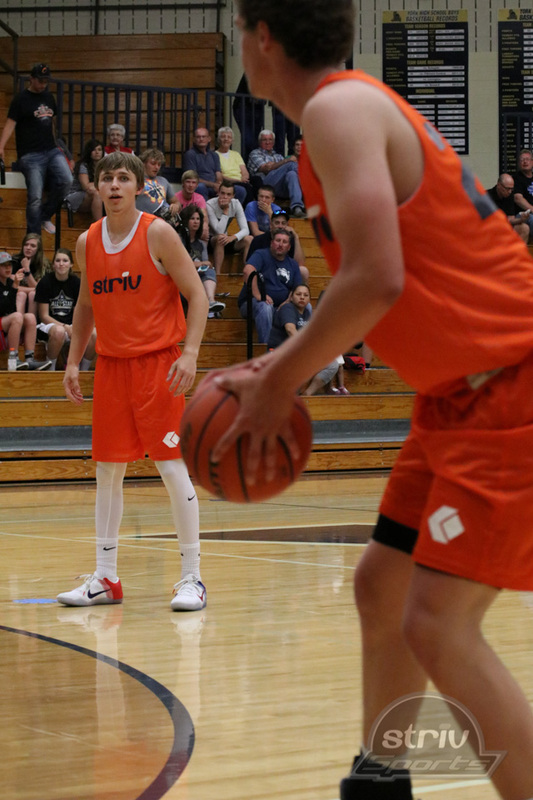 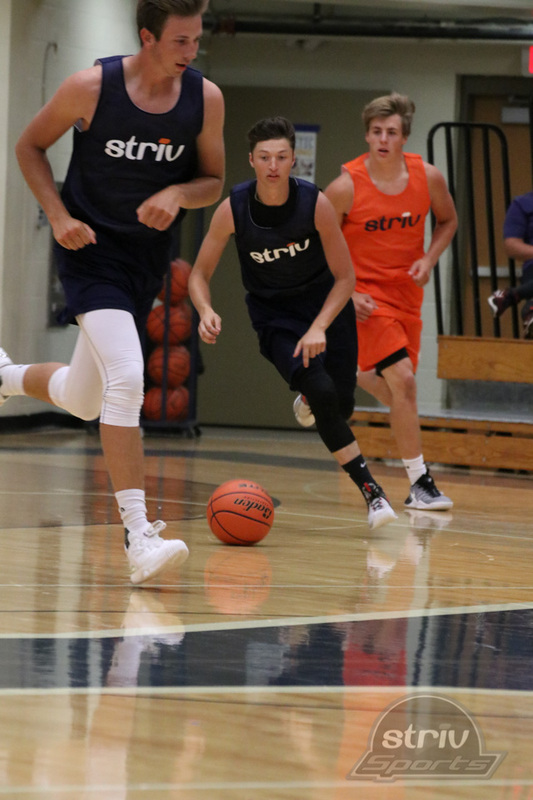 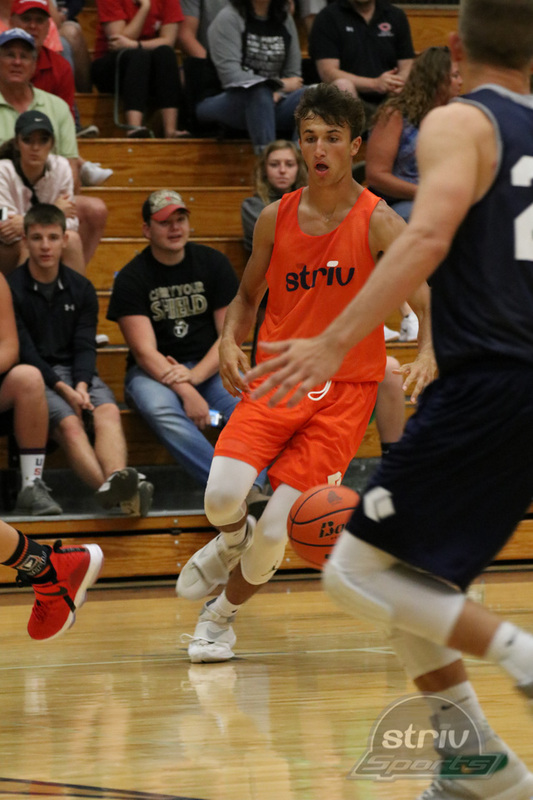 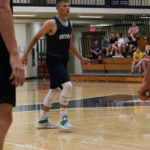 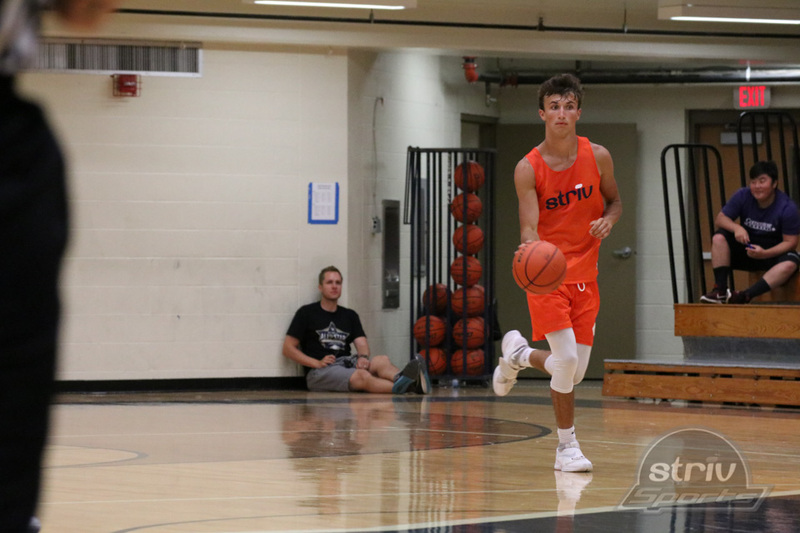 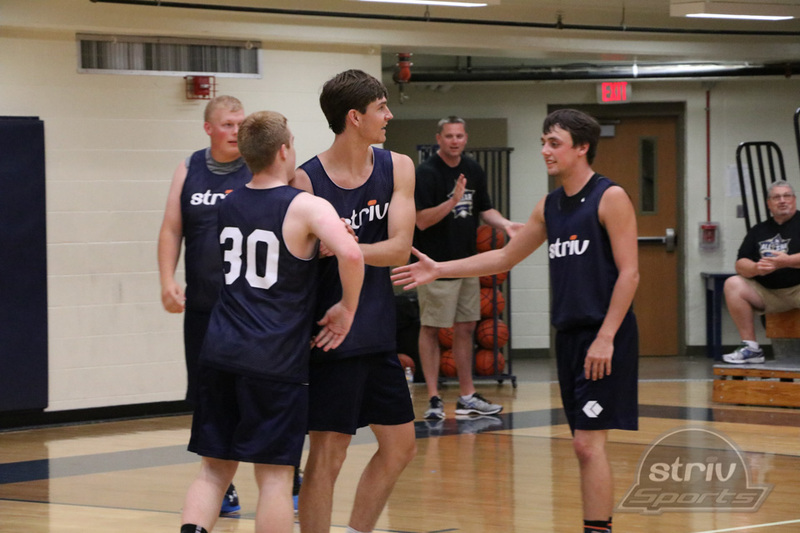 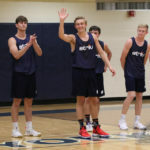 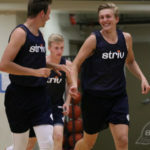 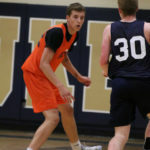 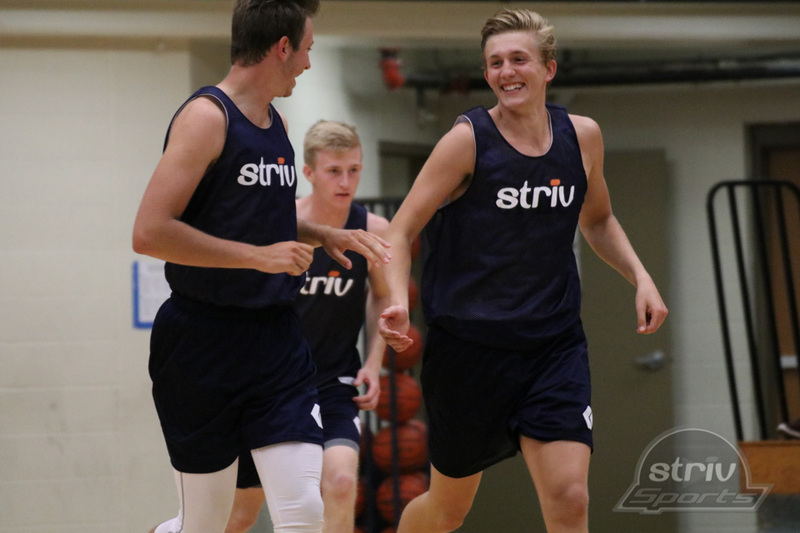 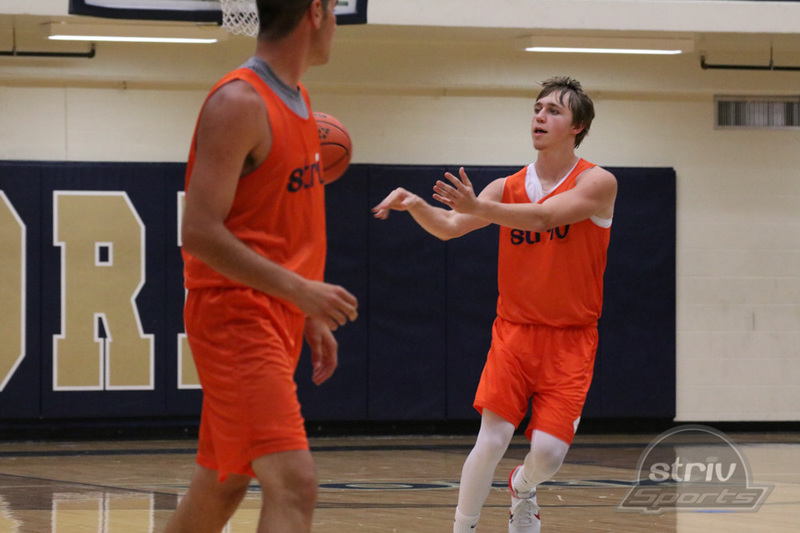 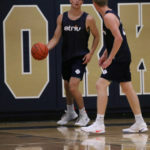 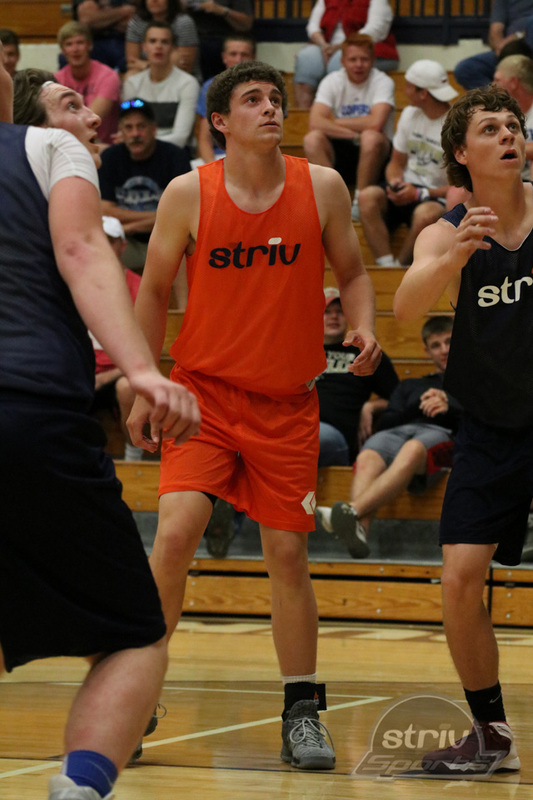 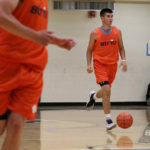 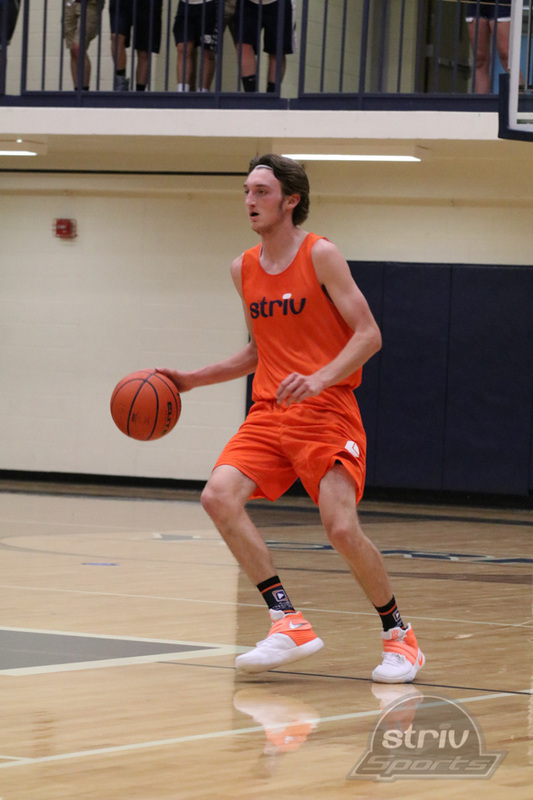 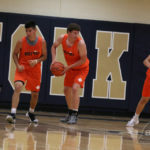 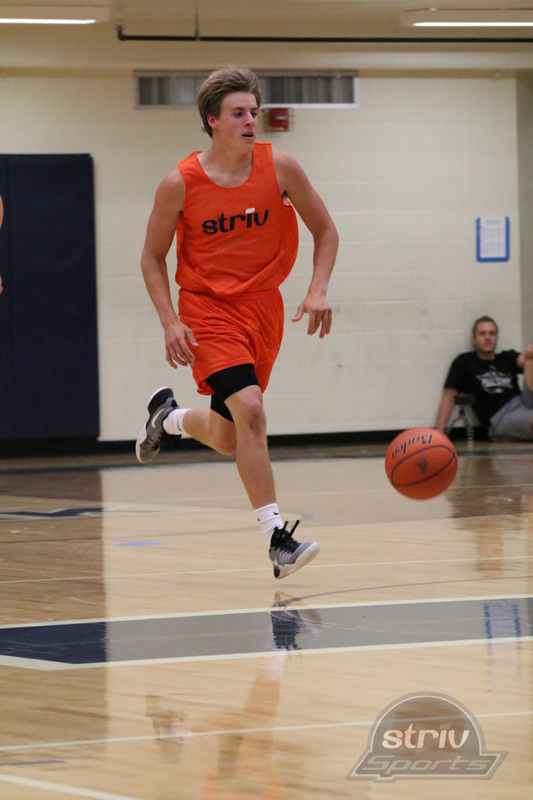 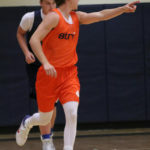 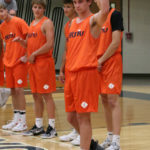 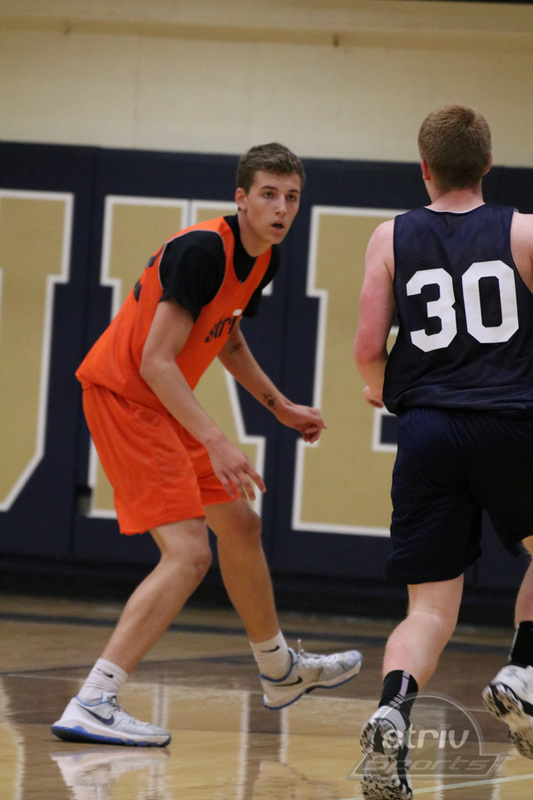 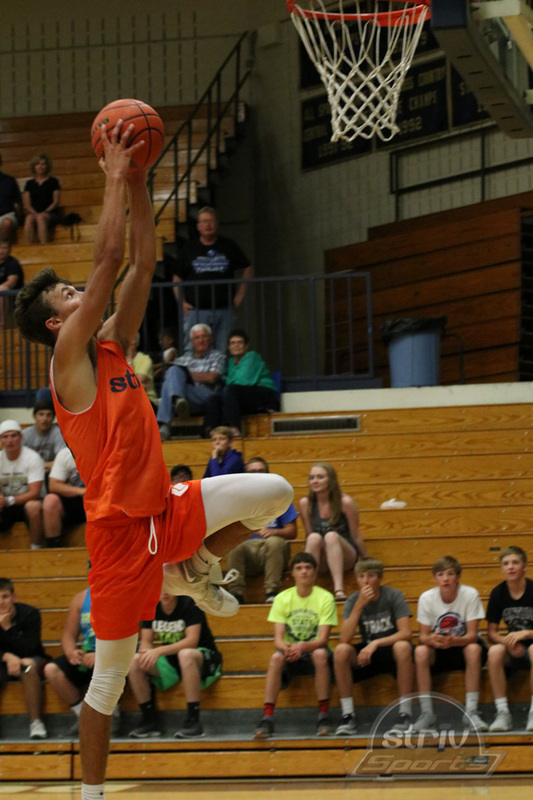 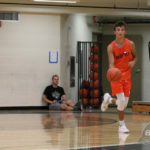 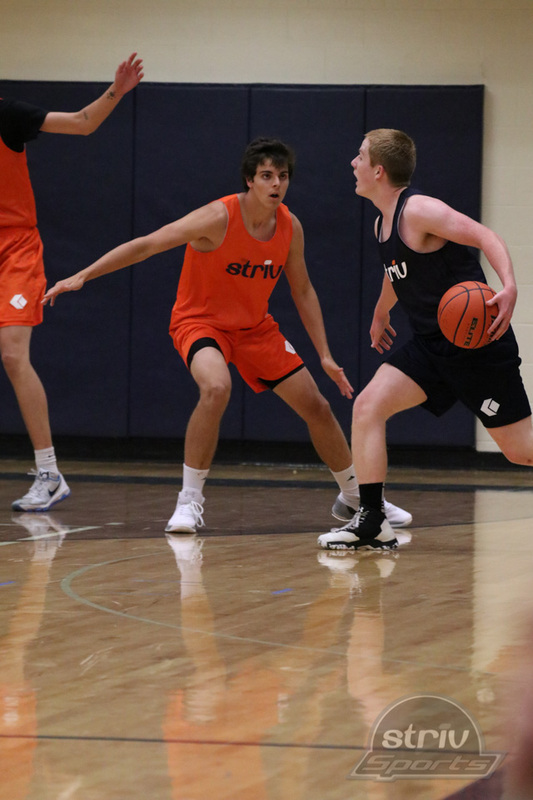 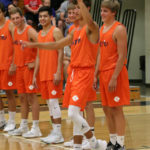 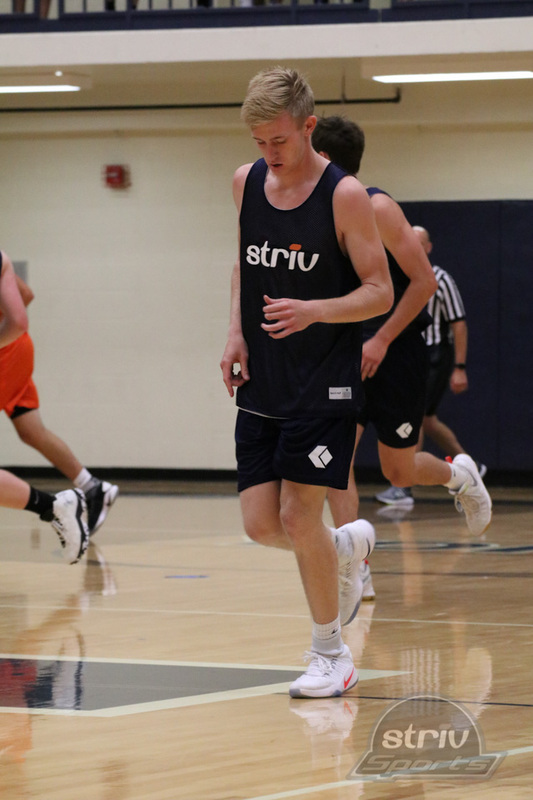 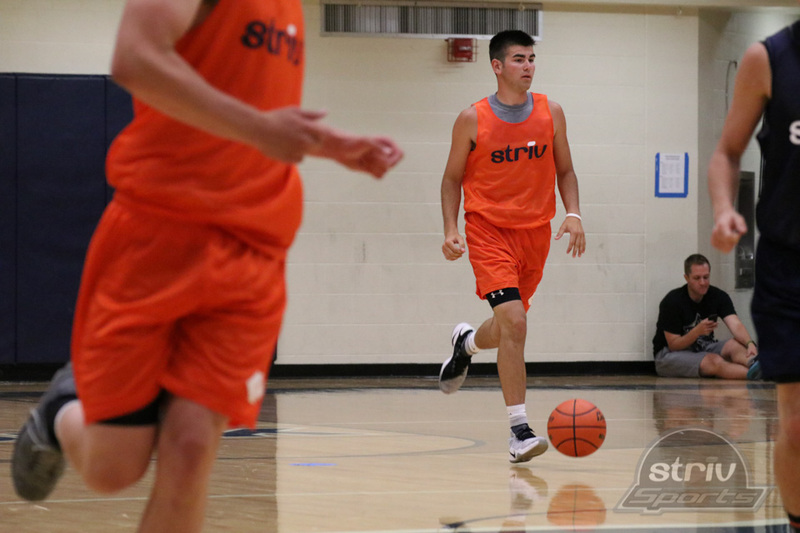 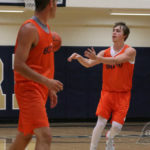 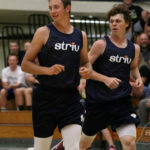 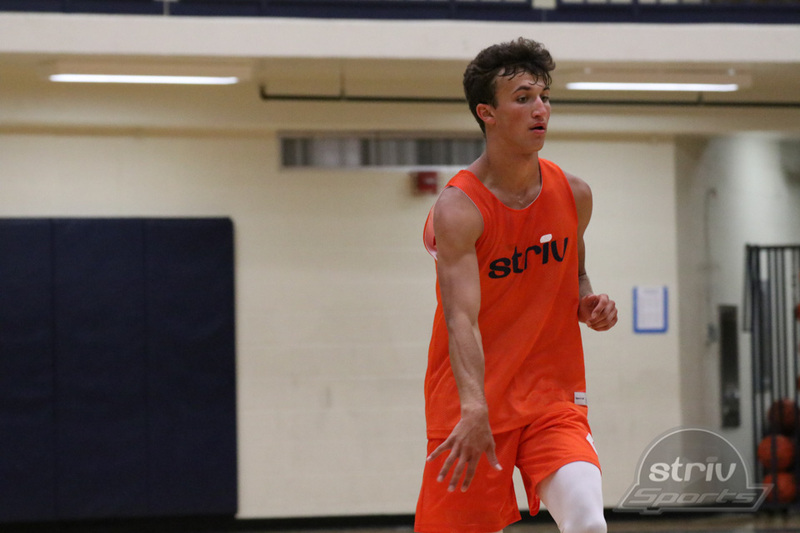 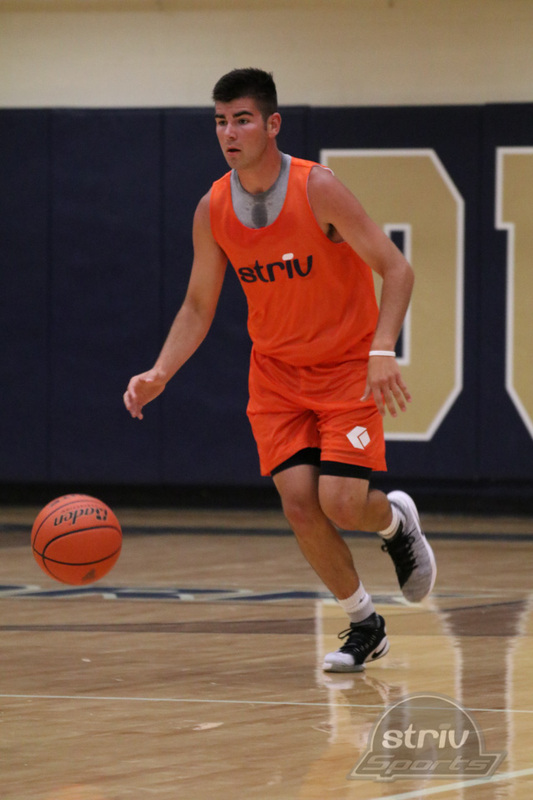 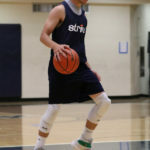 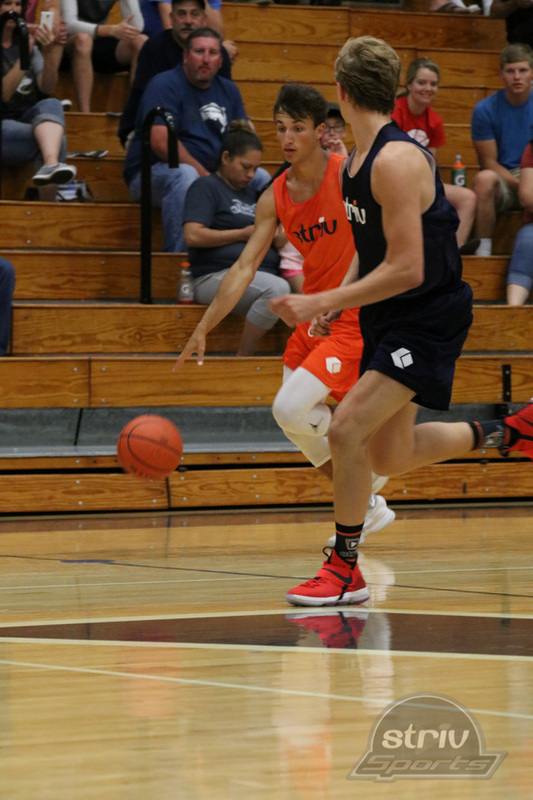 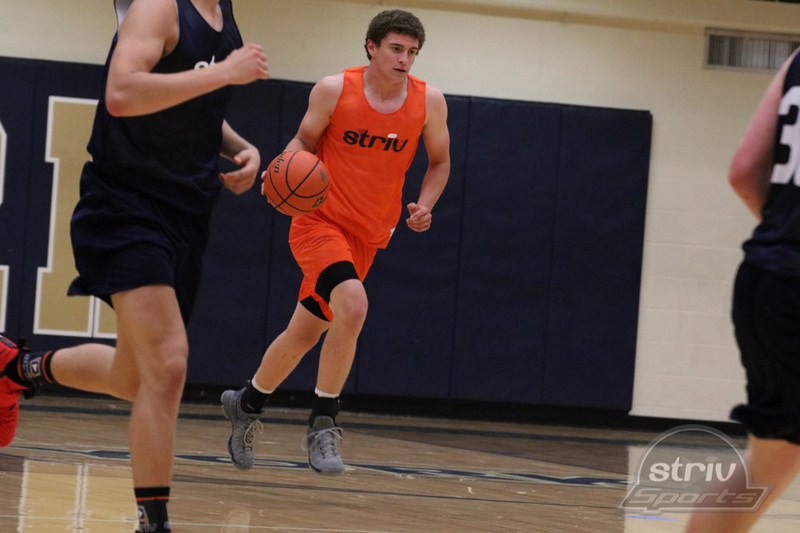 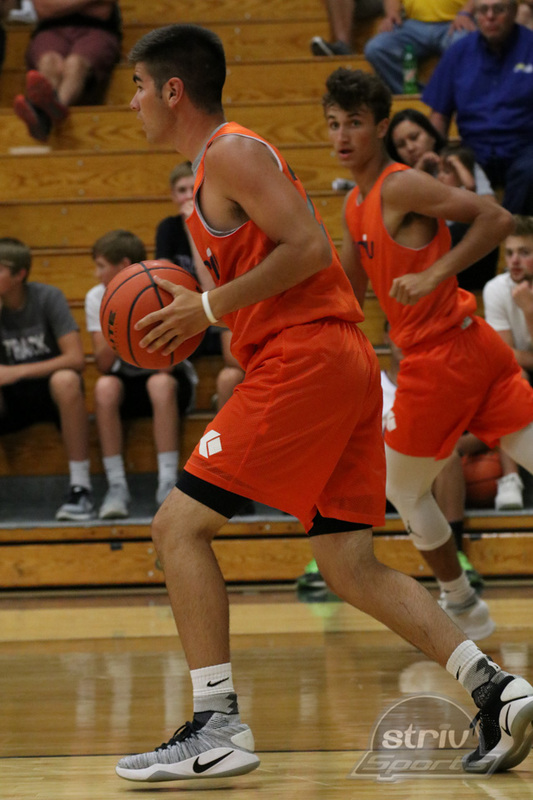 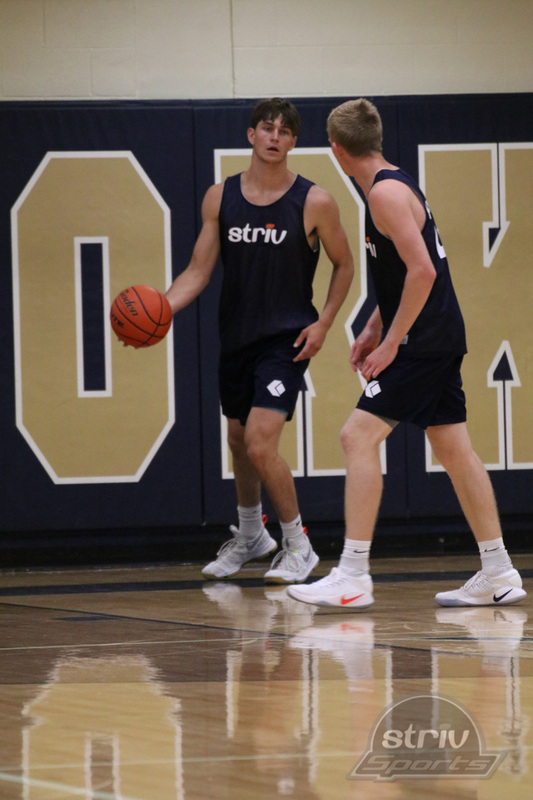 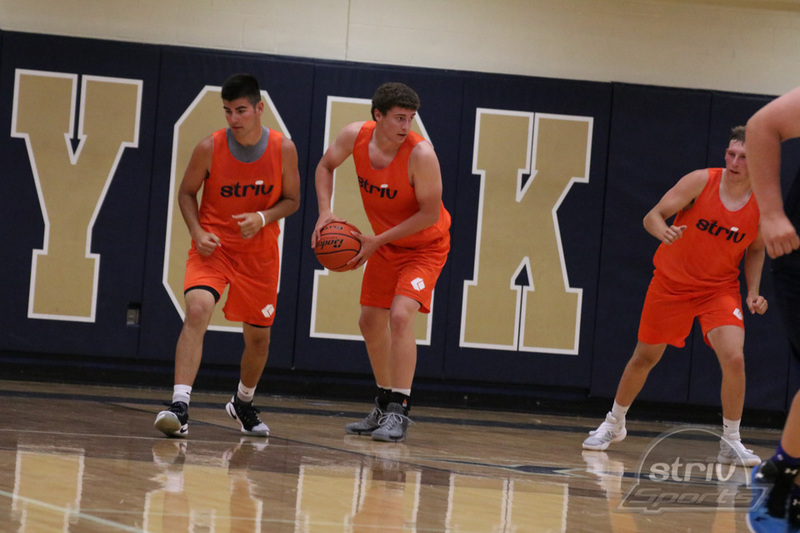 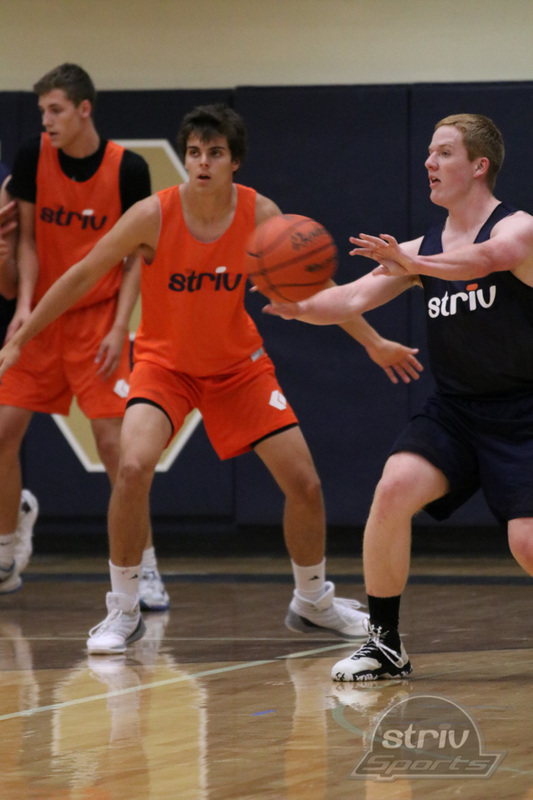 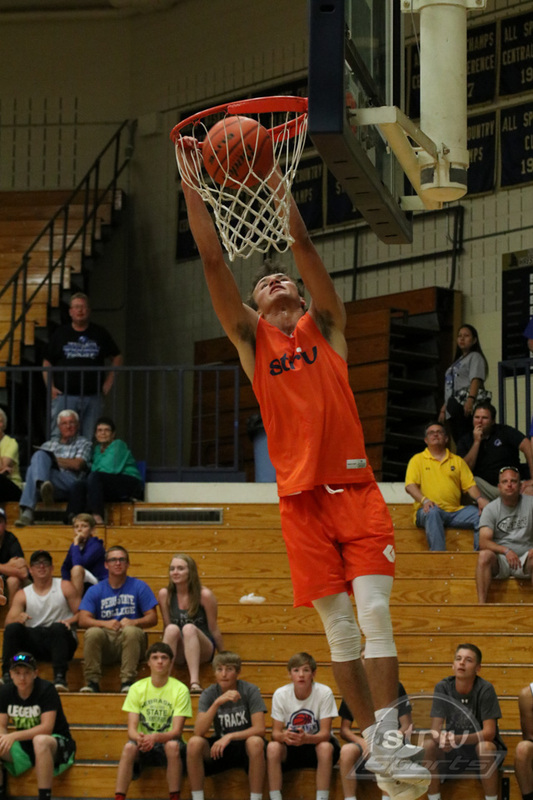 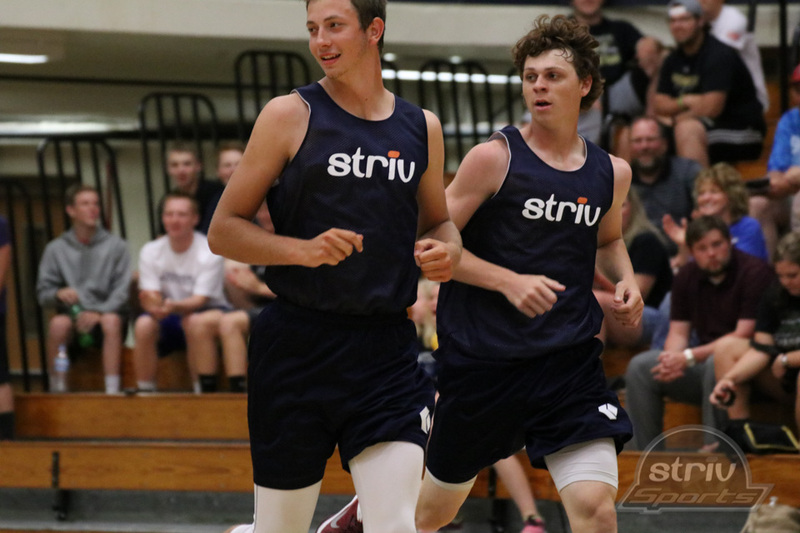 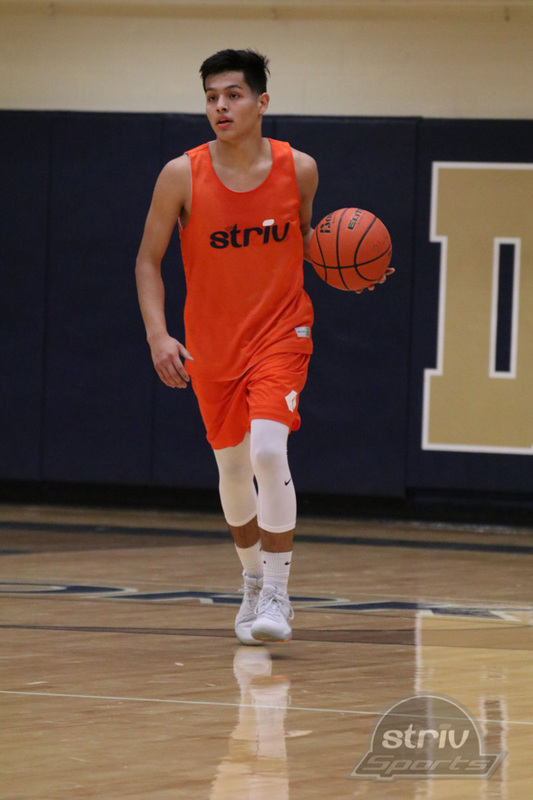 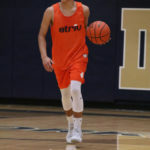 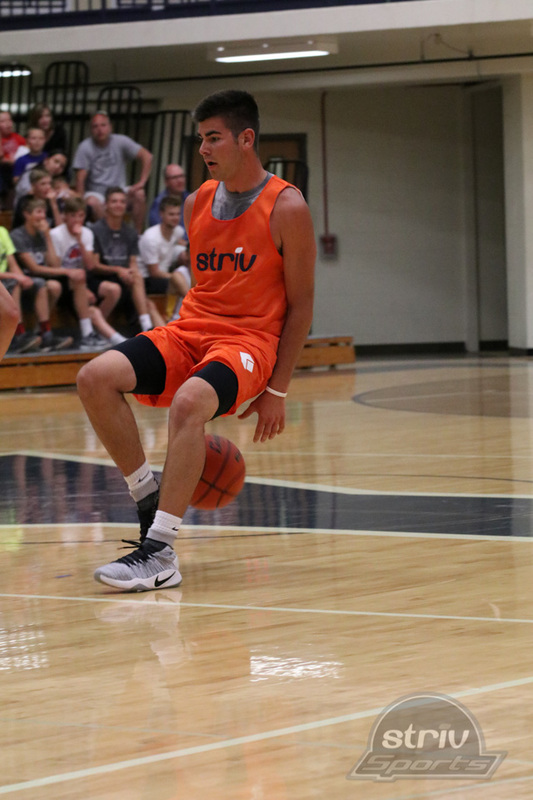 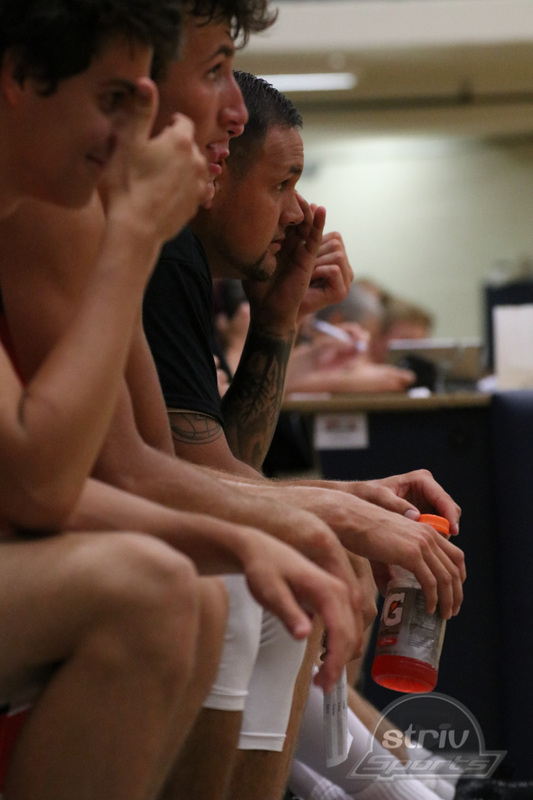 Justin Heine and Preston Stuhr will join Scholl on the Blue Team, while Berridge will have all-stater David Wingett in addition to Drake Gorrin on the Orange Team. 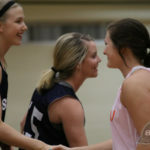 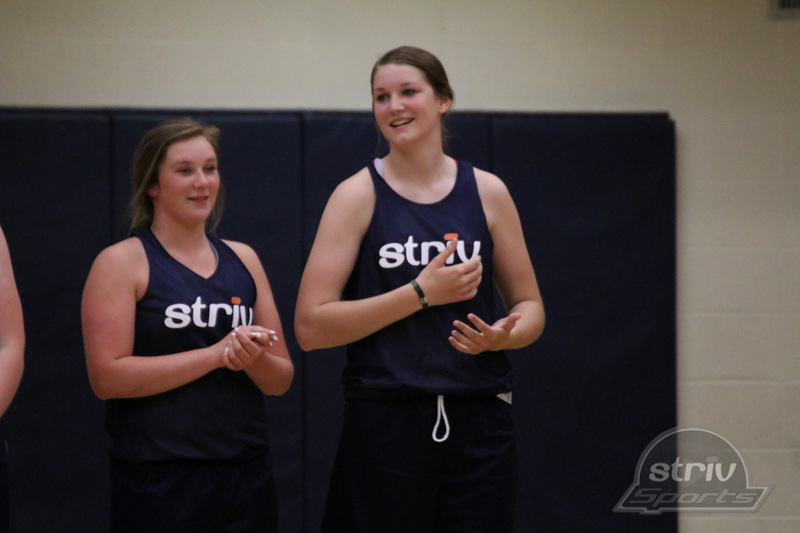 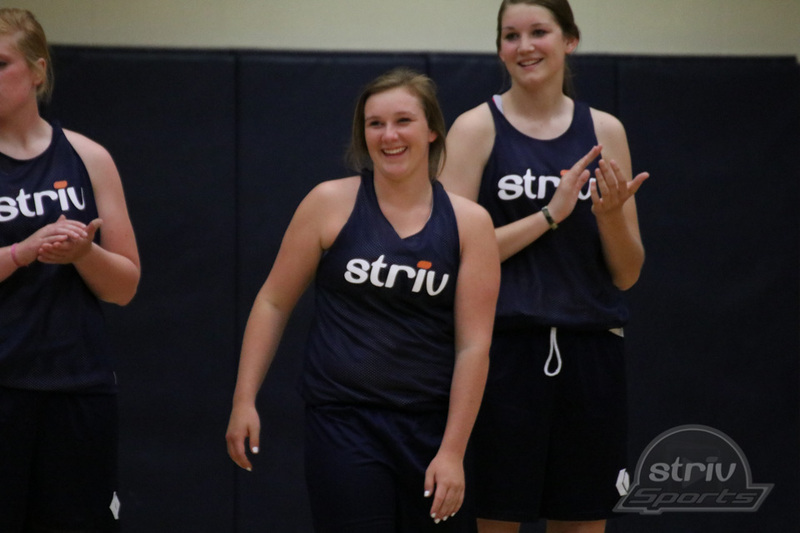 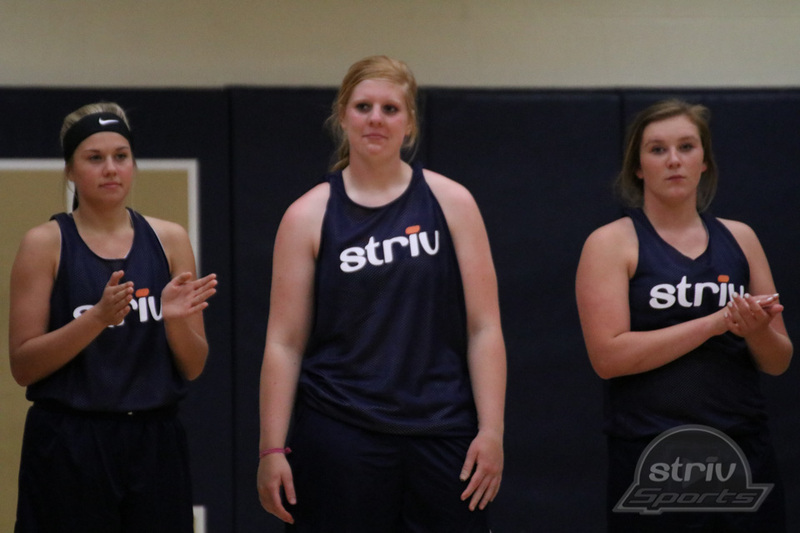 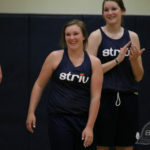 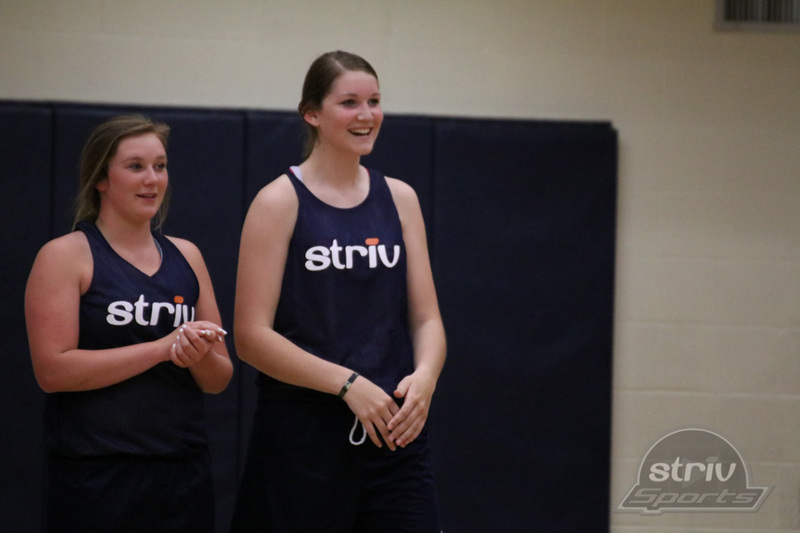 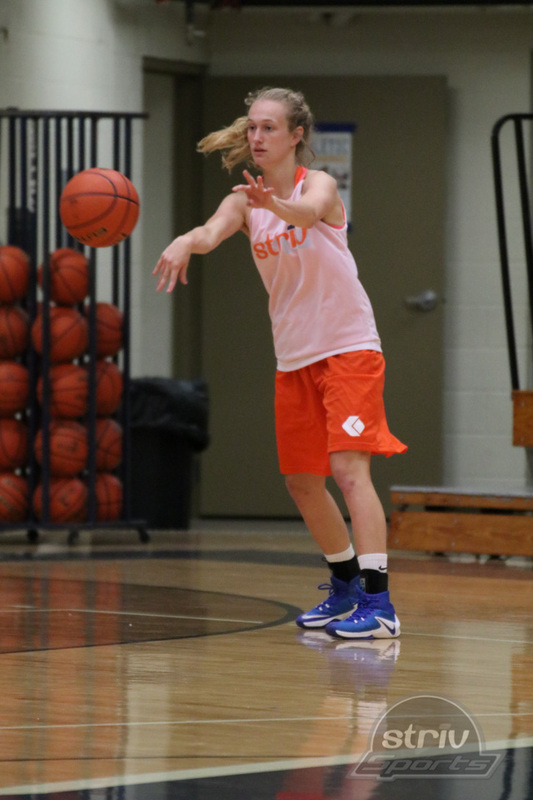 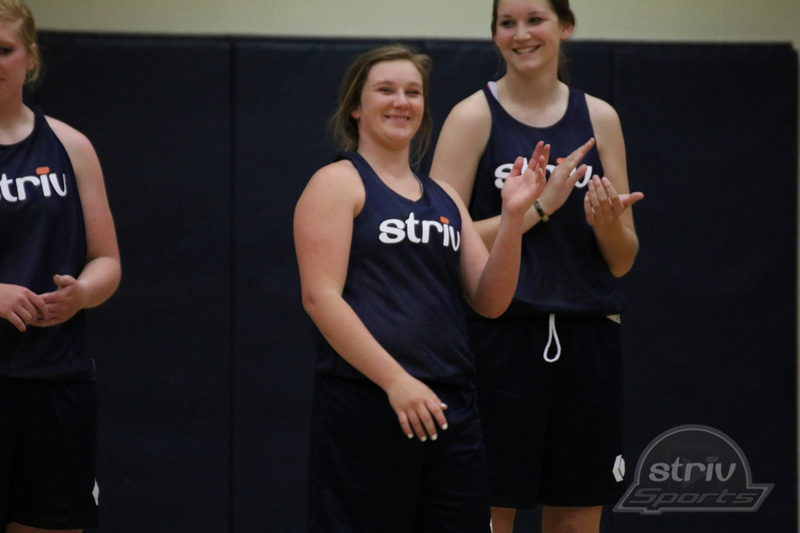 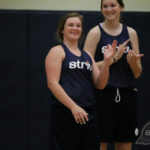 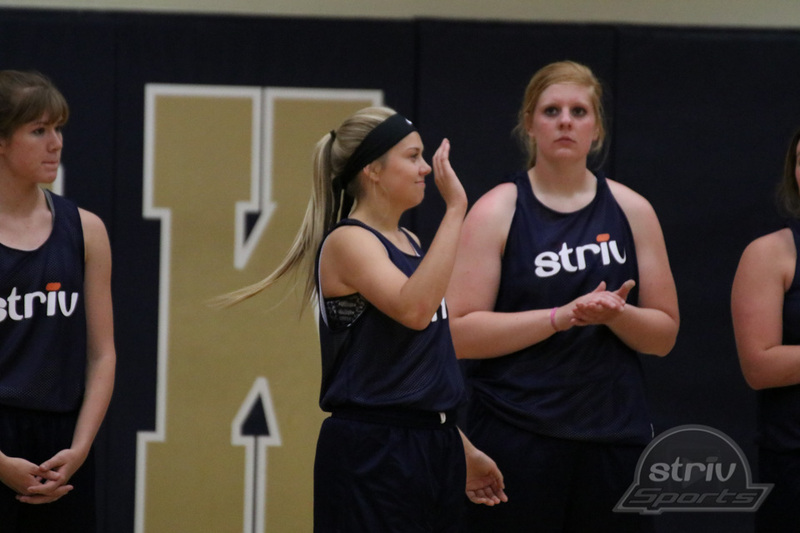 Behlke’s Blue Team will be led by a pair of DCS seniors in Aubrey Fredrick and Emily Jones. 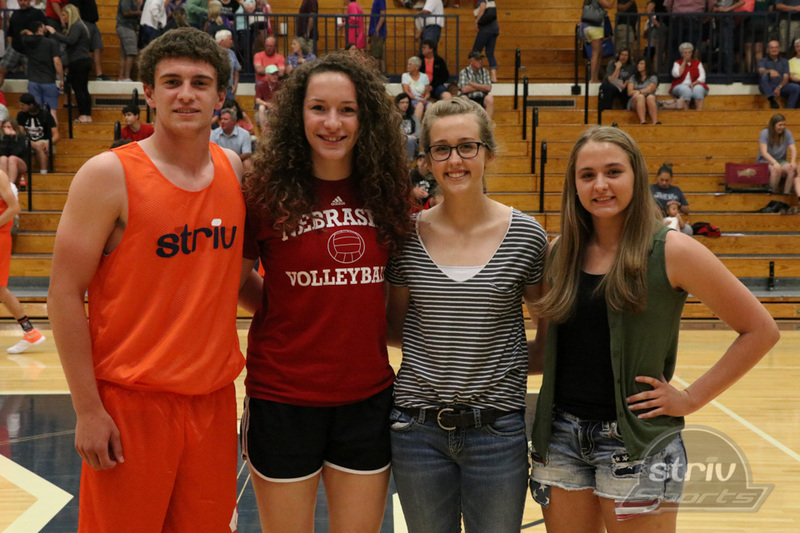 Fredrick will play volleyball at Hastings College while Jones has signed to play basketball at Concordia. 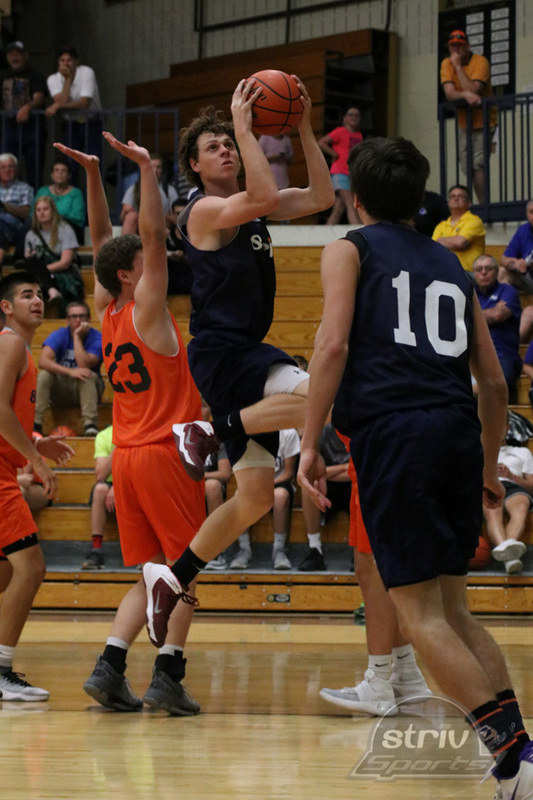 Polacek will have Class C-2 all-state selection Sam Brester to lead his team. 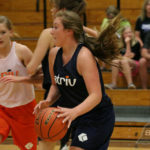 Also on the Orange Team is Lincoln Christian standout and Weber State volleyball recruit Ashlyn Power. 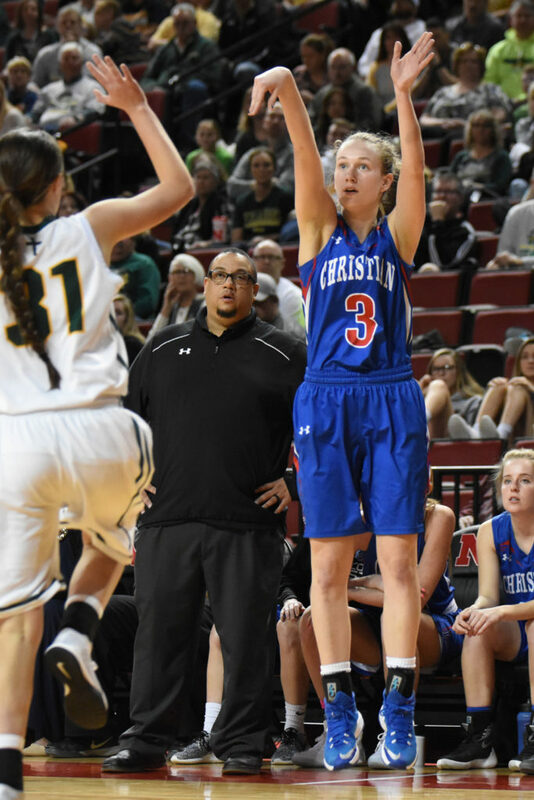 Lincoln Christian’s Ashlyn Power helped lead the Crusaders to the C1 Championship. 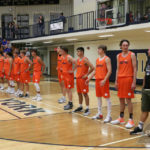 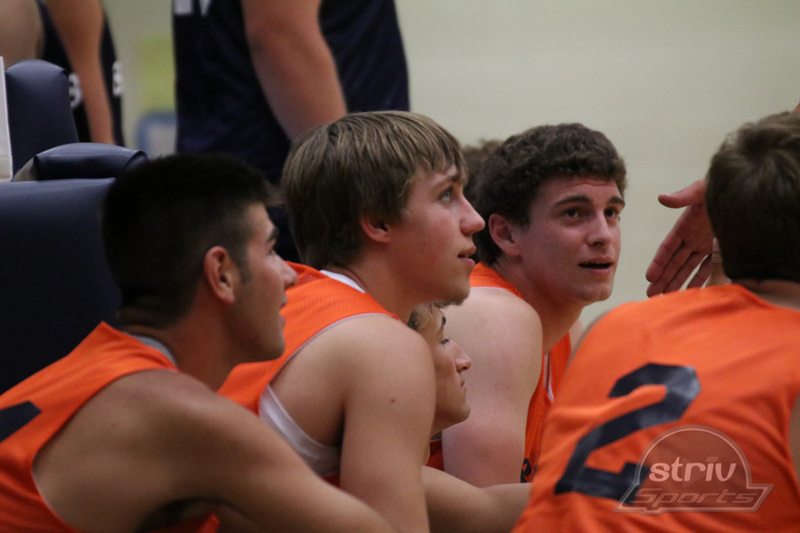 Orange: Kyle Leafty (Falls City), Chase Konert (Alma), Dylan McKee (Malcolm), Miles Griffith (St. Paul), Trey Stutheit (Johnson-Brock), Jonah Micek (St. Edward), David Wingett (Winnebago), Drake Gorrin (Winnebago), Garrett Whitley (Fillmore Central), Nate Grossnicklaus (Shelby/Rising City), Tanner Lierman (Northwest), Cole Eggert (Elmwood-Murdock). 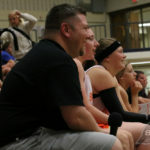 Coach: Jeff Berridge, Winnebago. 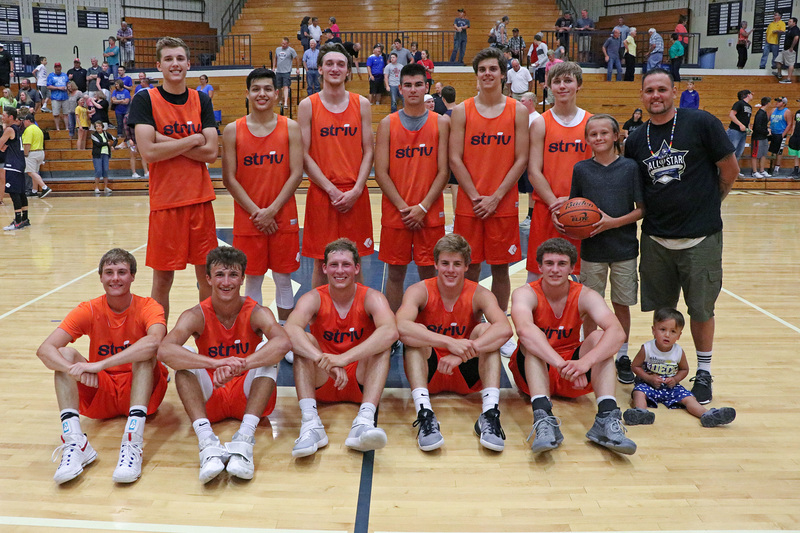 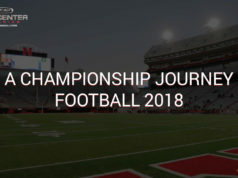 Blue: Preston Connelly (Twin River), Justin Heine (Centennial), Preston Stuhr (Centennial), Brady Dreamer (Elmwood-Murdock), Blaine Emerson (Cozad), Jaidon Policky (Milford), Devin Wagoner (Sutton), Rasmus Linnestad (Friend), Adam Hoarty (Fillmore Central), John Erwin (York), Monty Roberts (Syracuse), Kenny Wright (Cross County). 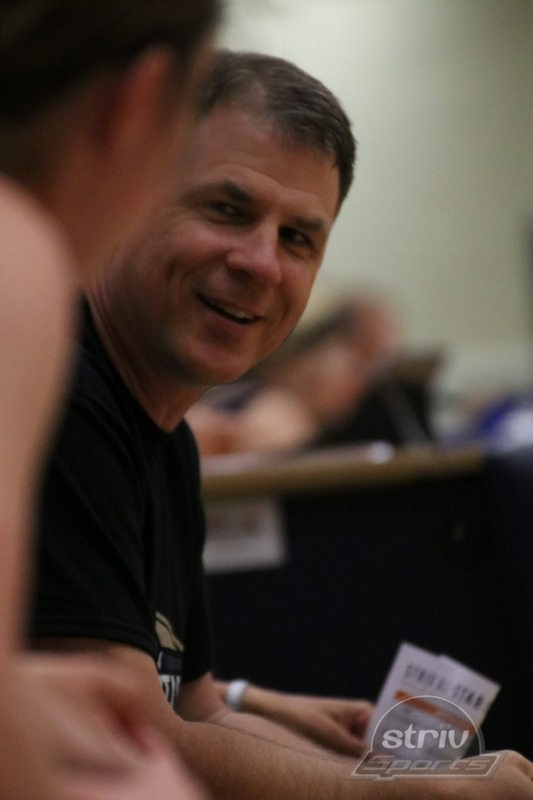 Coach: Cam Scholl, Centennial. 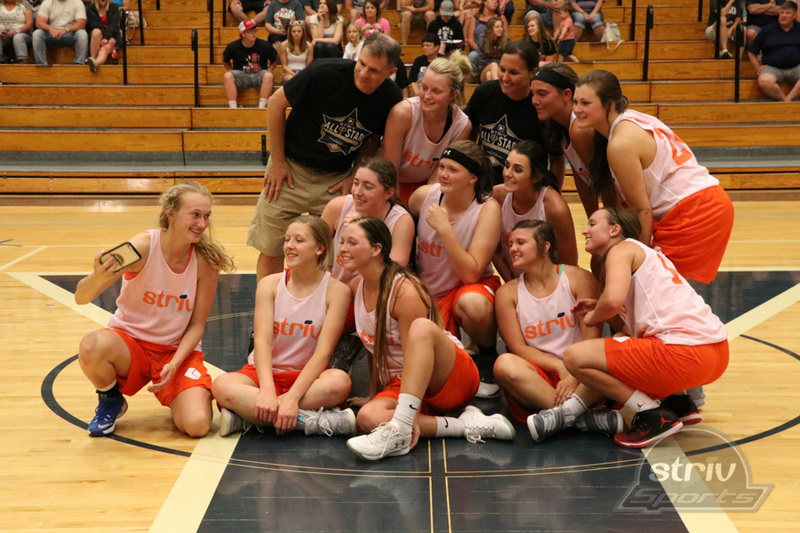 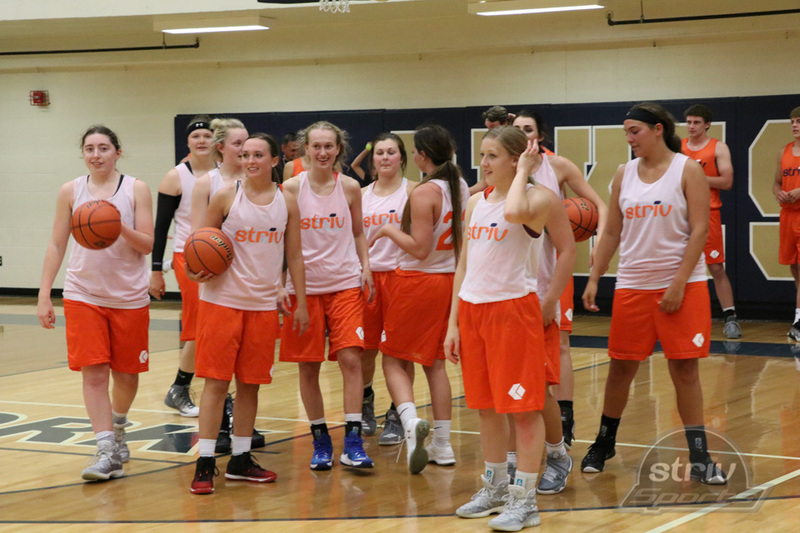 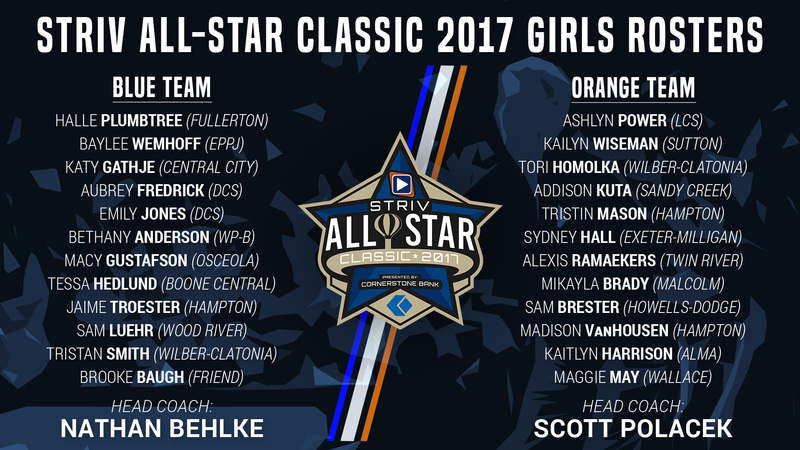 Orange: Ashlyn Power (Lincoln Christian), Kailyn Wiseman (Sutton), Tori Homolka (Wilber-Clatonia), Addison Kuta (Sandy Creek), Tristin Mason (Hampton), Sydney Hall (Exeter-Milligan), Alexis Ramaekers (Twin River), Mikayla Brady (Malcolm), Sam Brester (Howells-Dodge), Madison VanHousen (Hampton), Kaitlyn Harrison (Alma), Maggie May (Wallace). 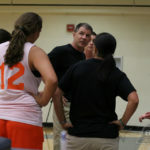 Coaches: Scott Polacek, Howells-Dodge. 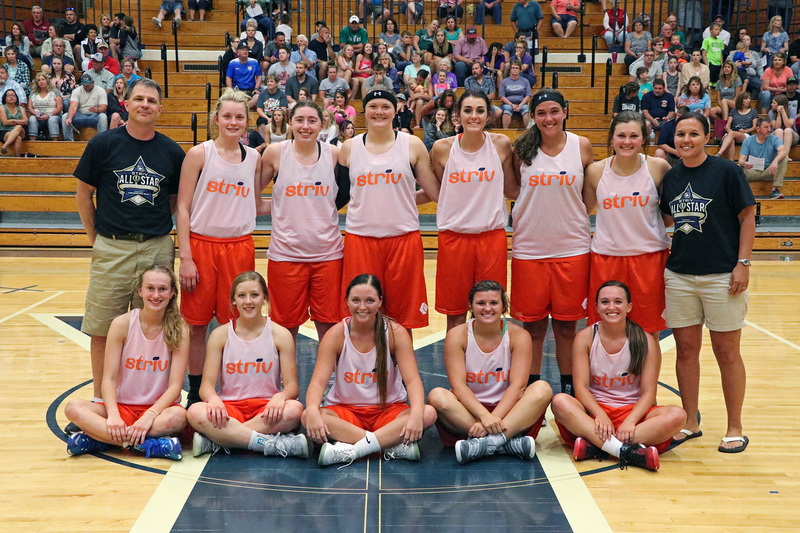 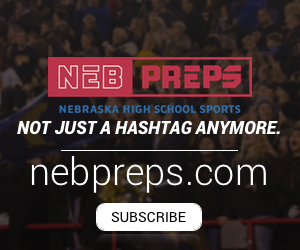 Blue: Halle Plumbtree (Fullerton), Baylee Wemhoff (Elgin/Pope John), Katy Gathje (Central City), Aubrey Fredrick (Dundy County-Stratton), Emily Jones (Dundy County-Stratton), Bethany Anderson (West Point-Beemer), Macy Gustafson (Osceola), Tessa Hedlund (Boone Central), Jaime Troester (Hampton), Sam Luehr (Wood River), Tristan Smith (Wilber-Clatonia), Brooke Baugh (Friend). 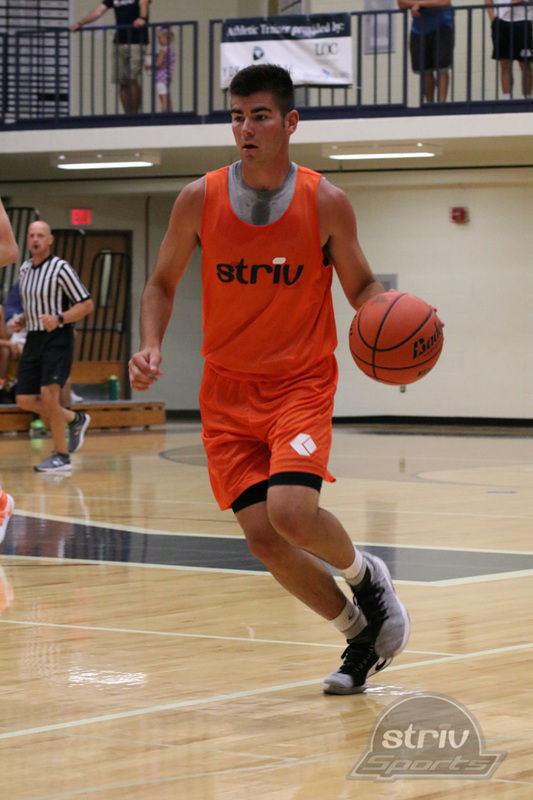 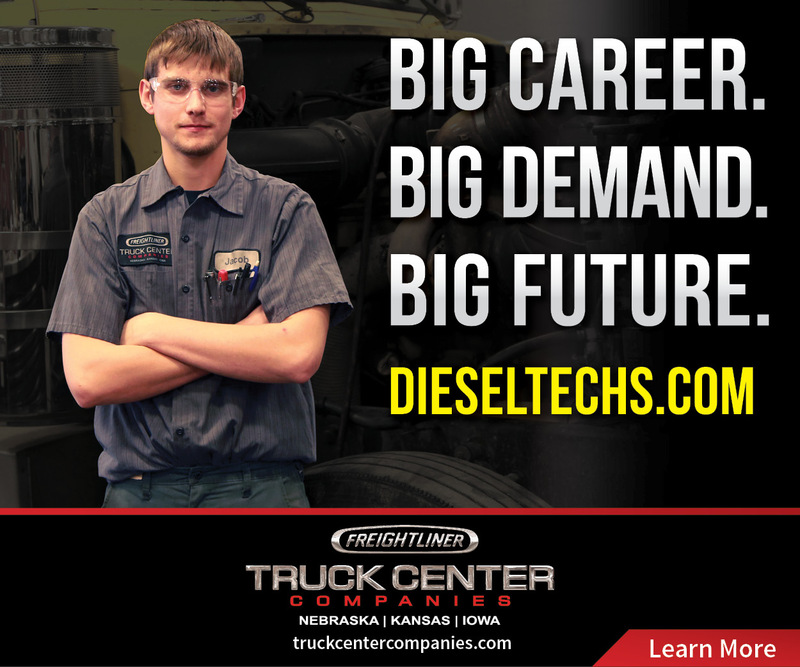 Coaches: Nathan Behlke, Dundy County Stratton.